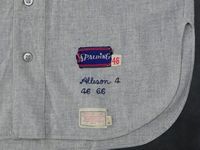 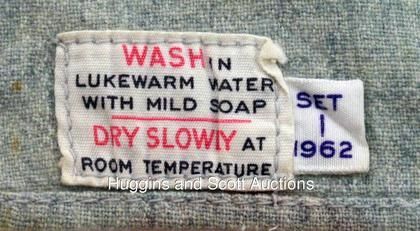 Cap buttons were red in the early years, I'm not sure exactly when they went to black, 1963 or 64. 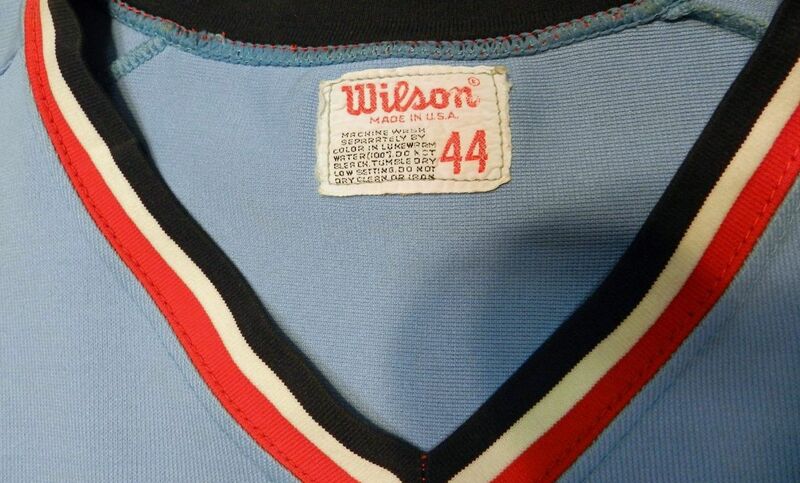 Probably an extra as it has no name in the collar. Double knit jerseys are here. 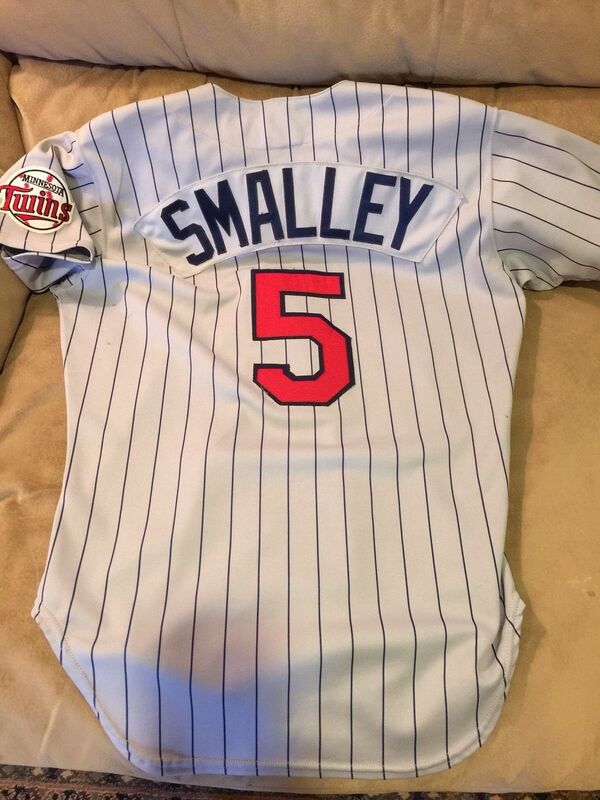 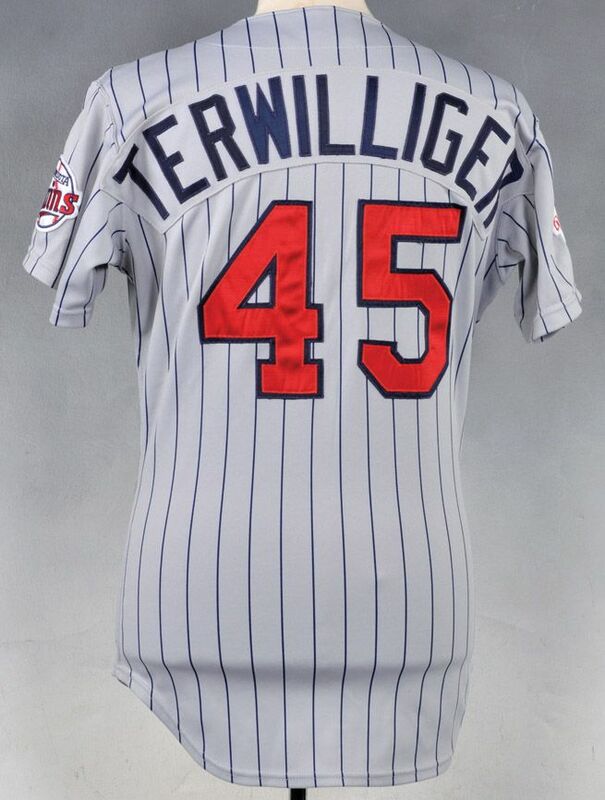 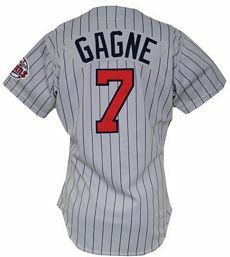 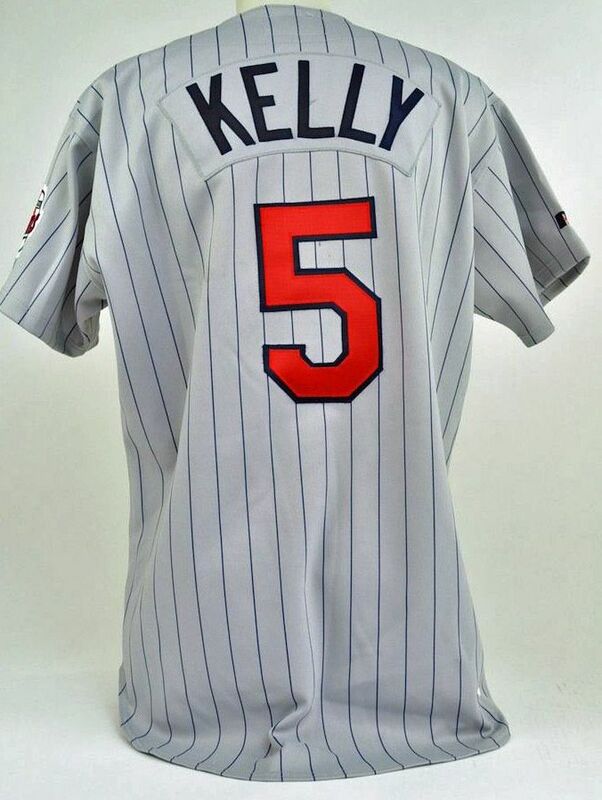 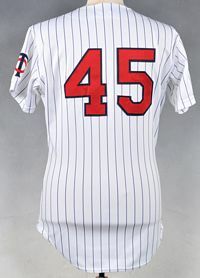 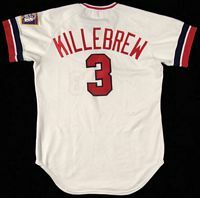 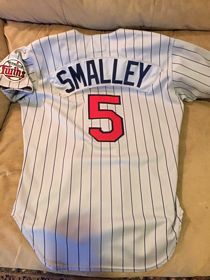 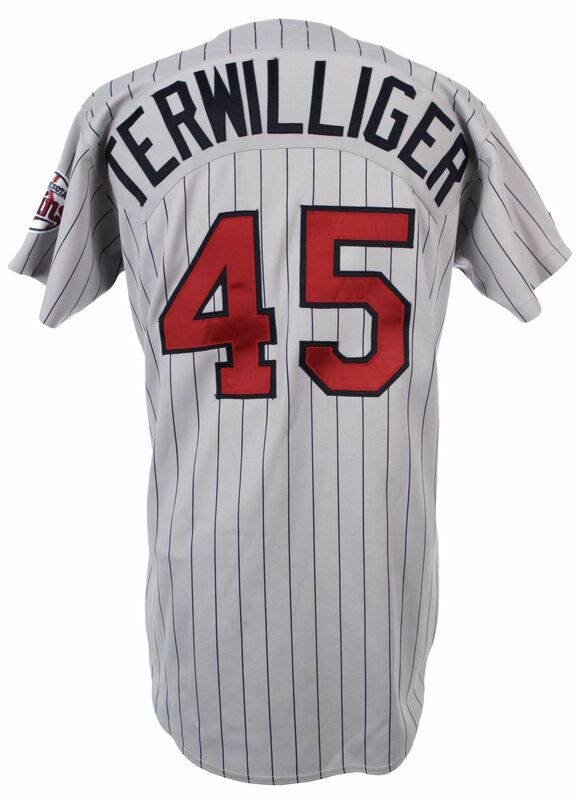 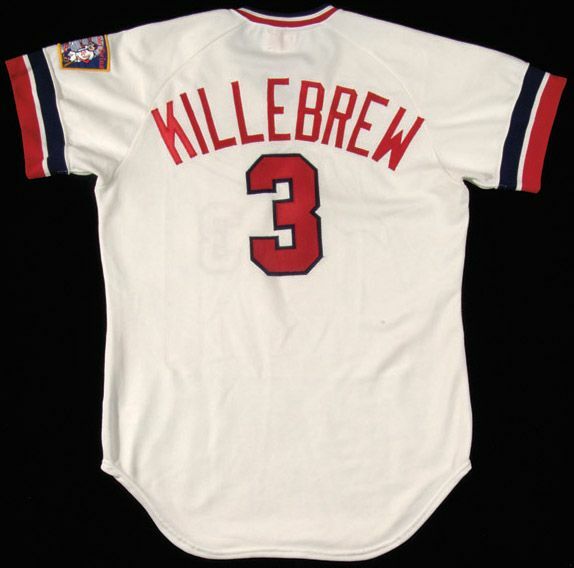 Lettering changes from navy with red trim to red with navy trim. 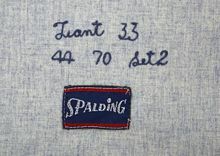 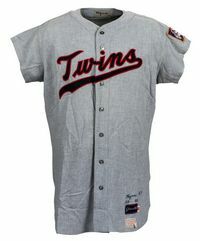 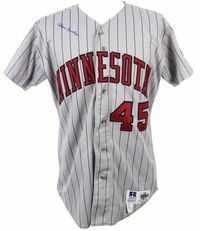 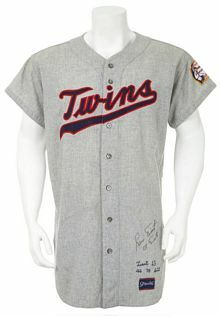 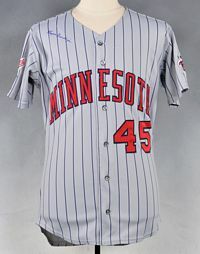 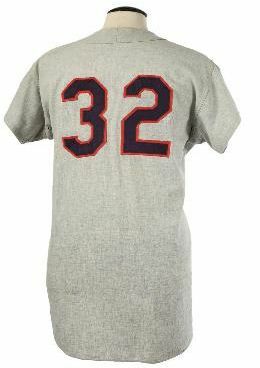 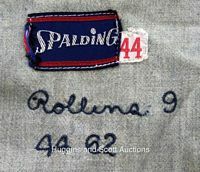 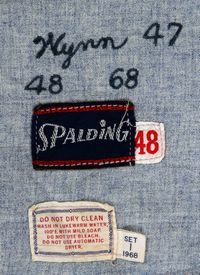 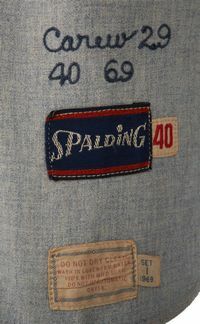 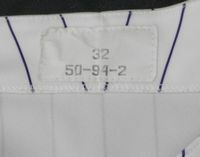 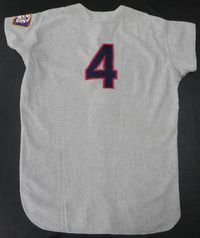 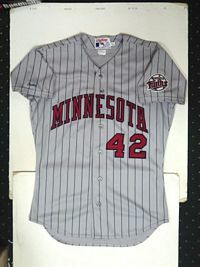 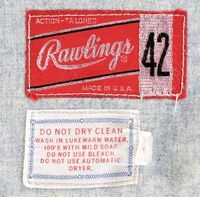 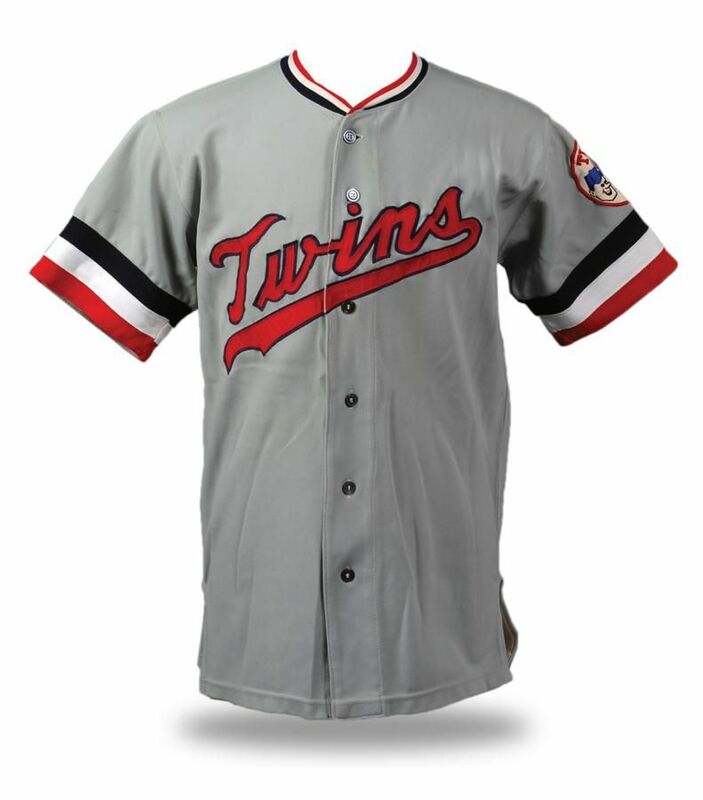 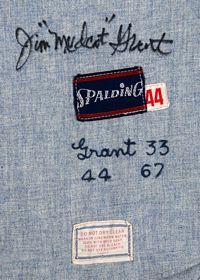 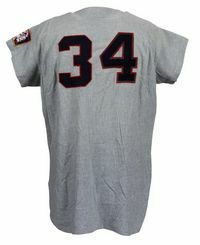 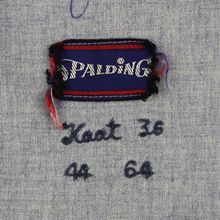 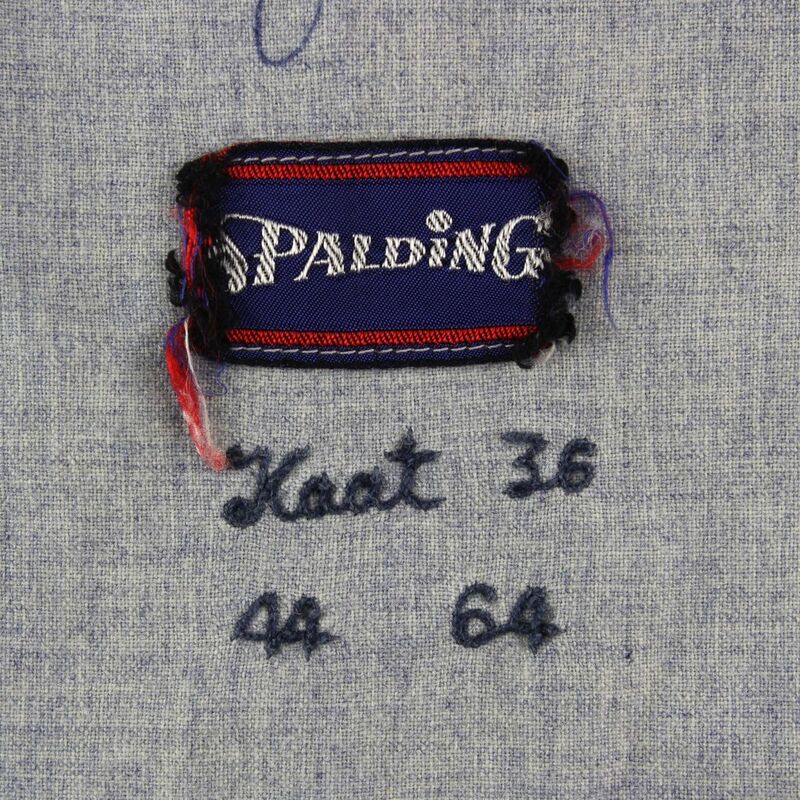 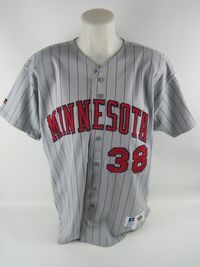 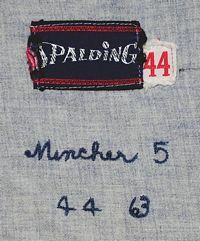 Grey road jersey has a unique one-year sleeve patch, and wider sleeve stripes as on all Spadling double knit jerseys. 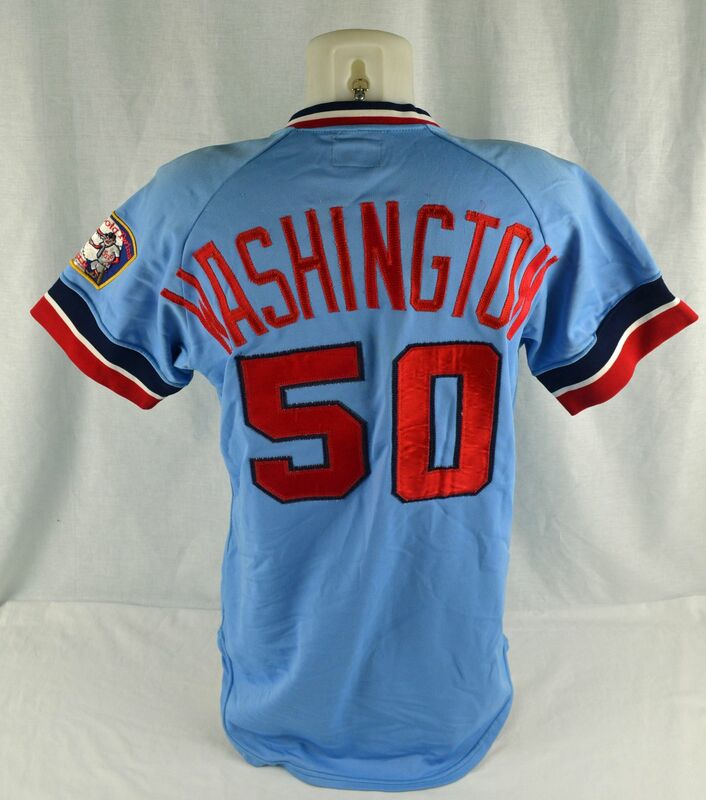 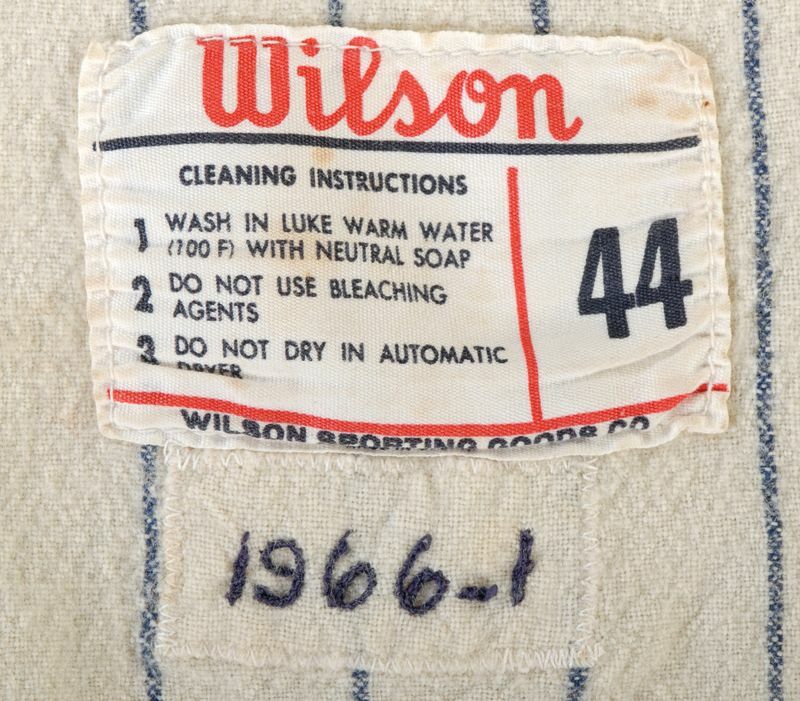 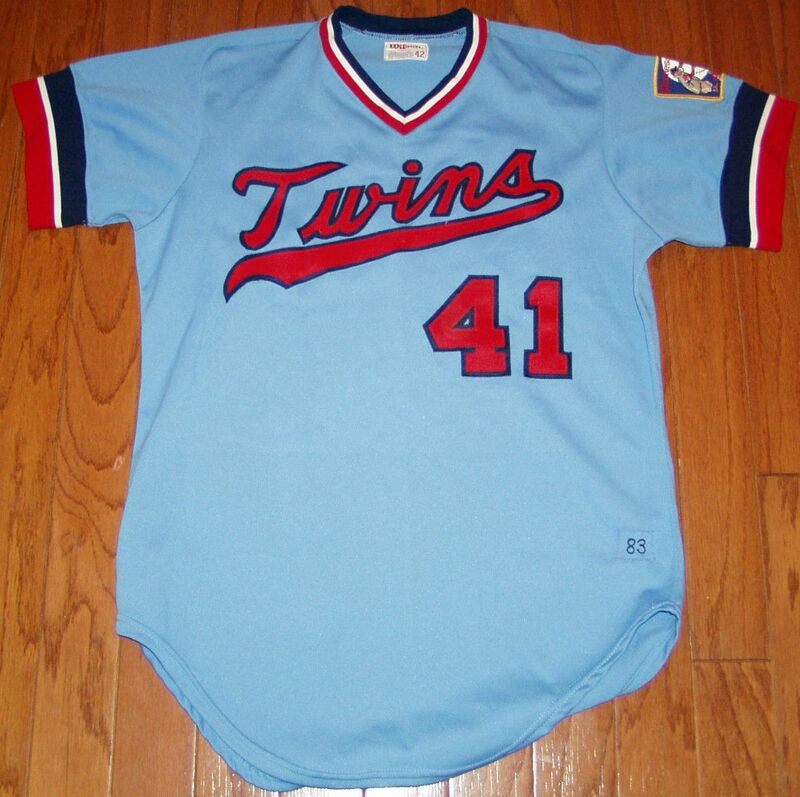 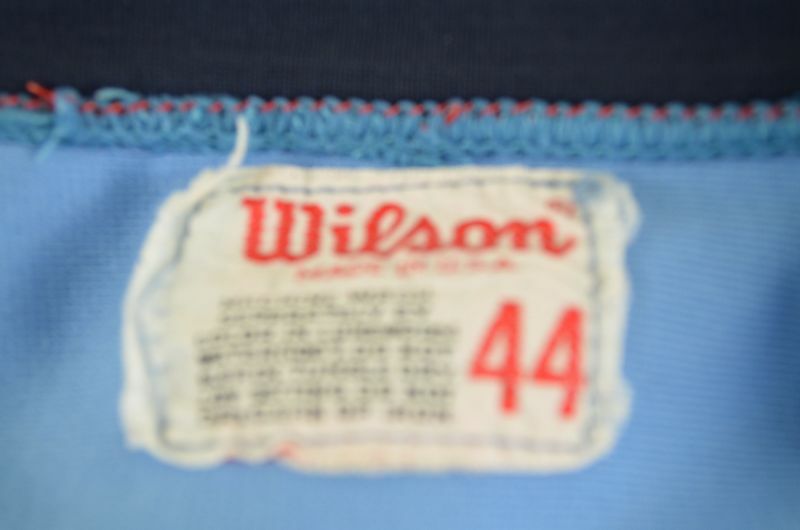 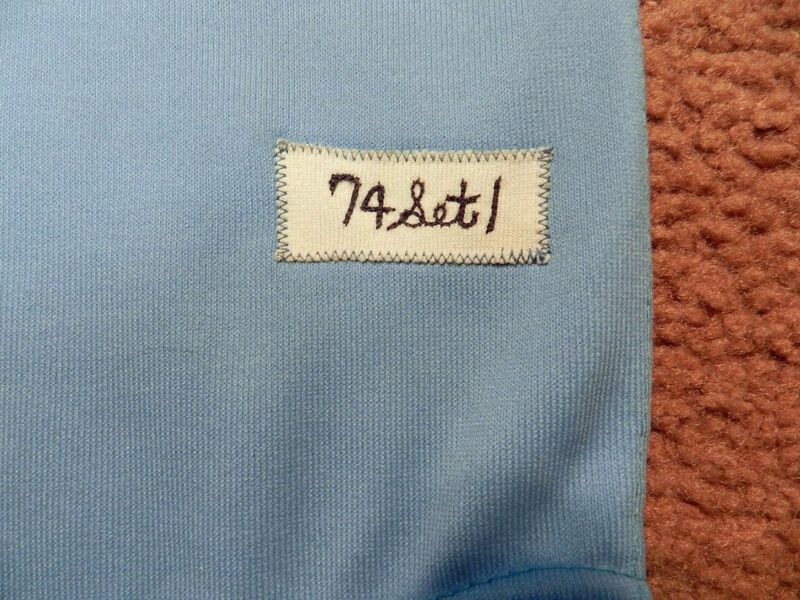 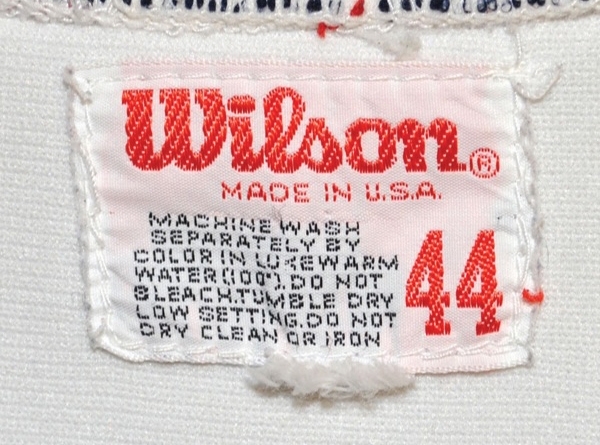 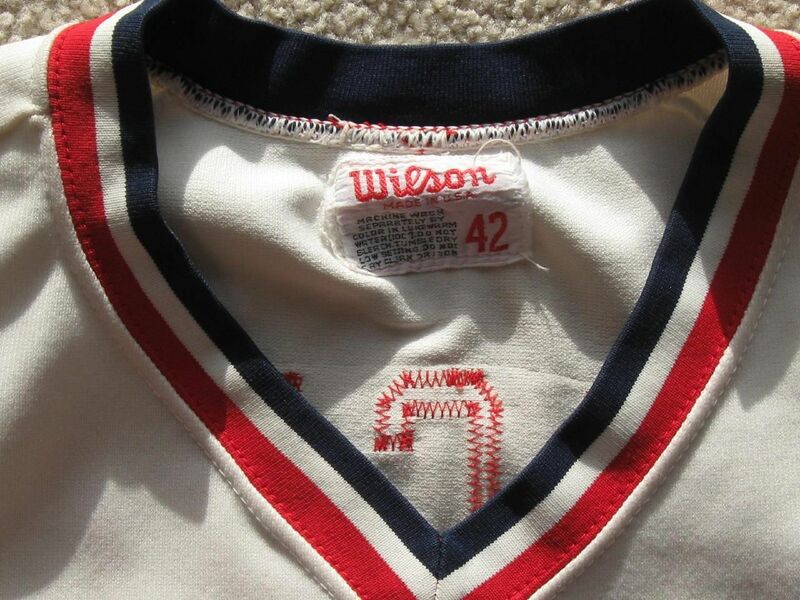 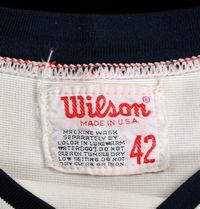 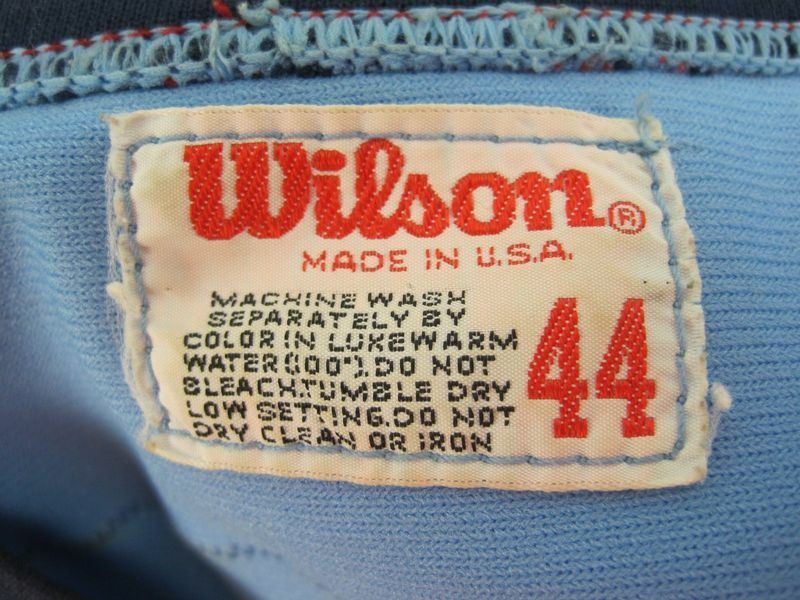 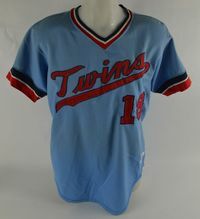 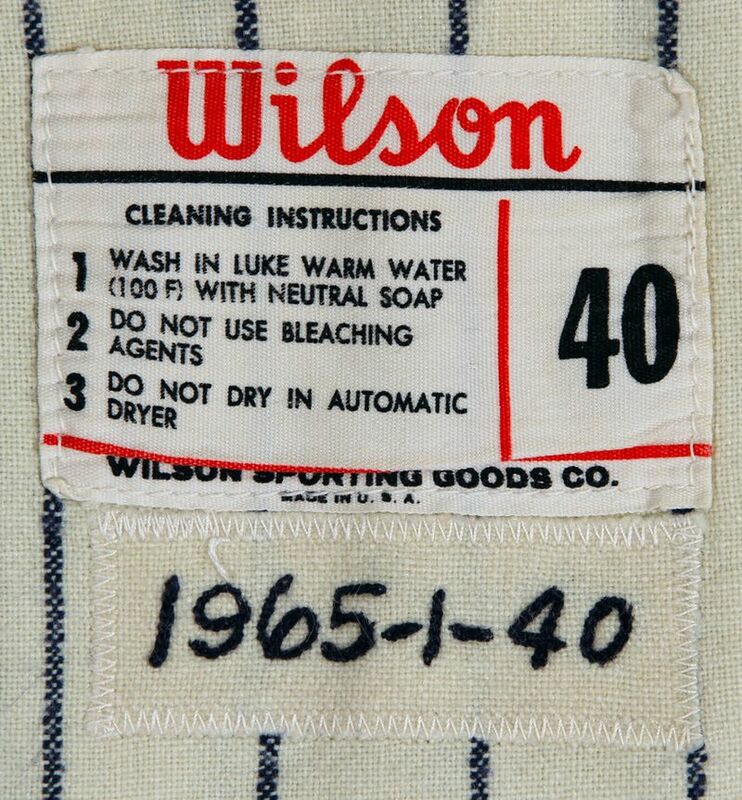 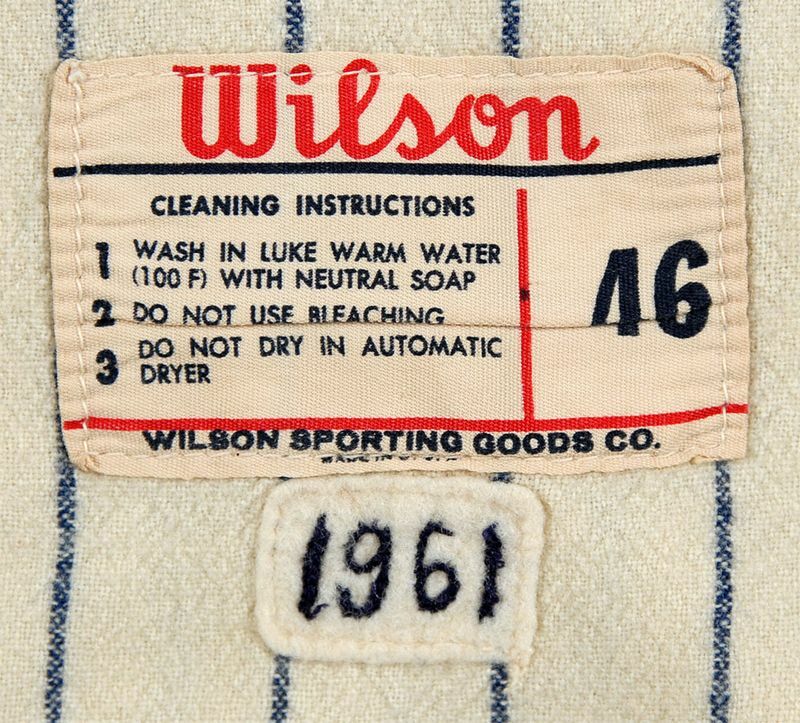 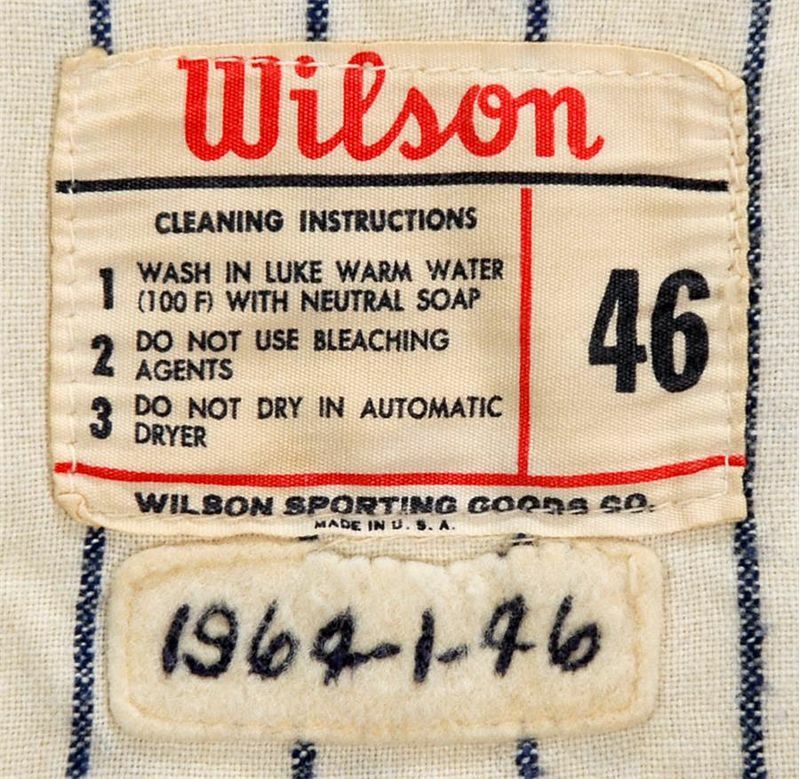 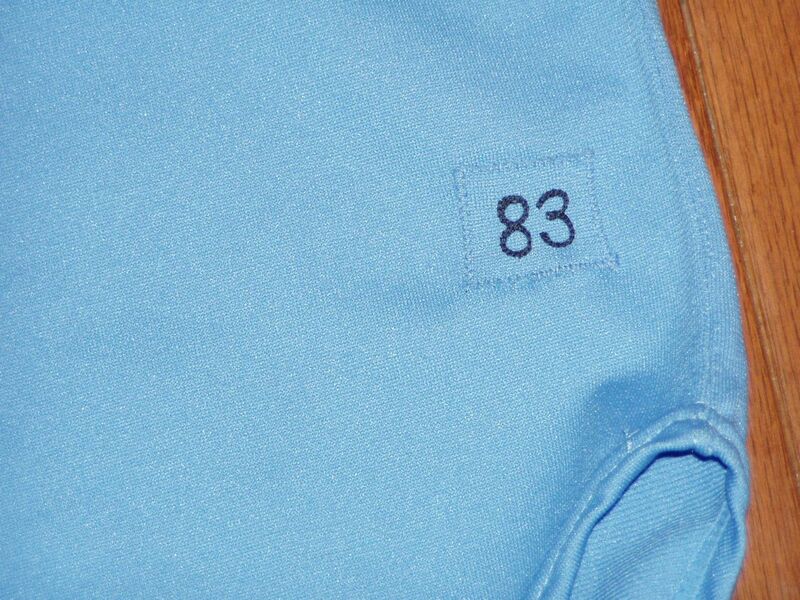 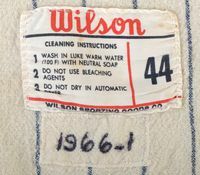 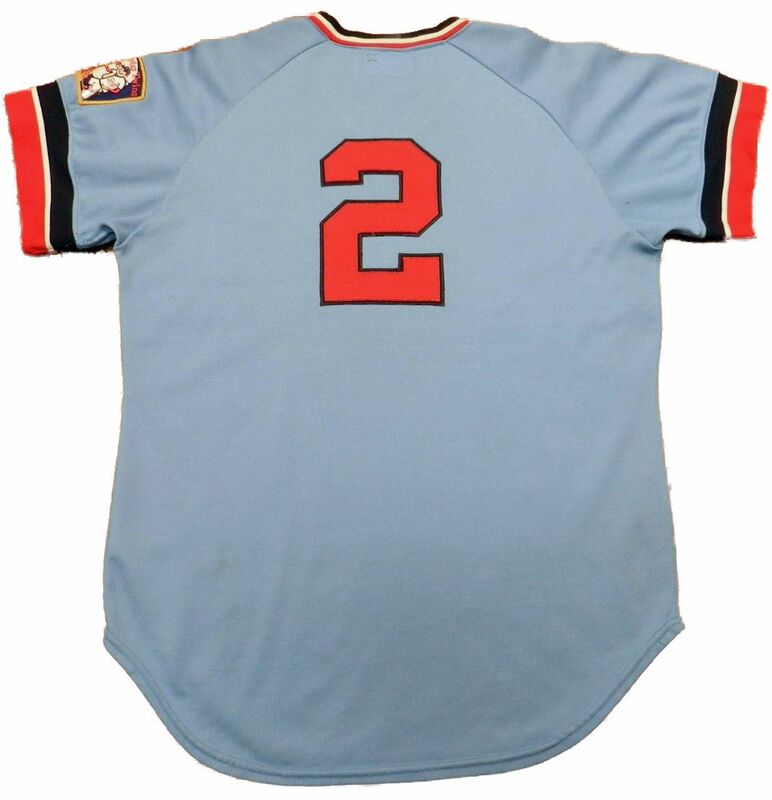 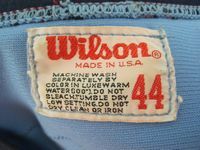 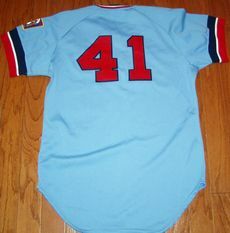 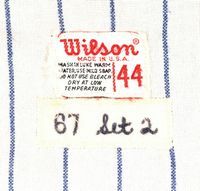 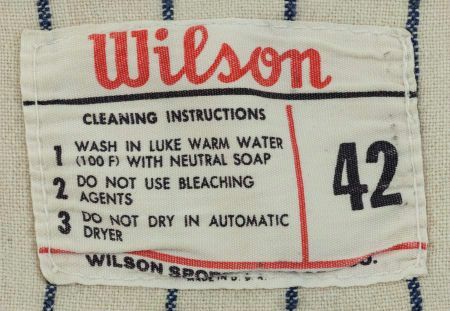 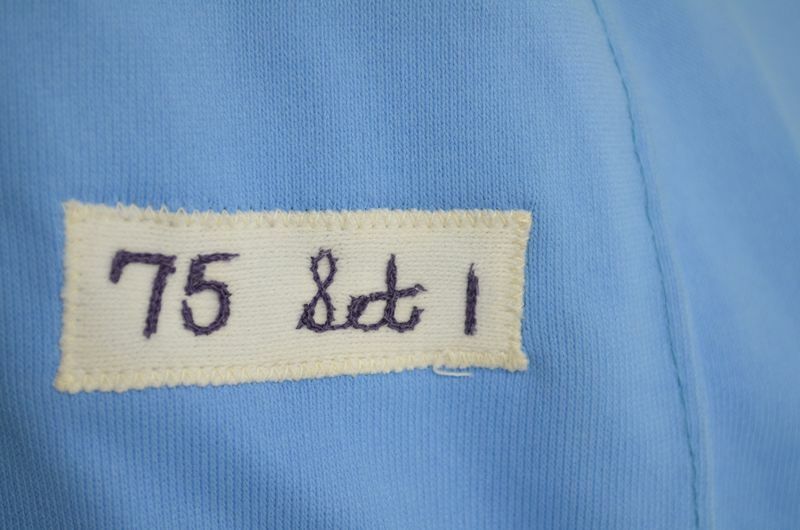 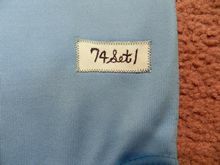 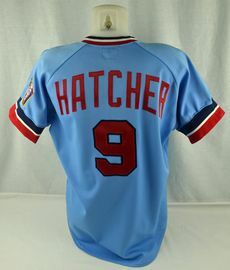 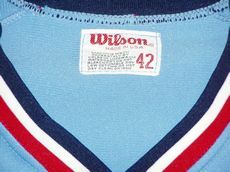 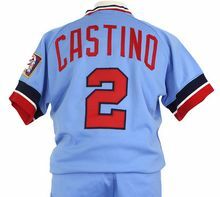 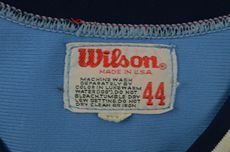 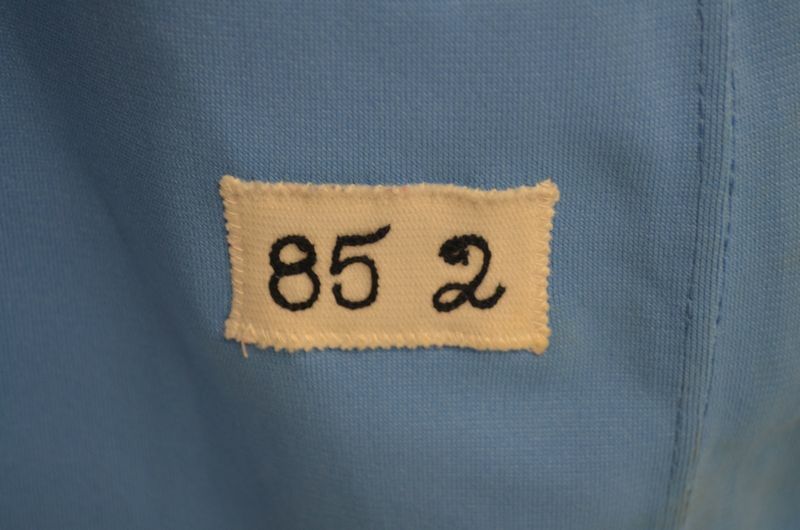 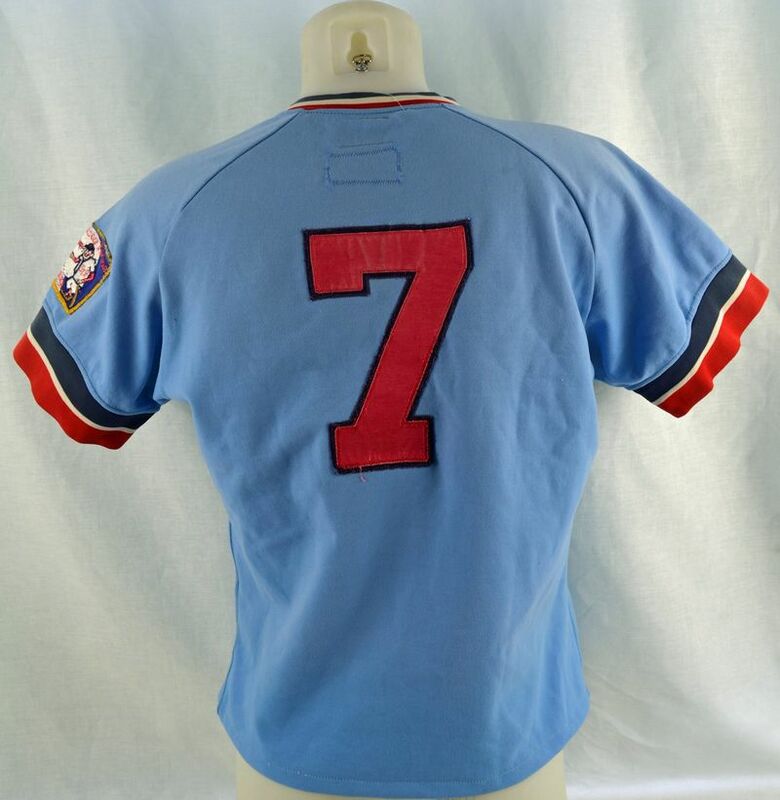 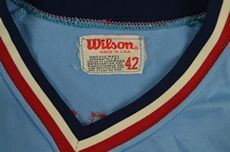 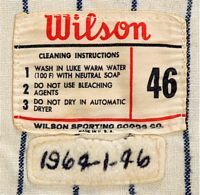 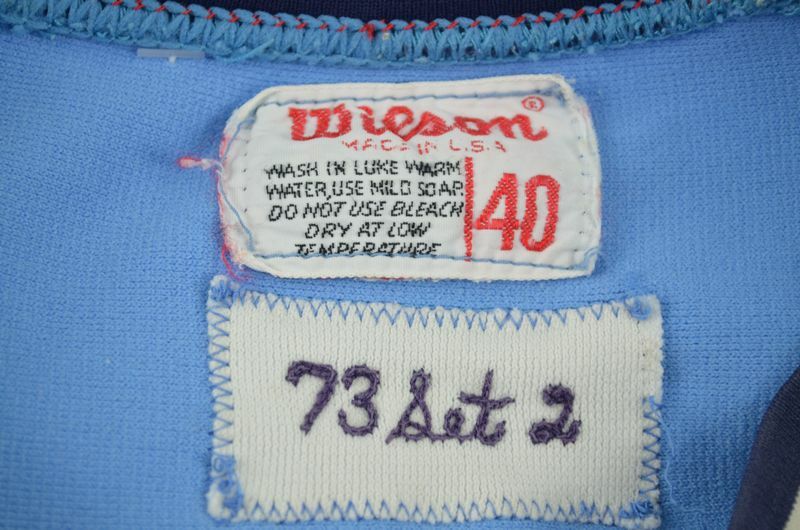 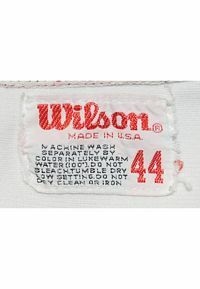 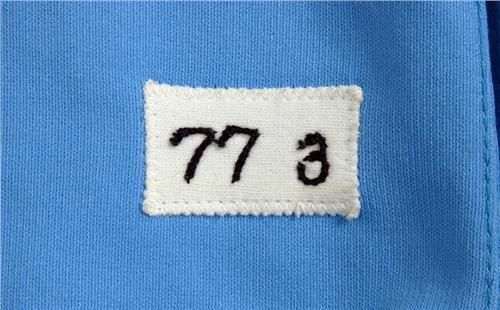 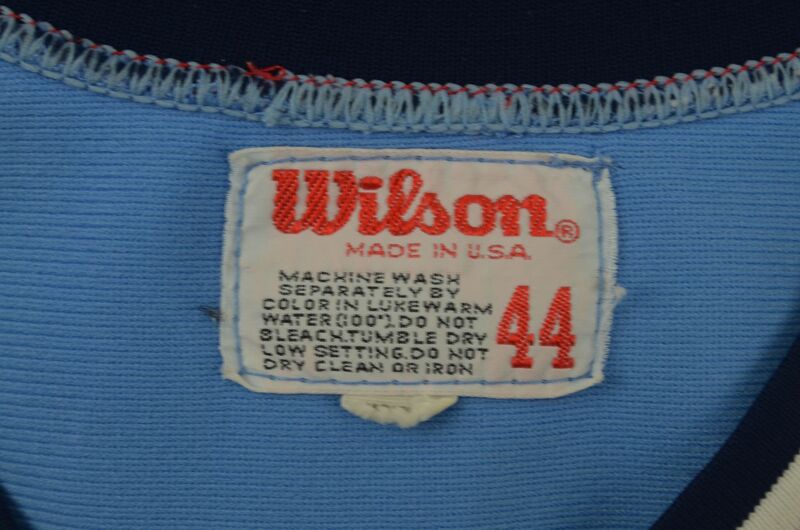 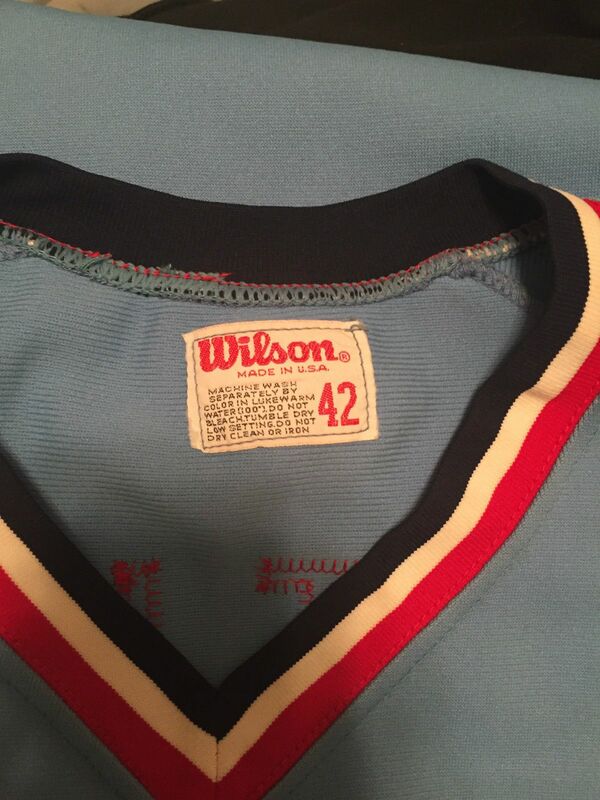 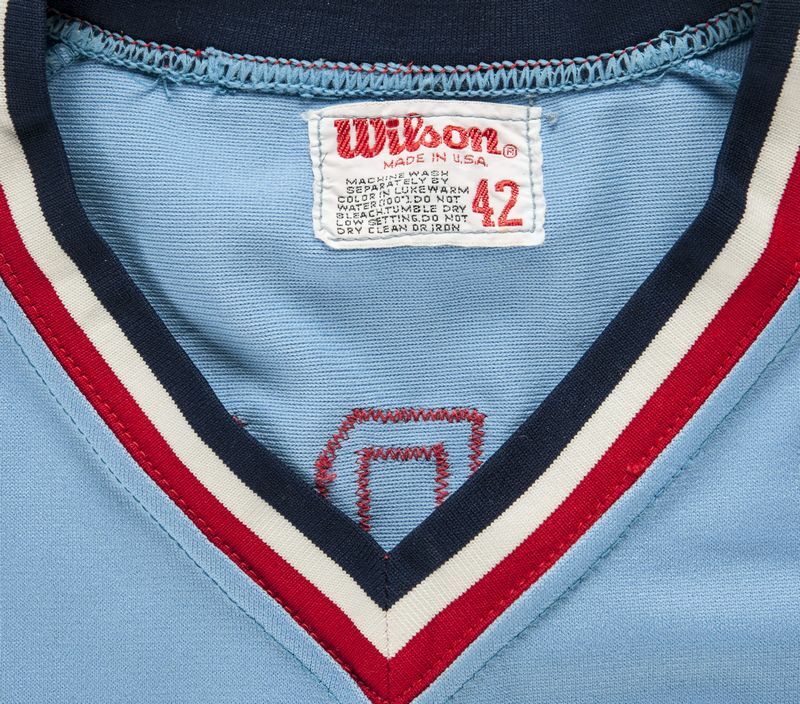 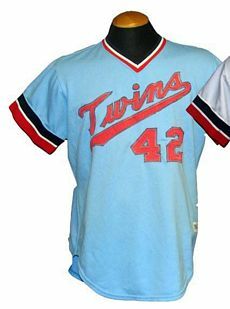 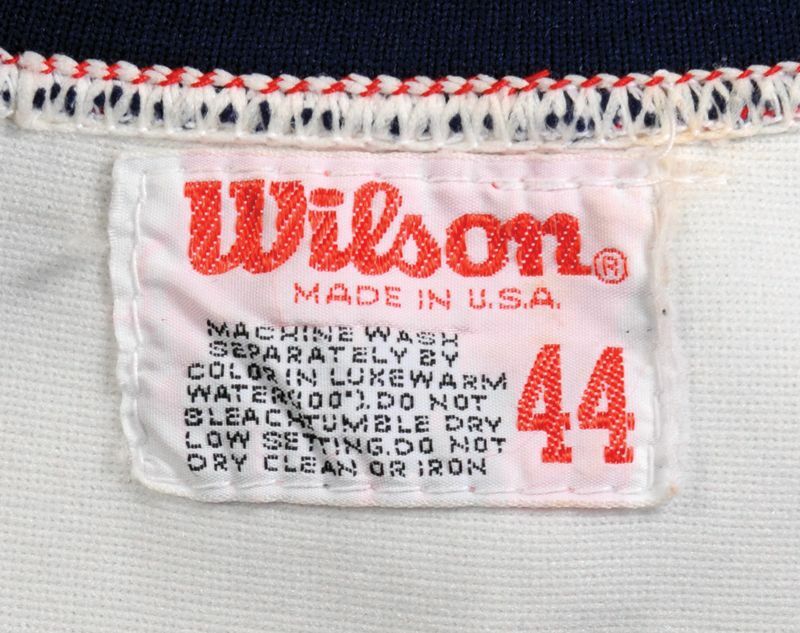 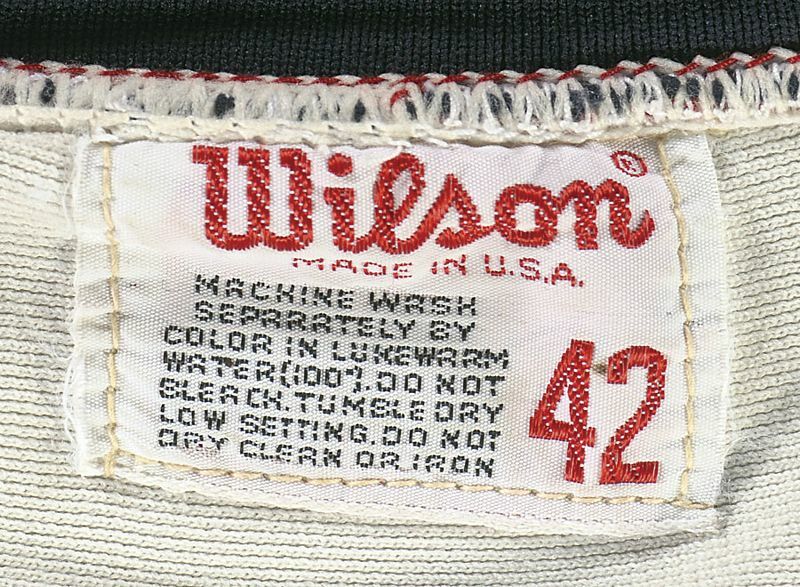 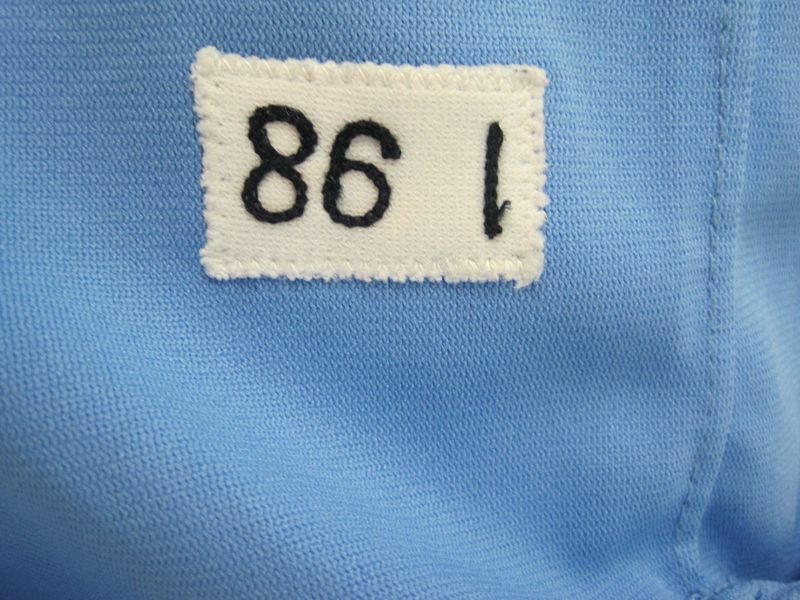 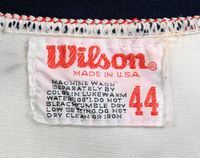 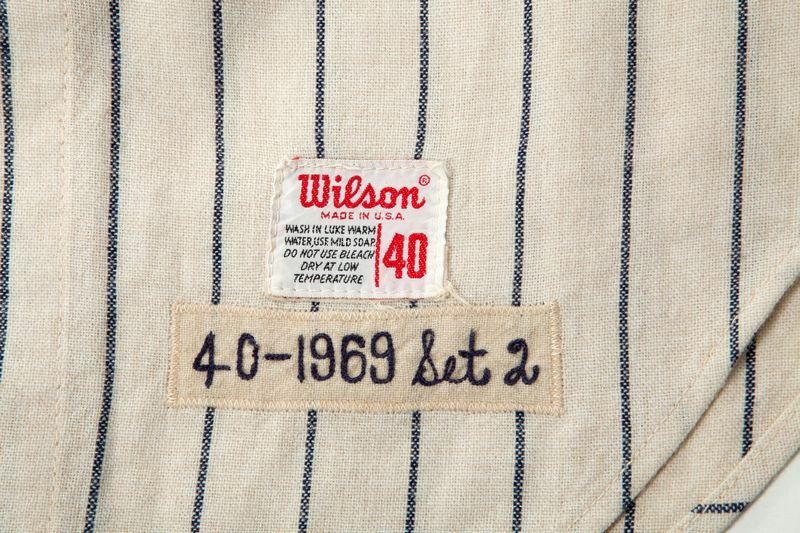 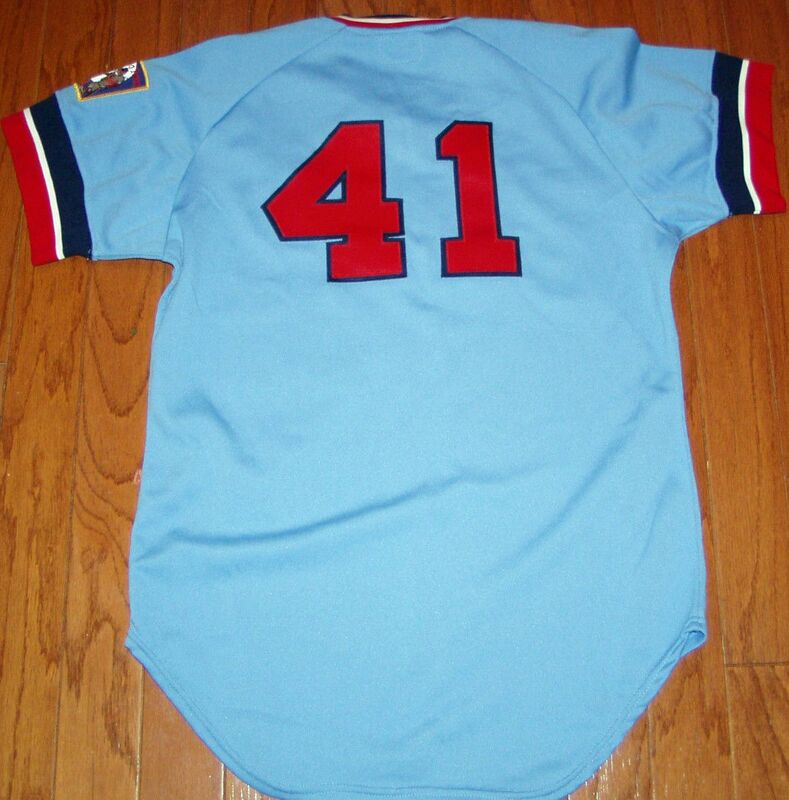 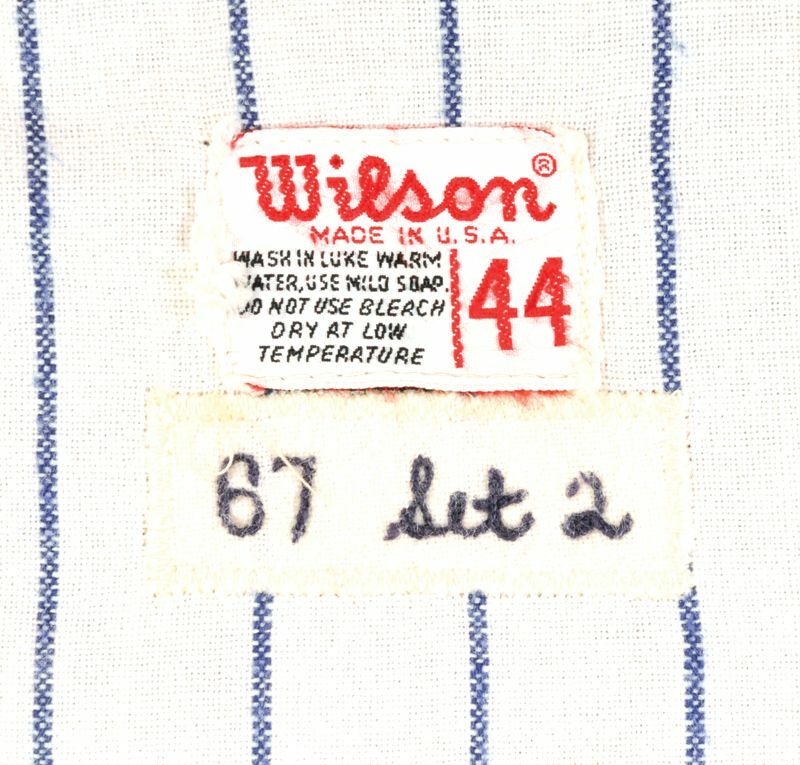 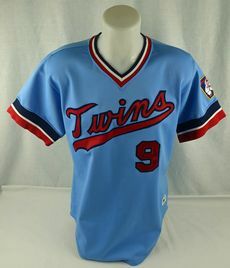 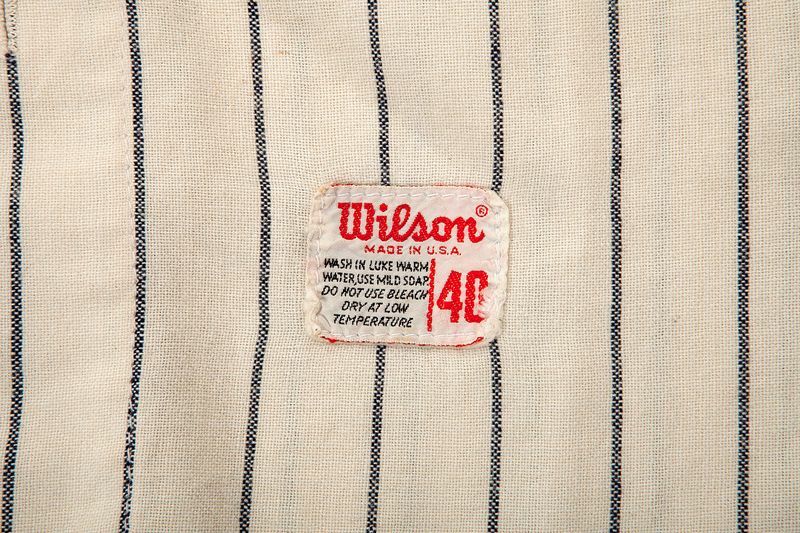 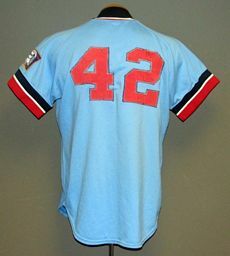 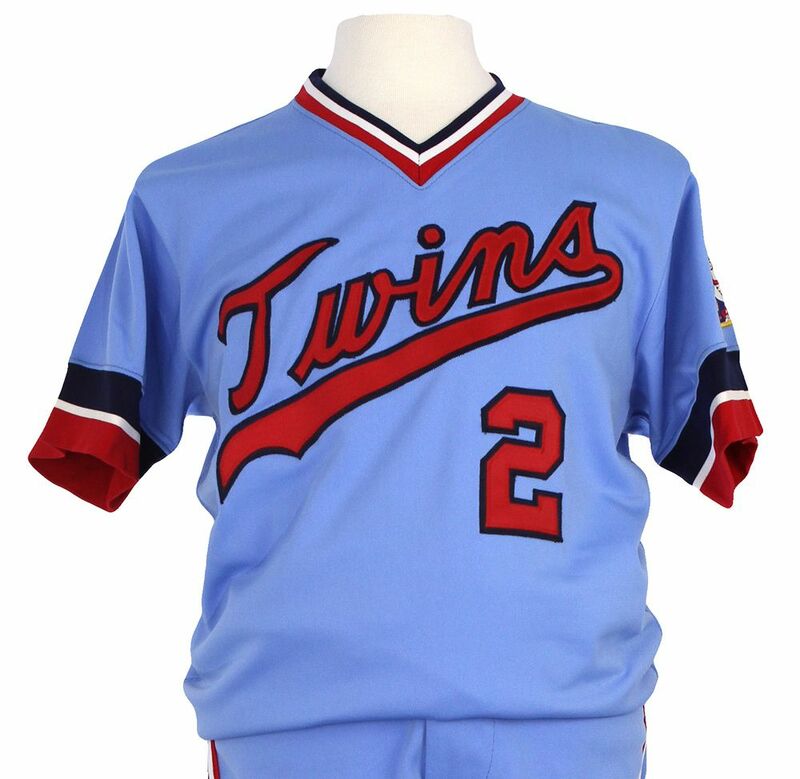 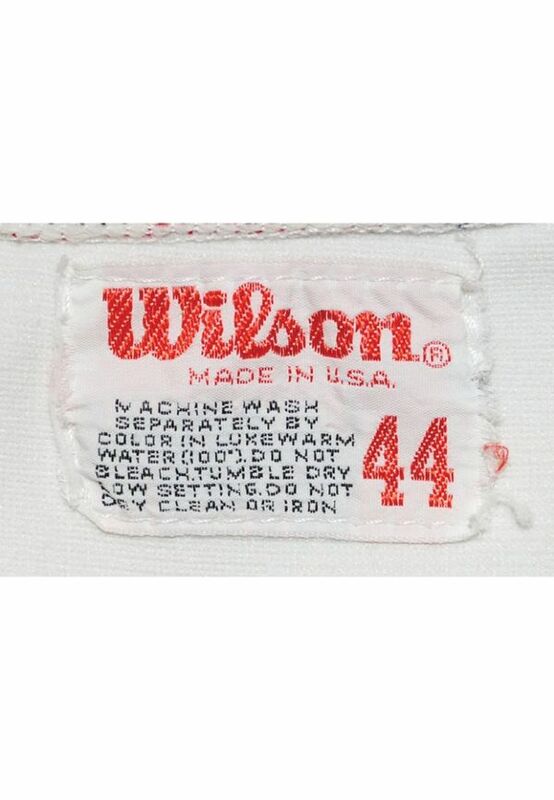 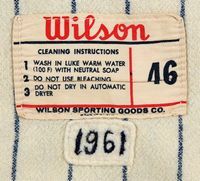 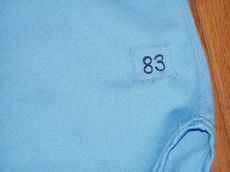 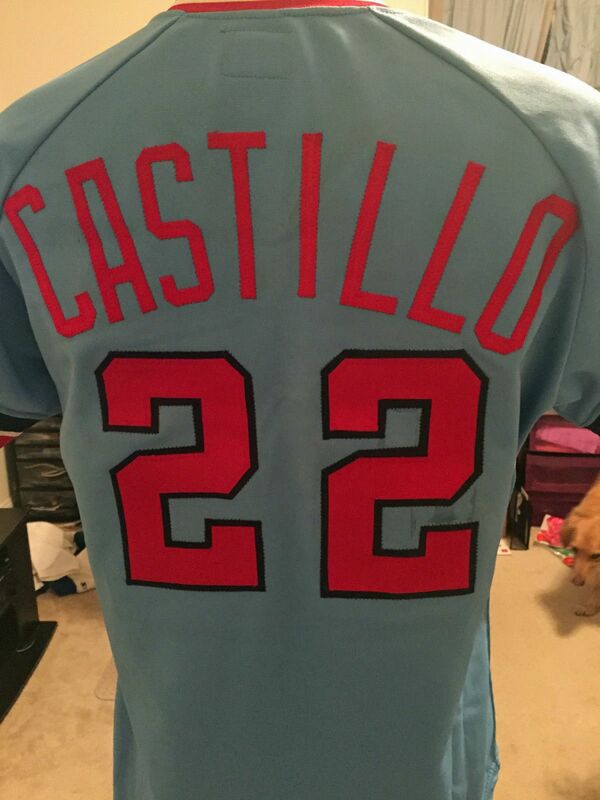 Road jersey, now made by Wilson, changes to a powder blue pullover with a front number. 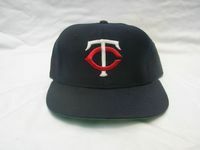 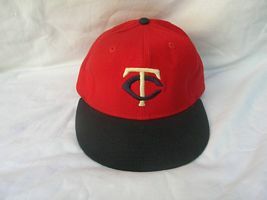 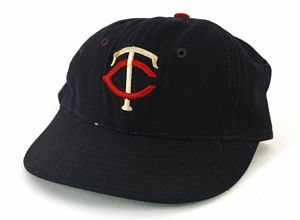 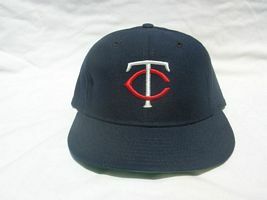 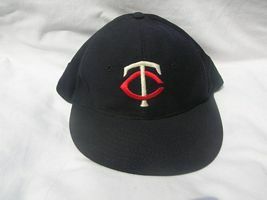 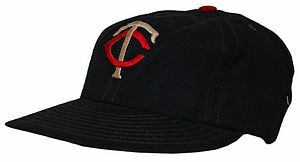 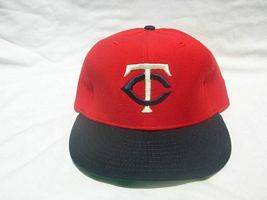 The top of the cap logo "T" becomes straight. 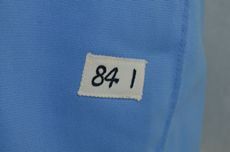 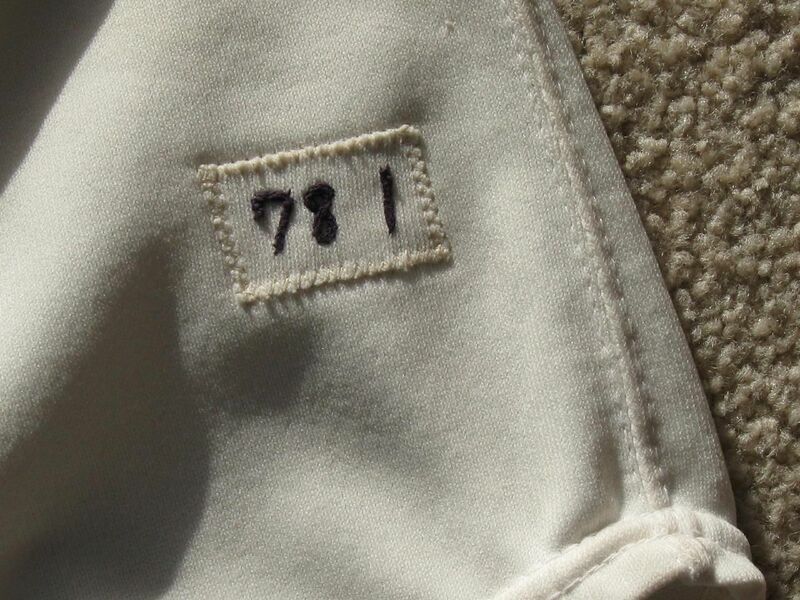 Home jersey changes to a pullover with front number. 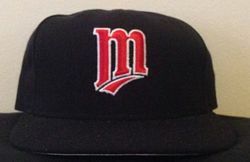 Home caps change to red. NOB is removed from home jerseys only. 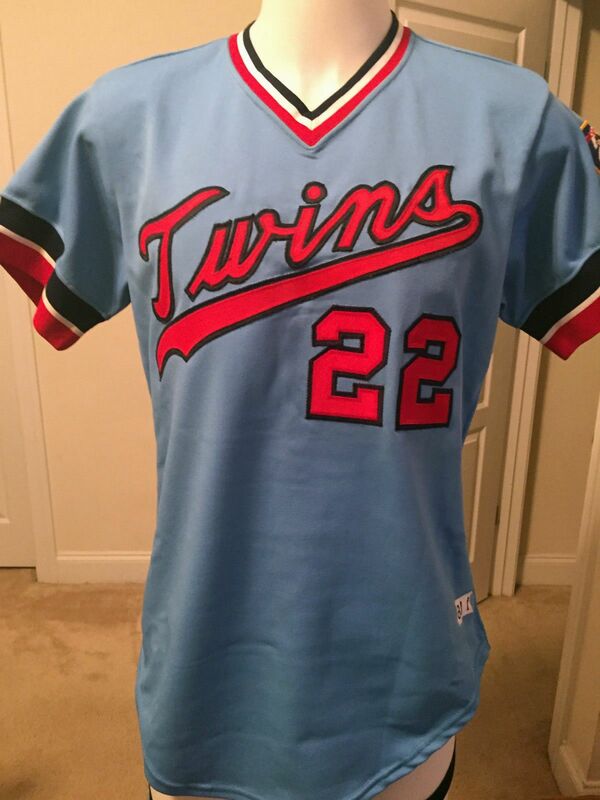 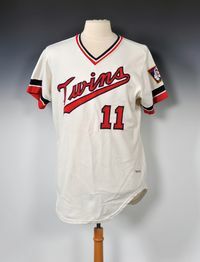 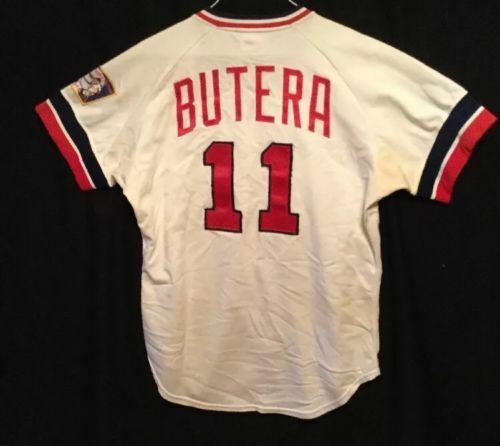 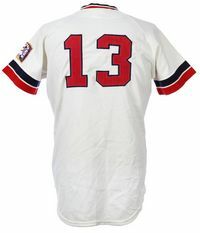 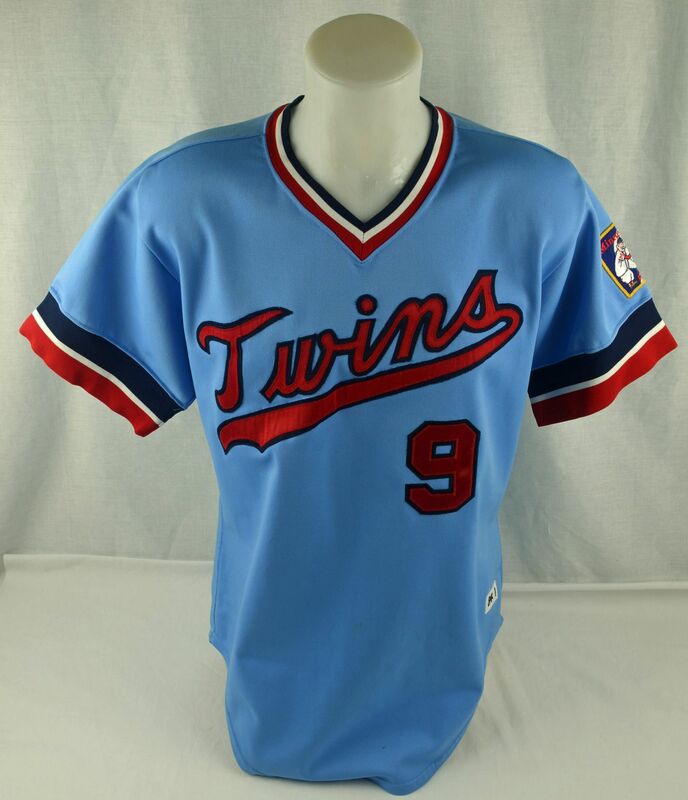 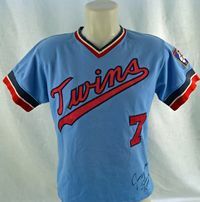 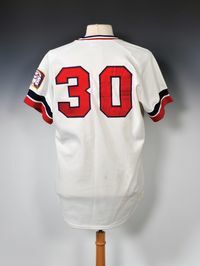 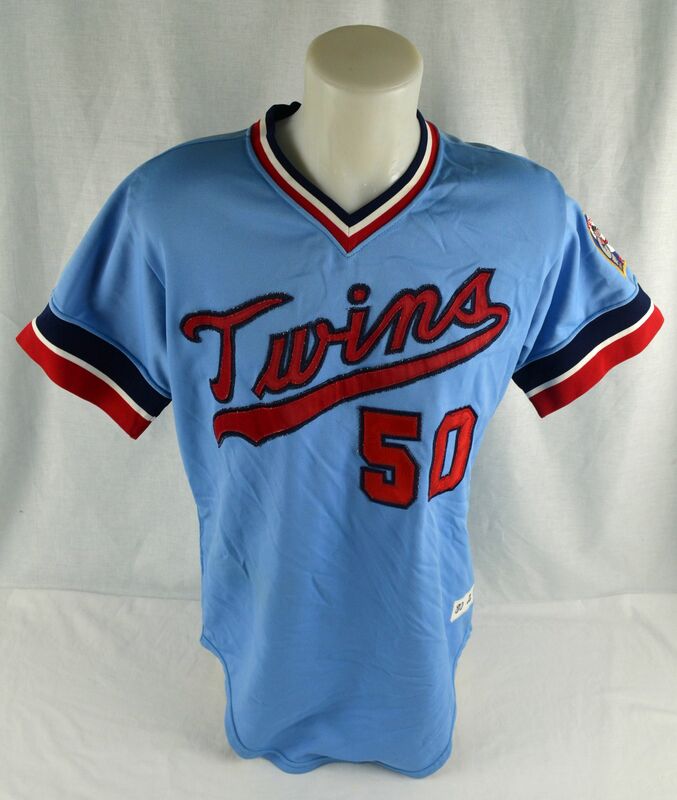 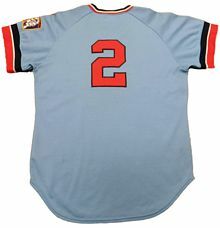 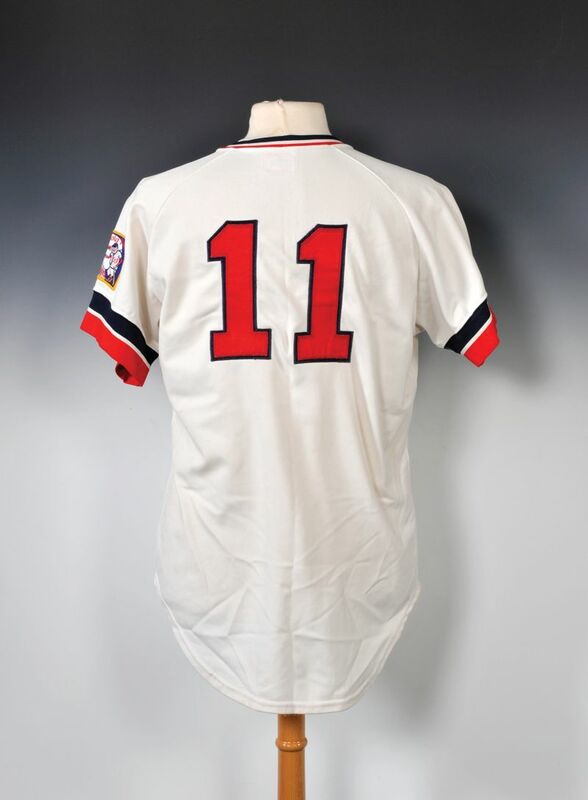 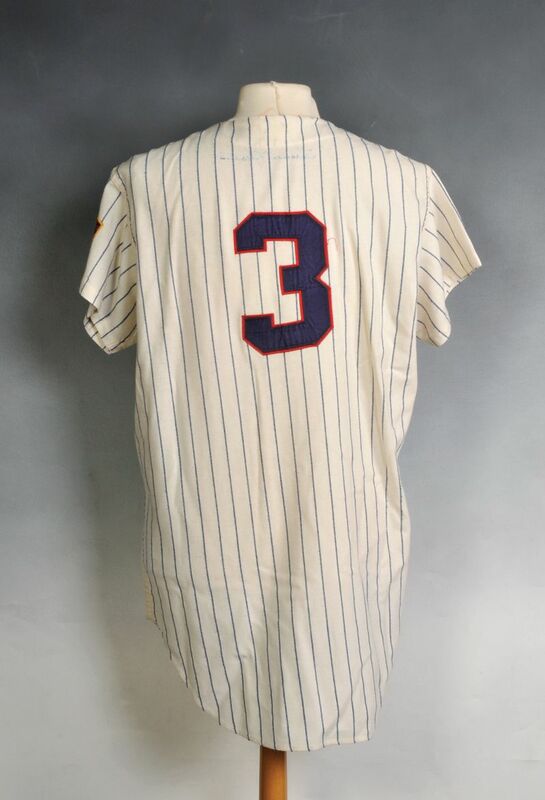 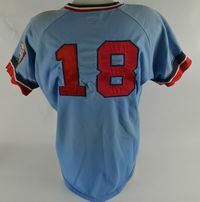 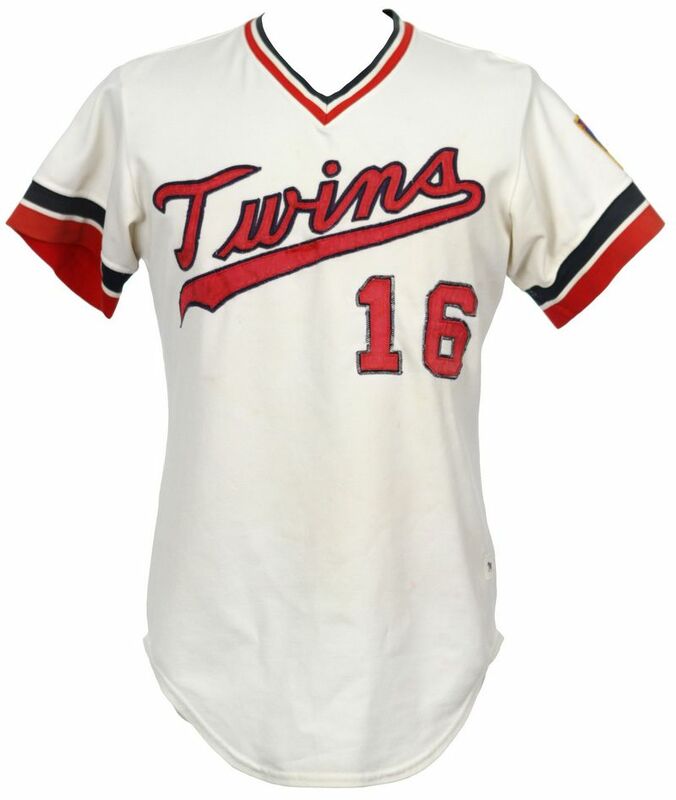 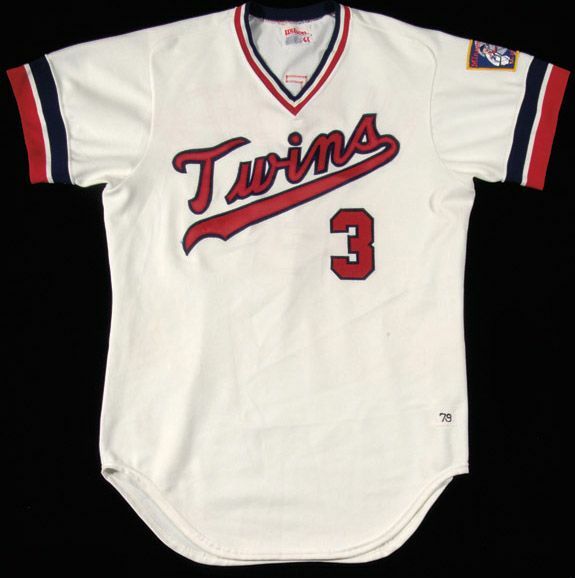 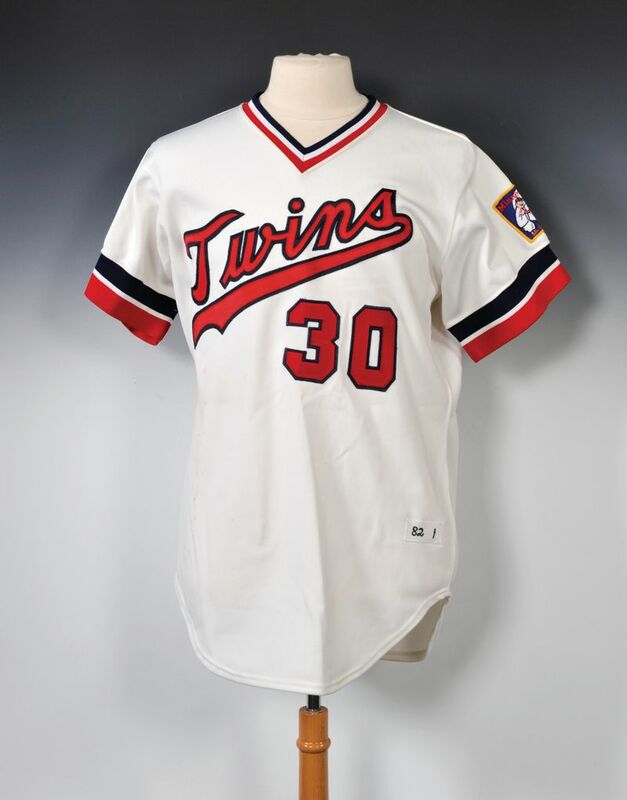 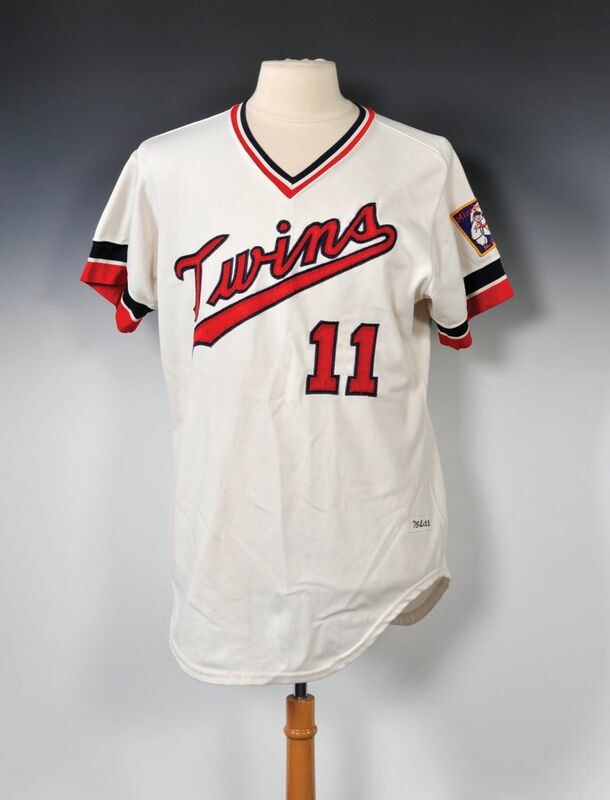 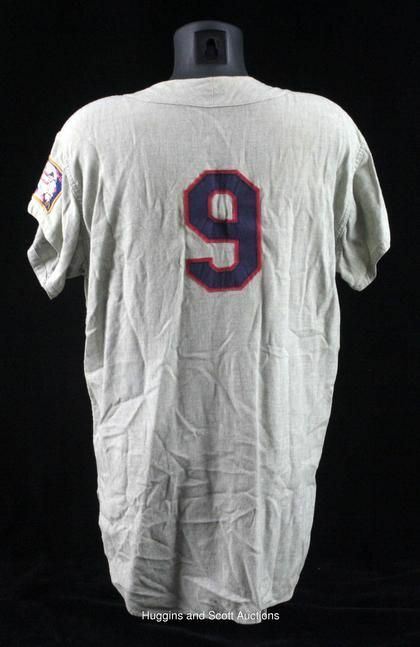 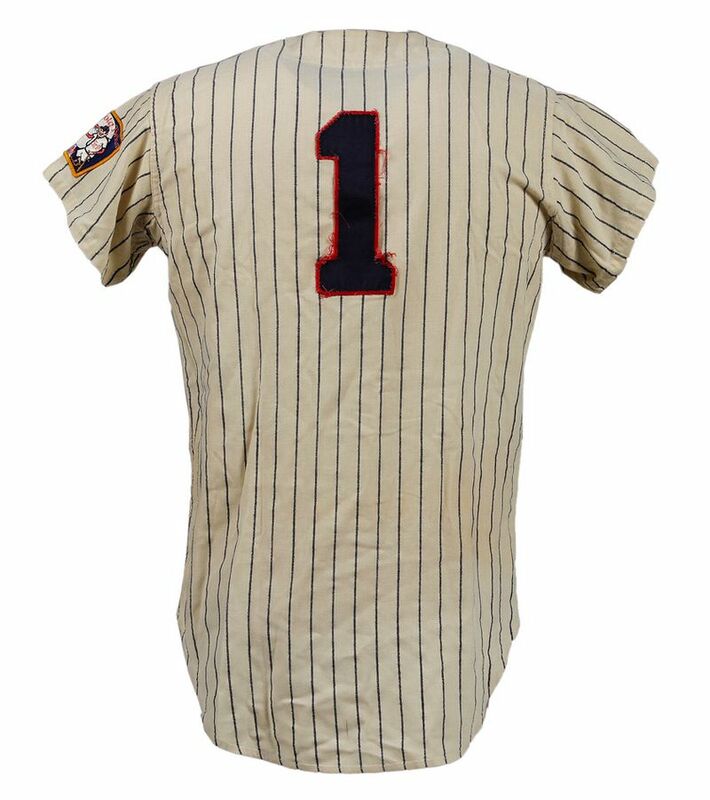 NOB is missing here - I'm pretty sure road jerseys had a NOB in 1983. 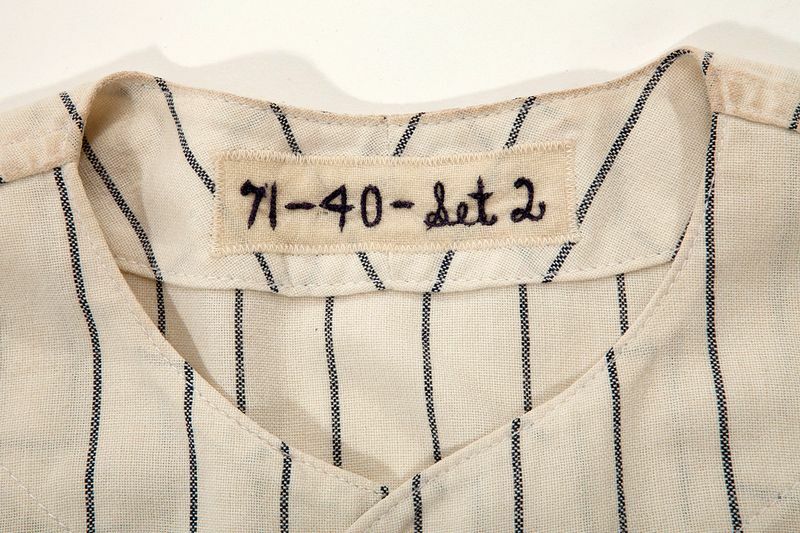 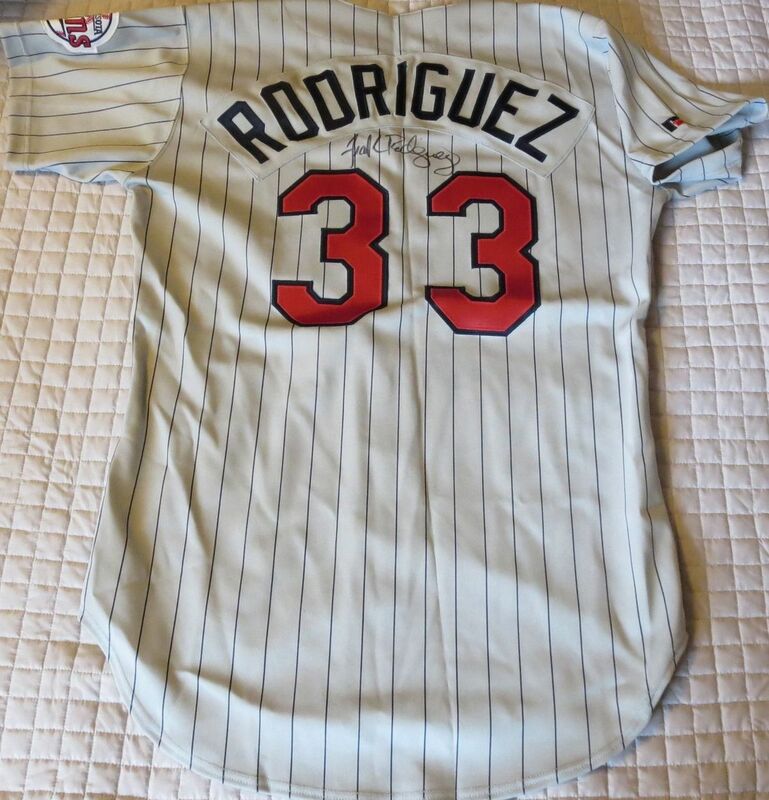 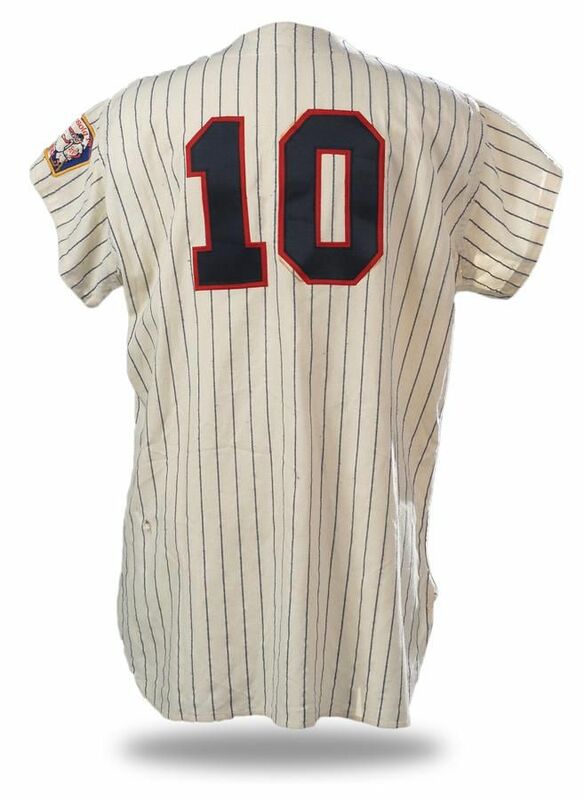 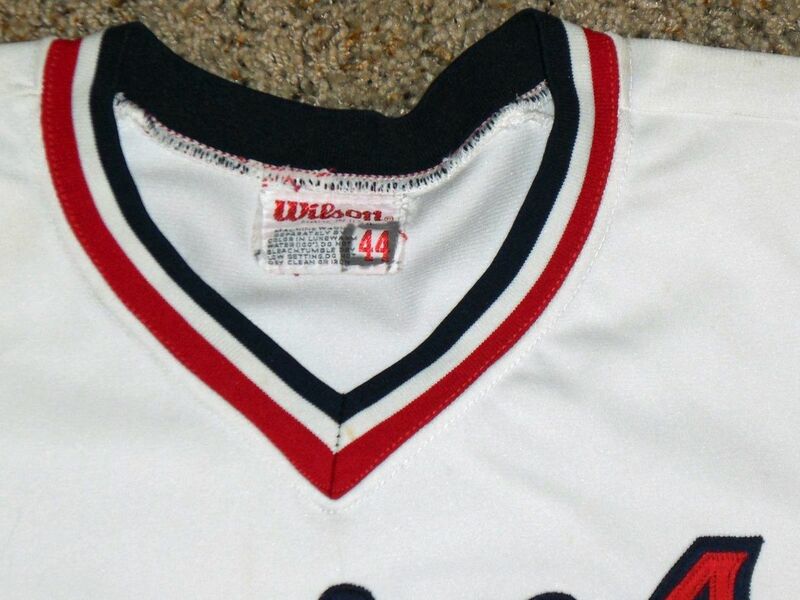 NOB, still only on the road jersey, is on a nameplate instead of sewn directly to the jersey. 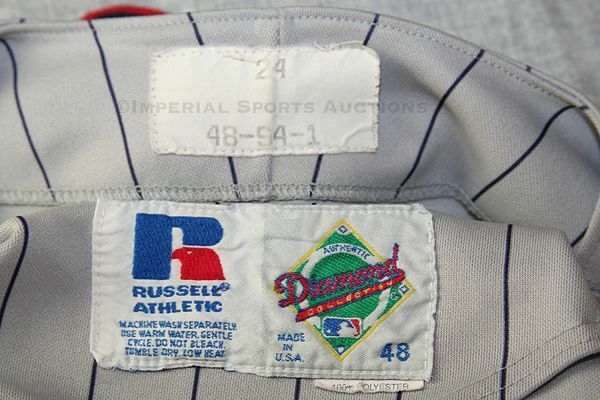 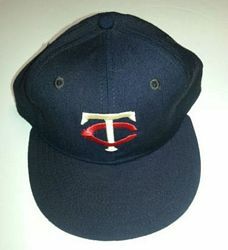 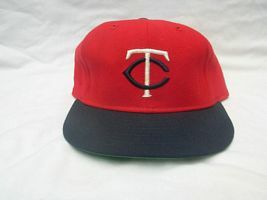 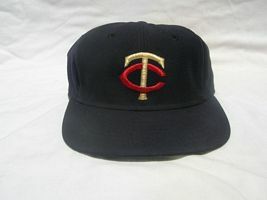 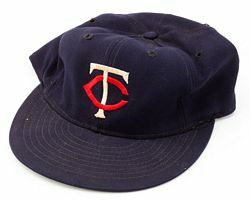 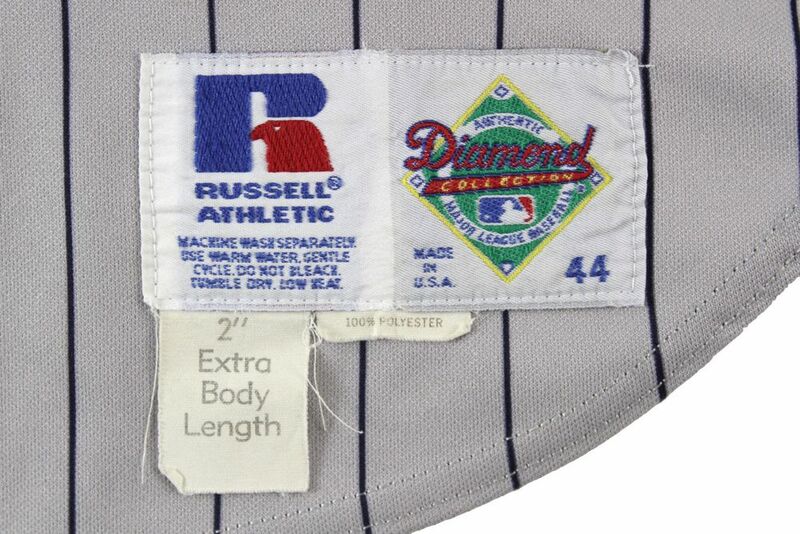 Cap logo gets thinner in 1985. 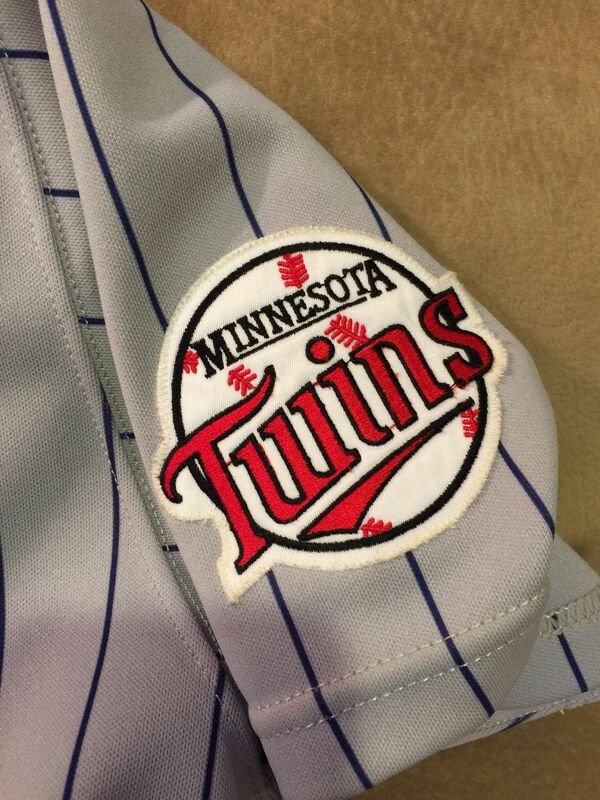 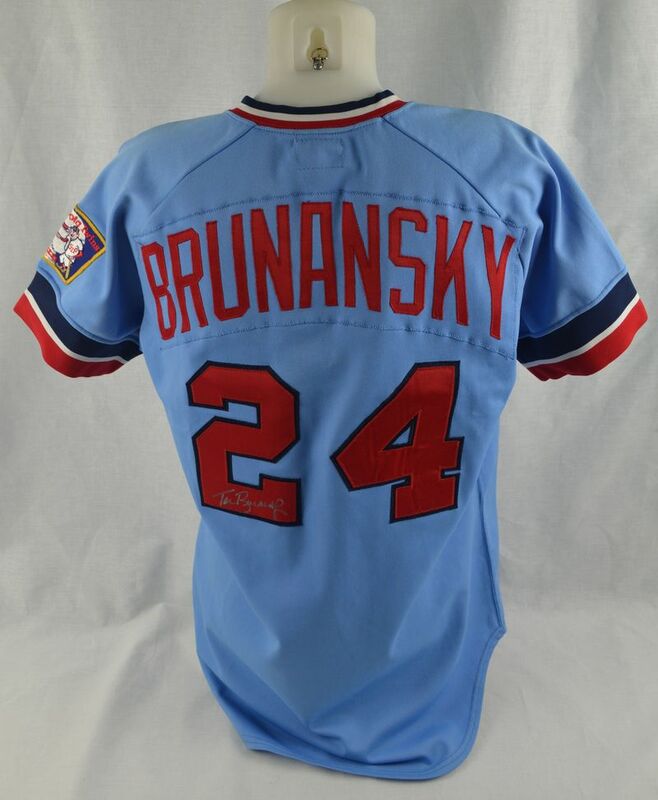 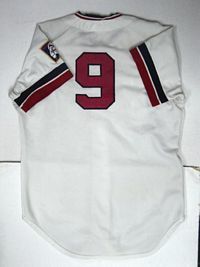 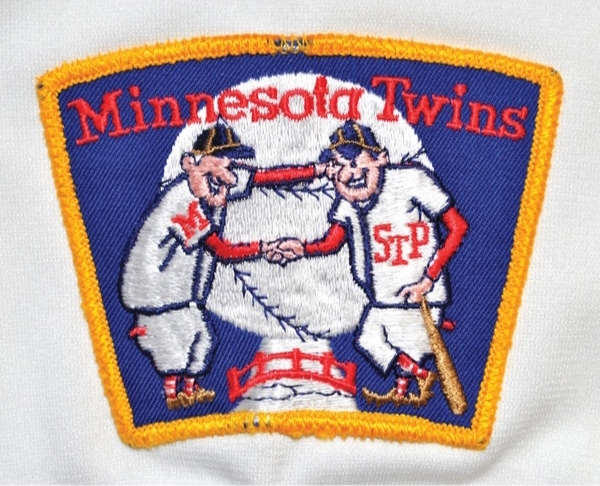 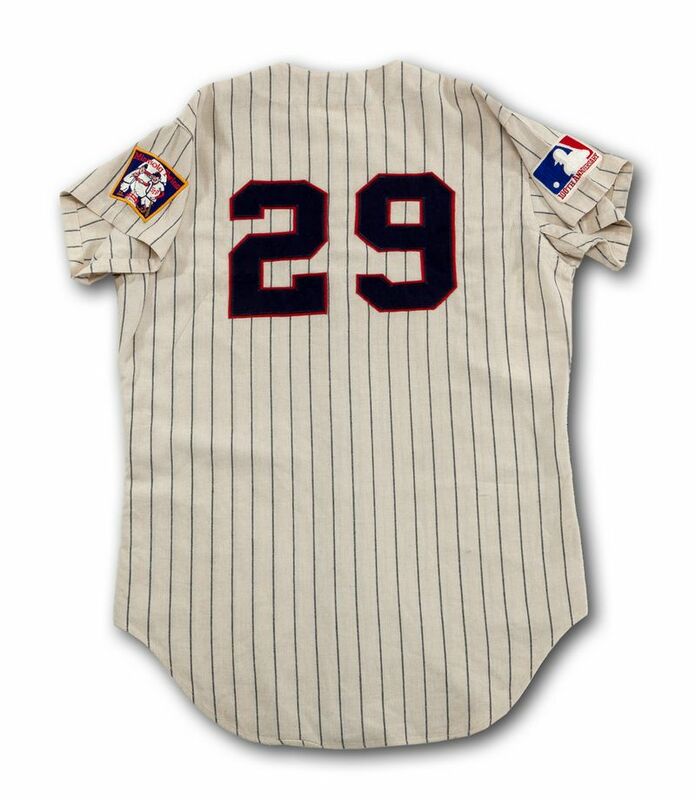 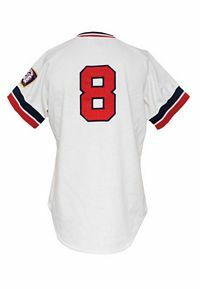 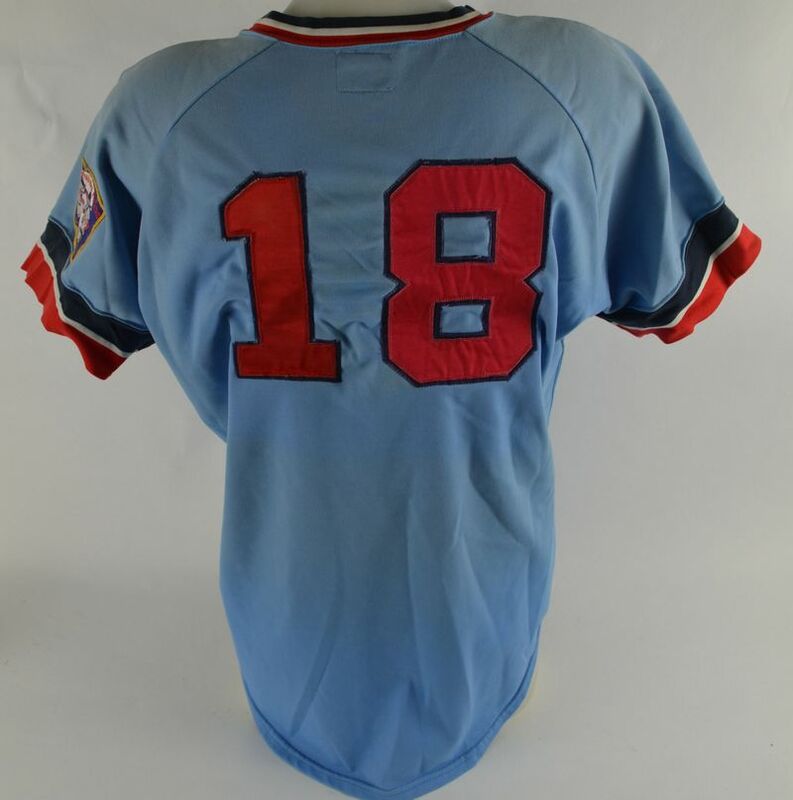 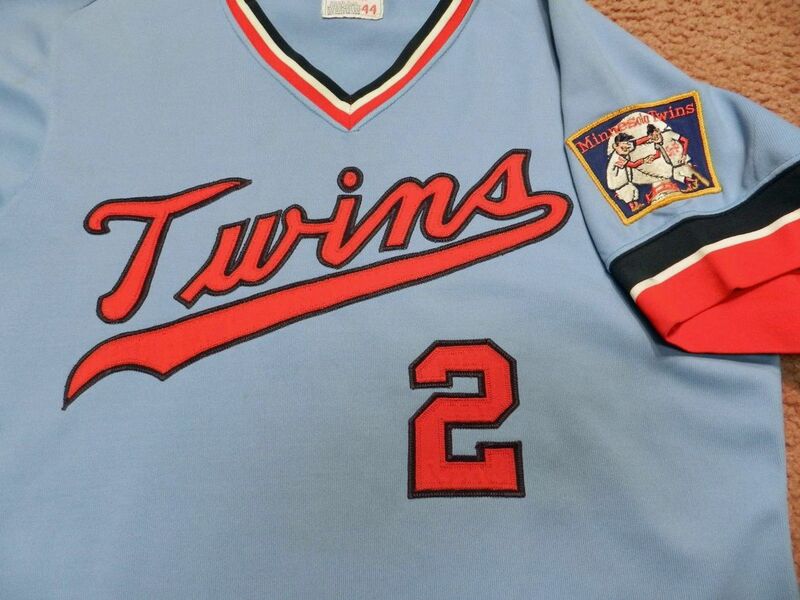 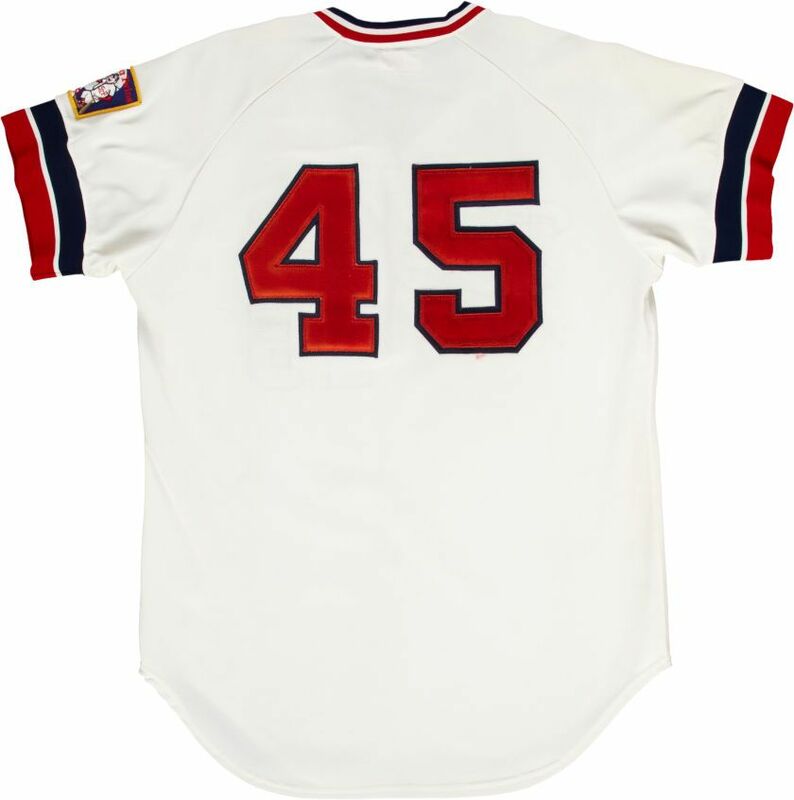 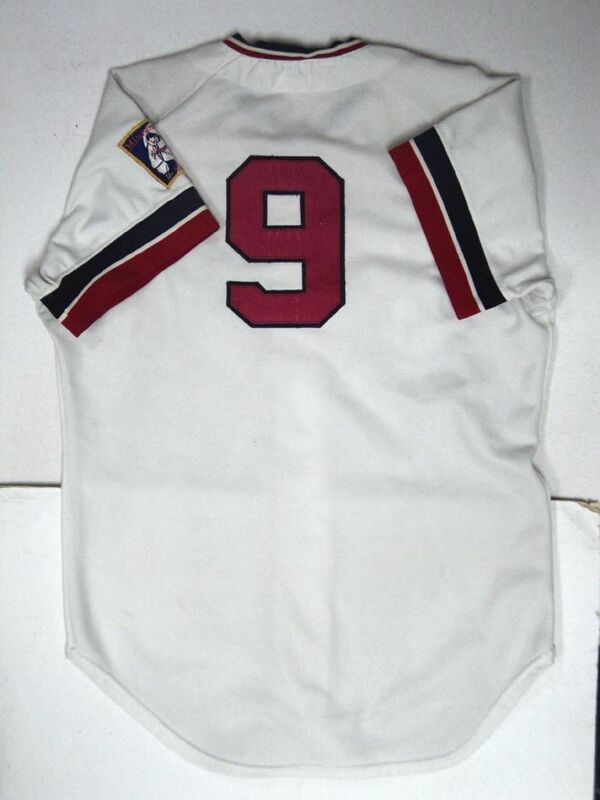 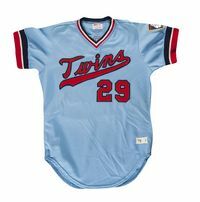 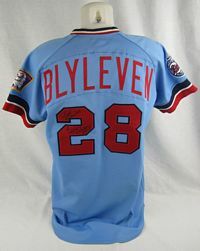 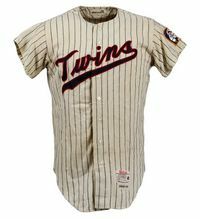 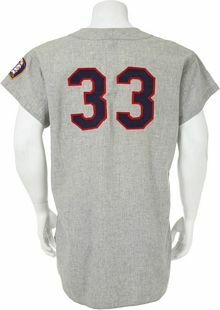 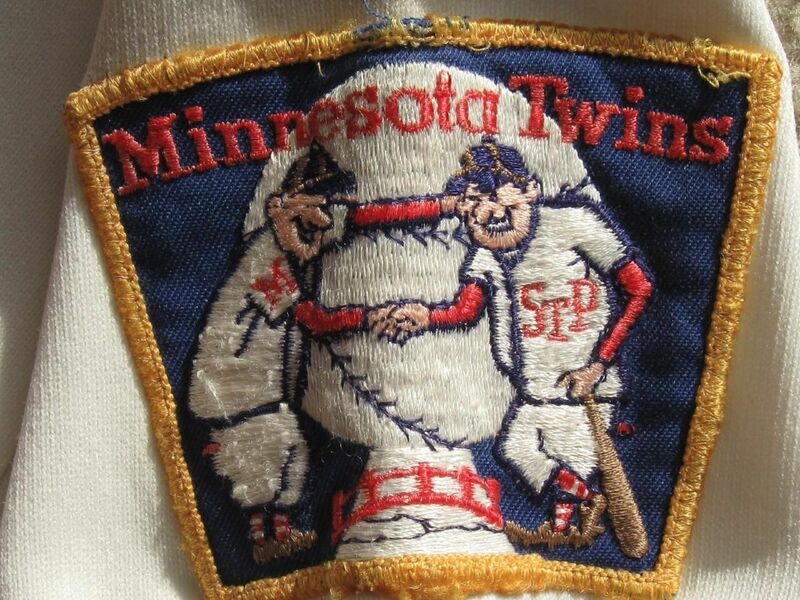 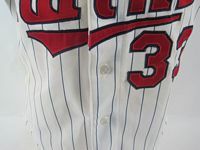 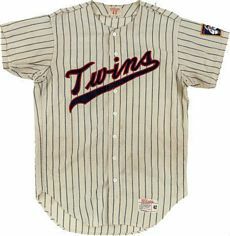 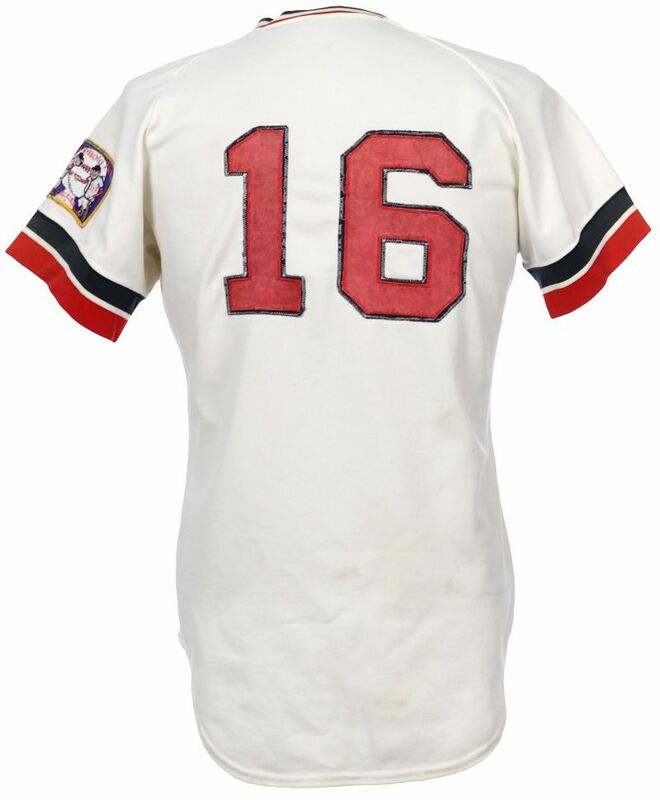 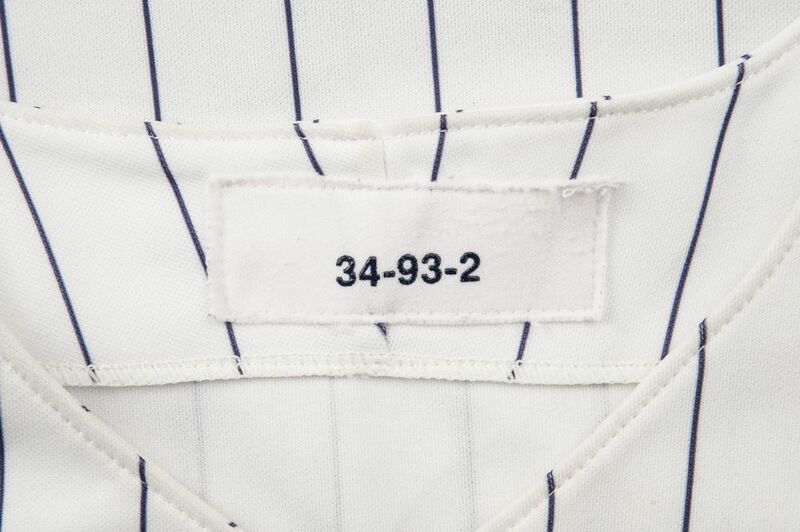 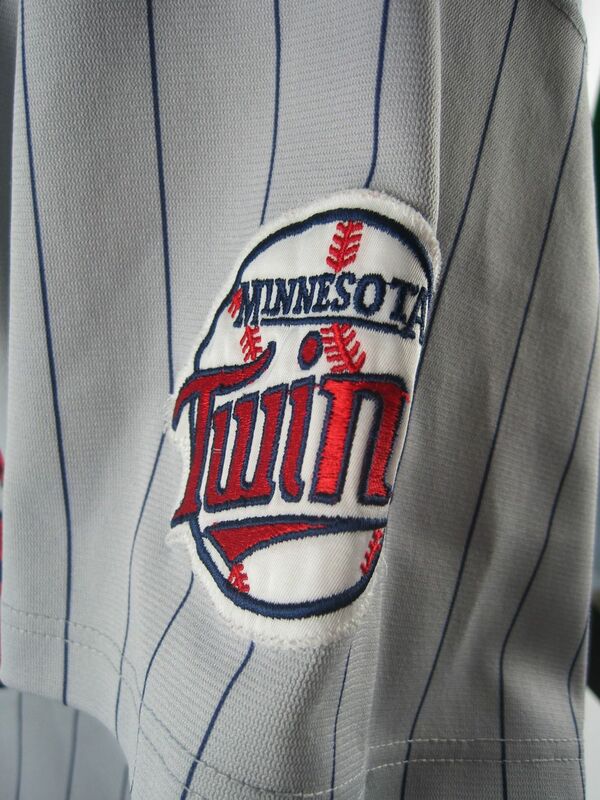 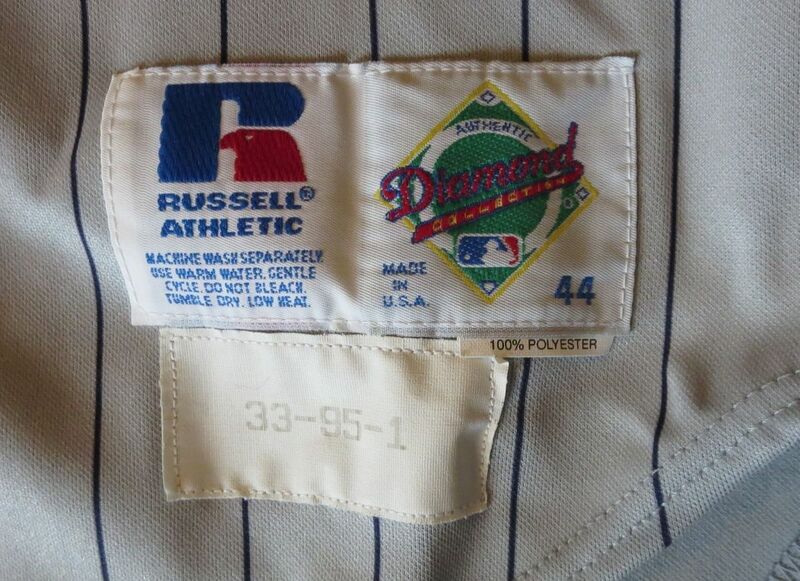 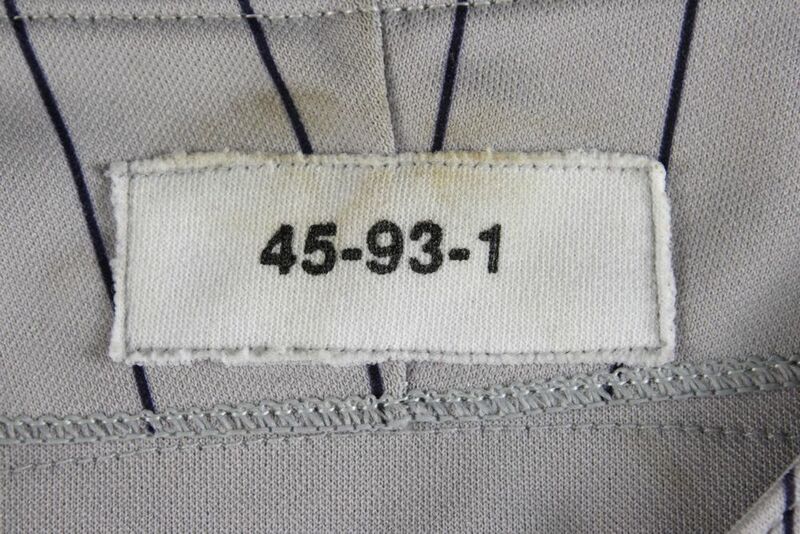 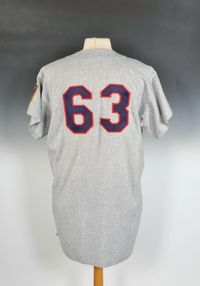 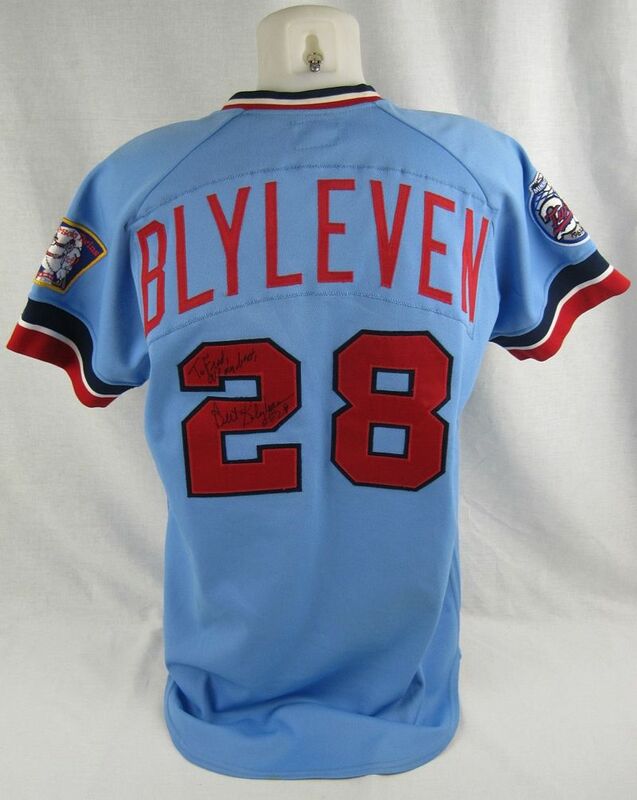 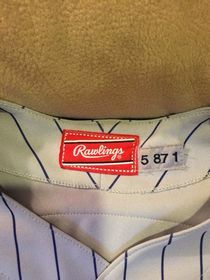 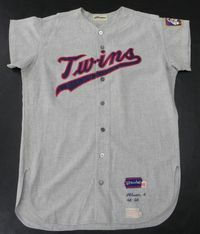 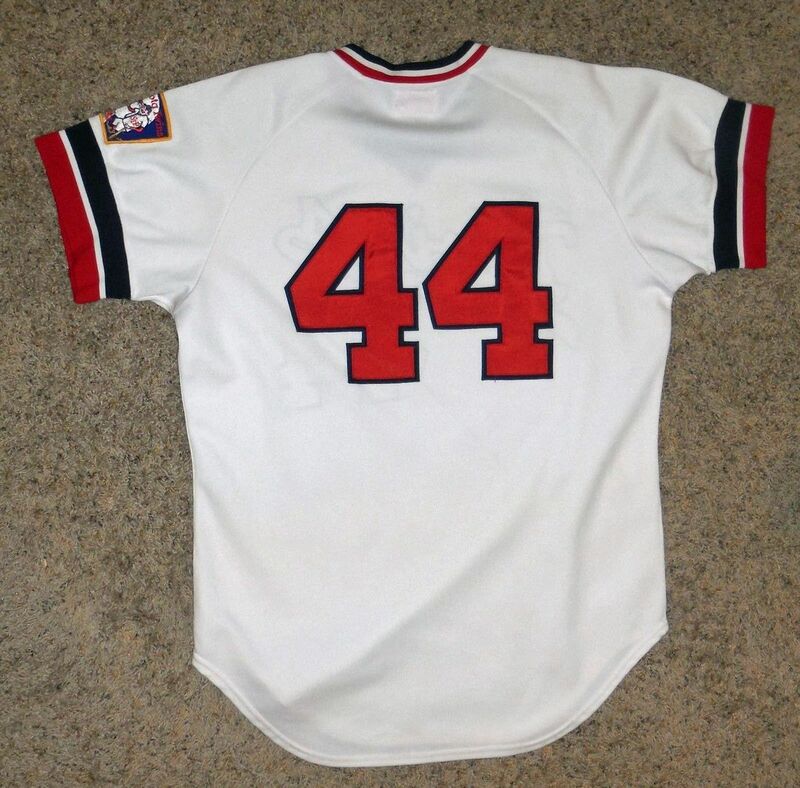 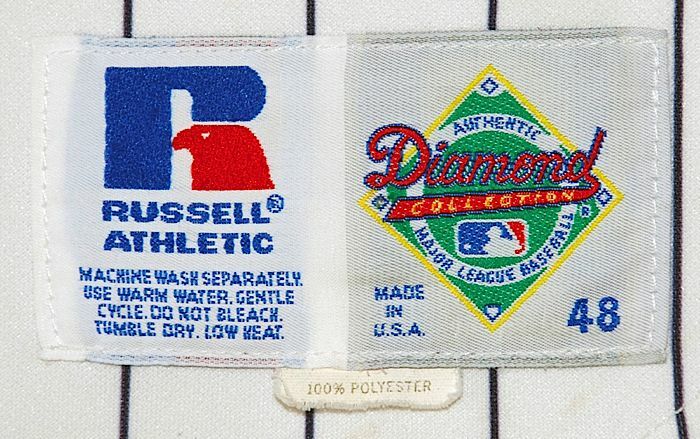 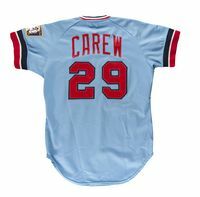 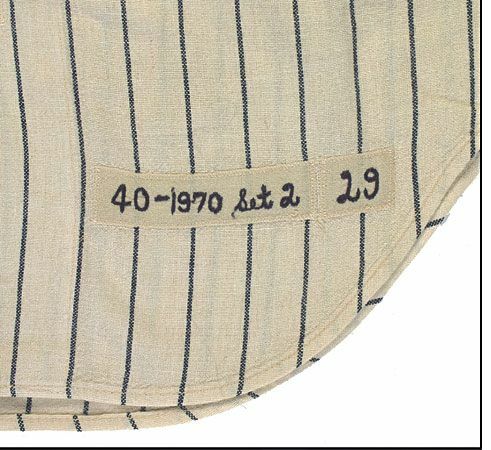 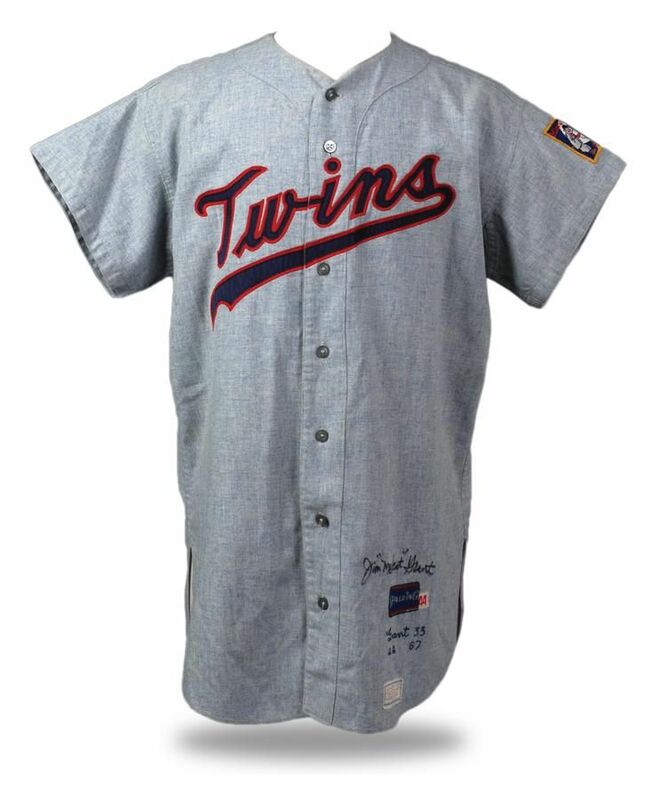 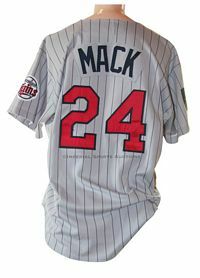 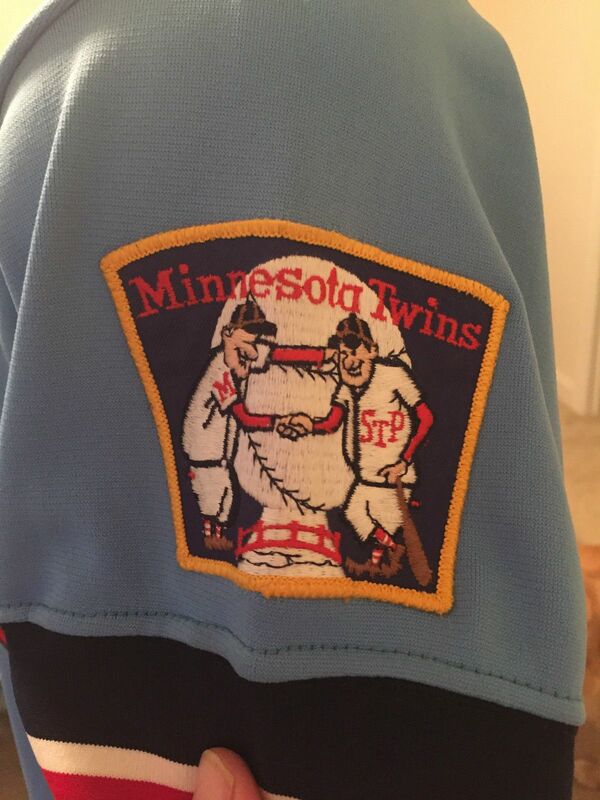 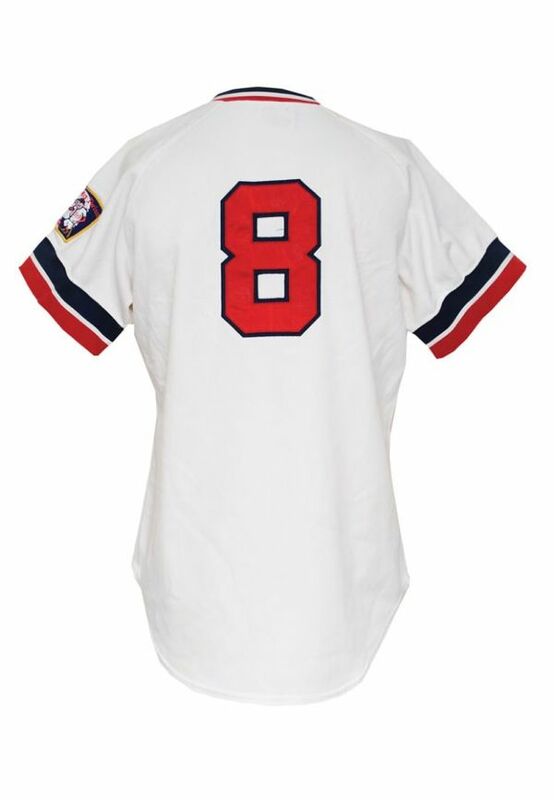 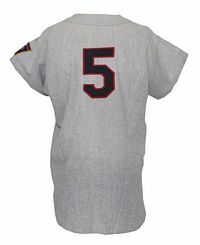 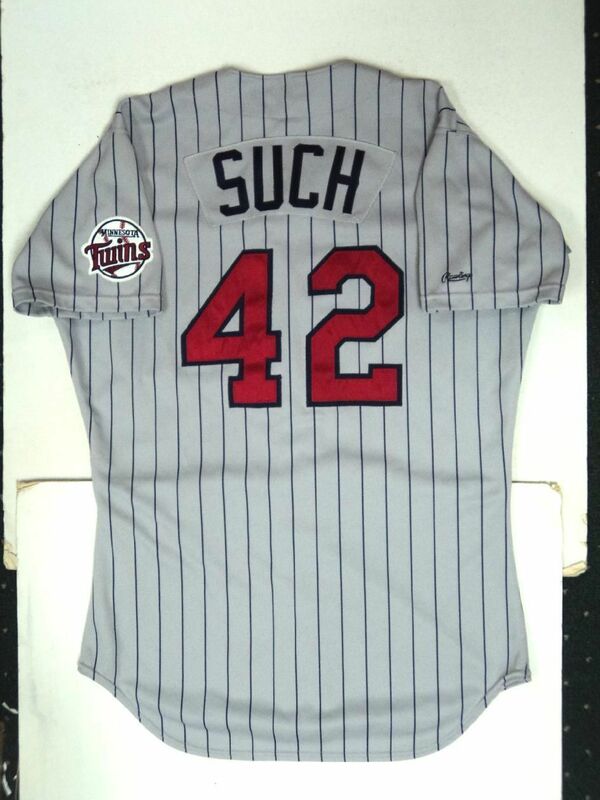 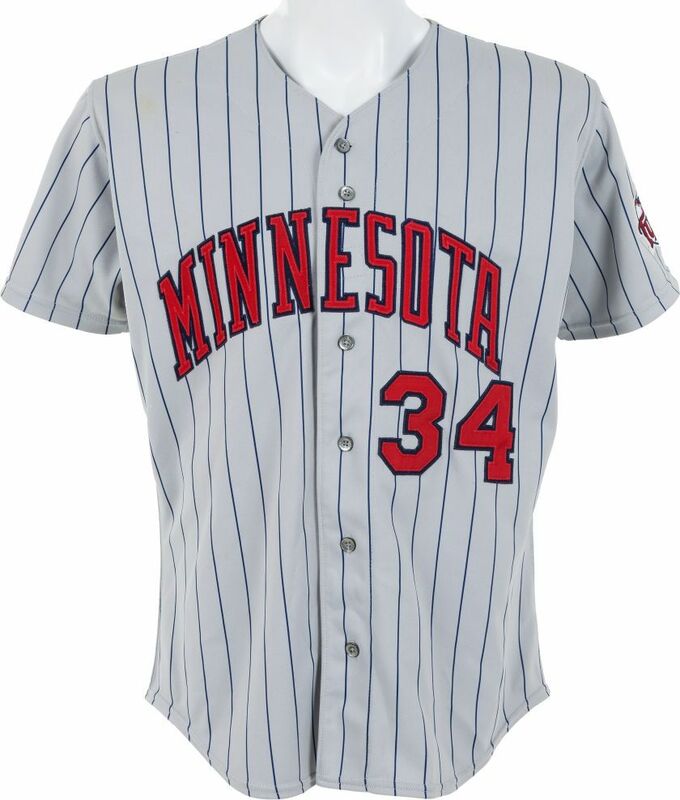 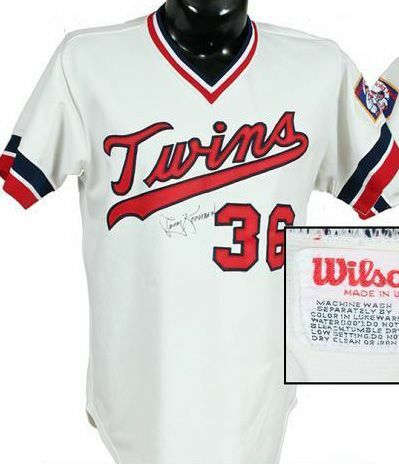 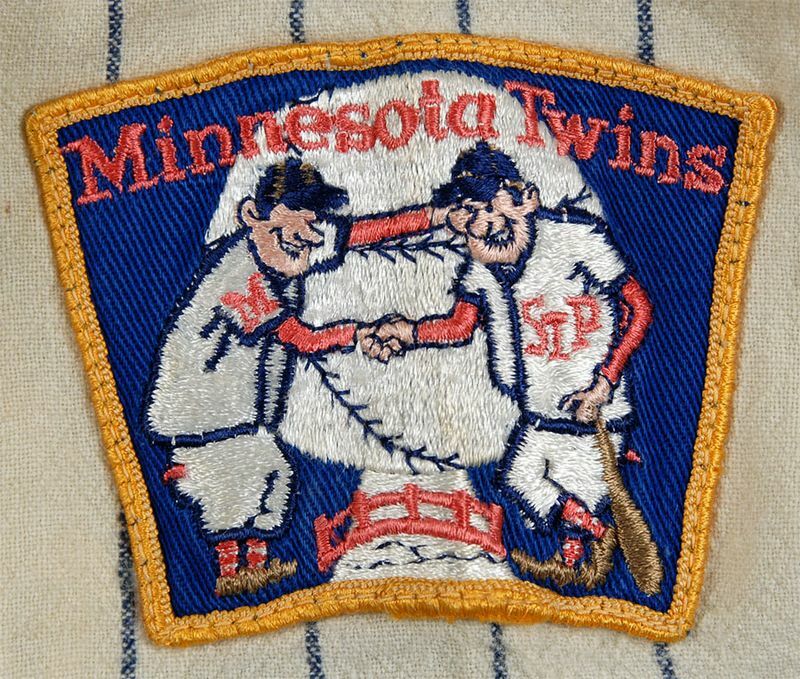 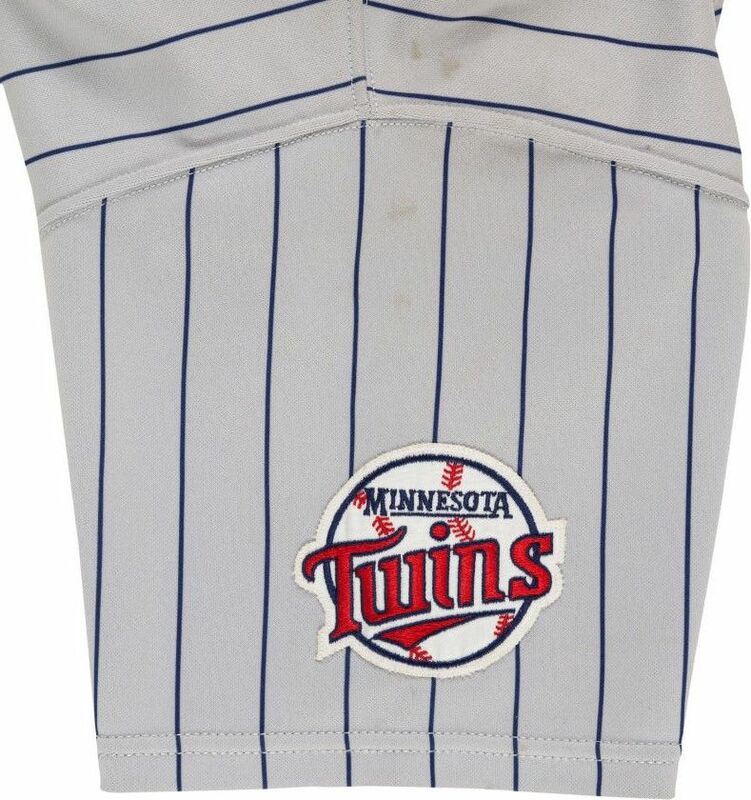 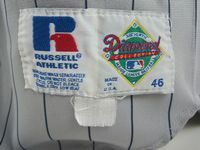 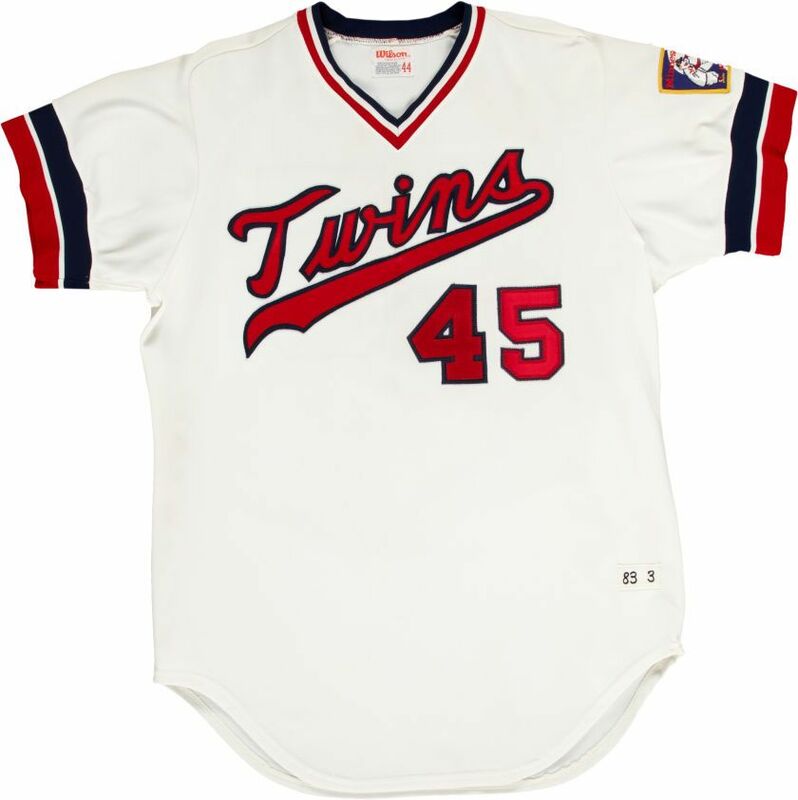 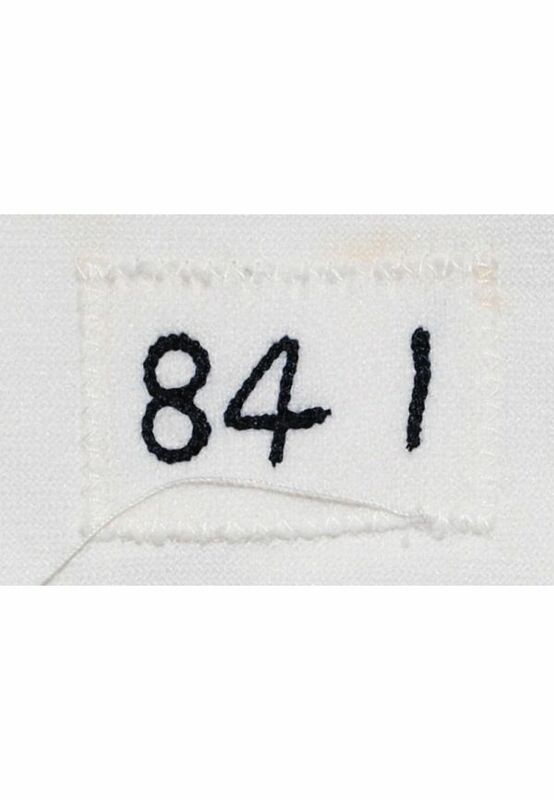 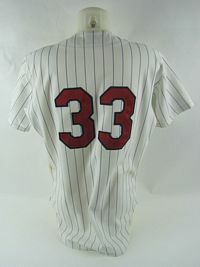 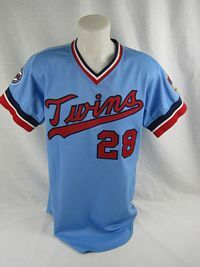 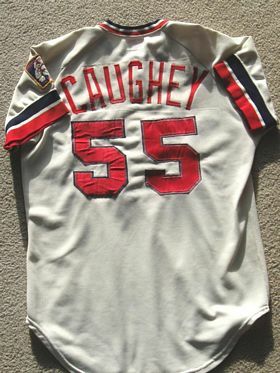 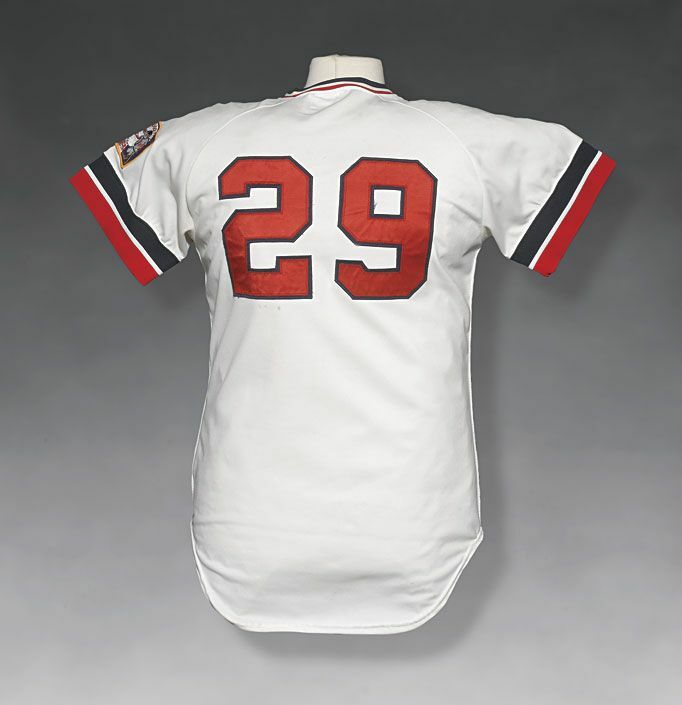 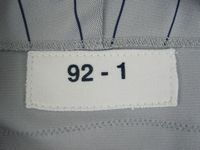 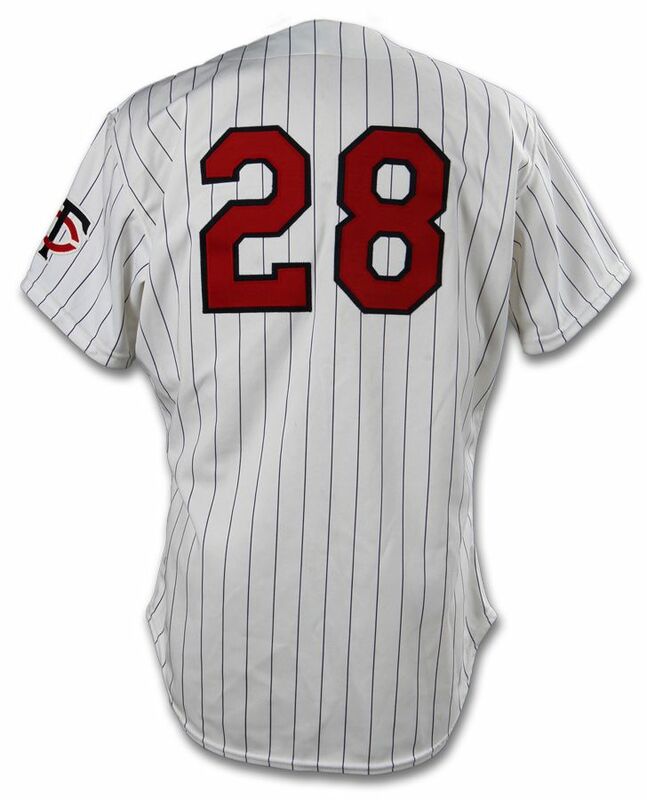 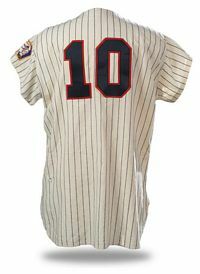 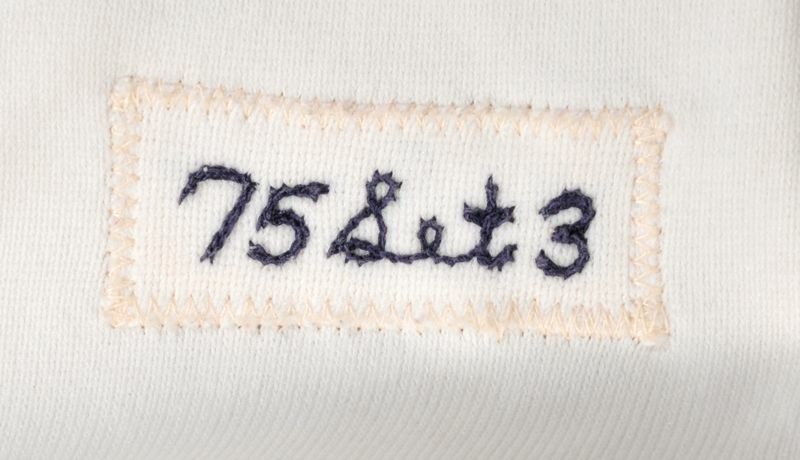 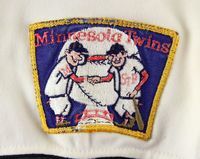 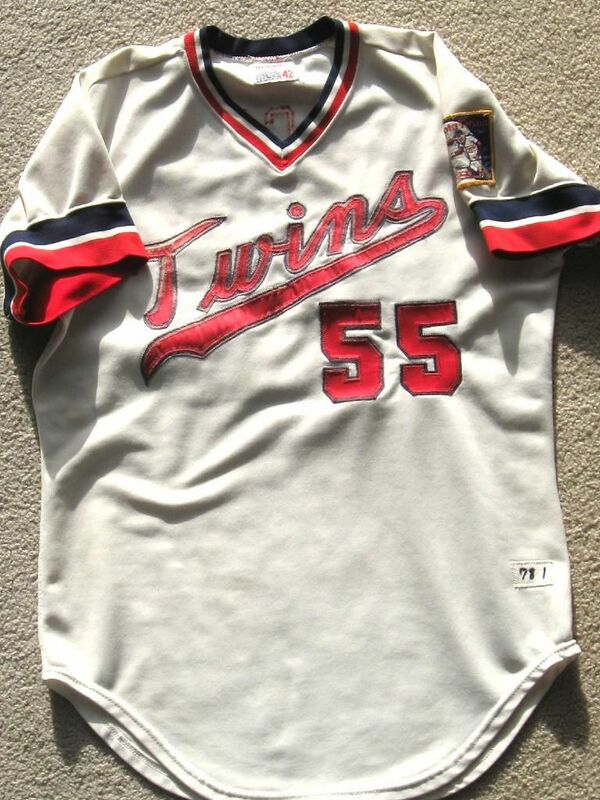 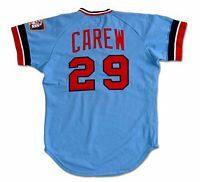 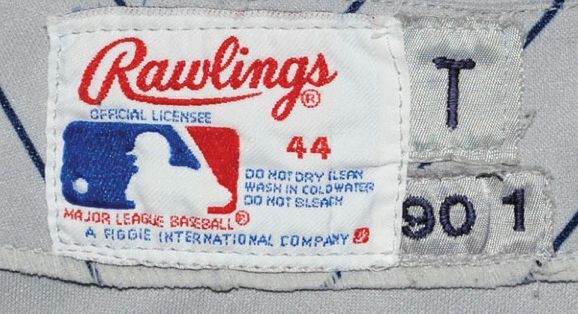 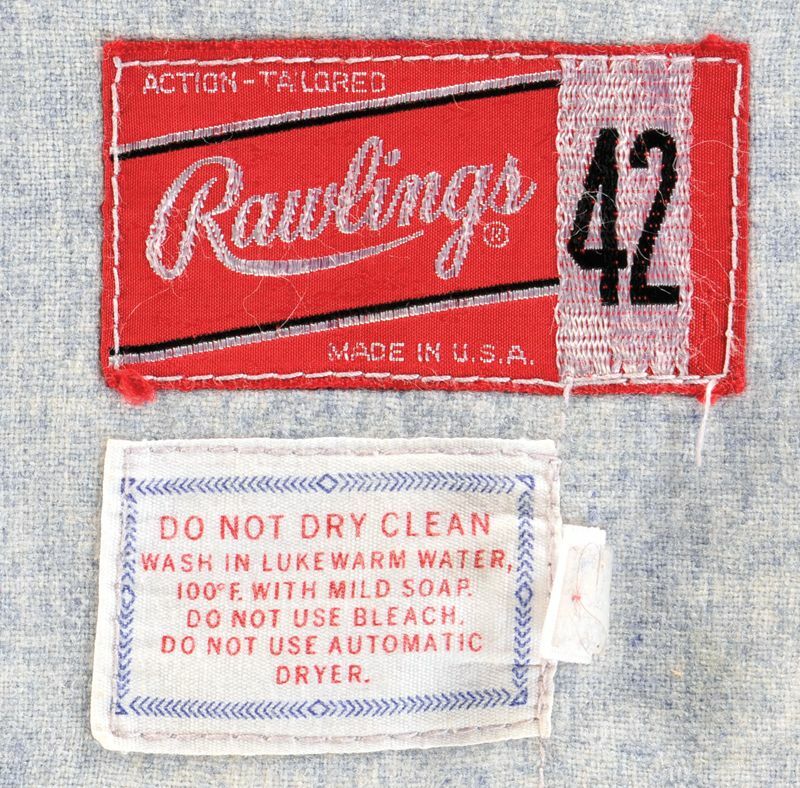 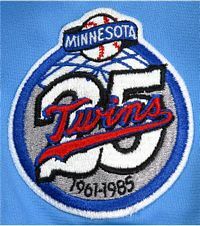 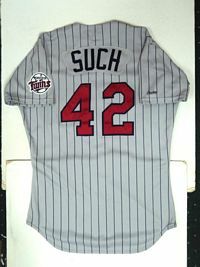 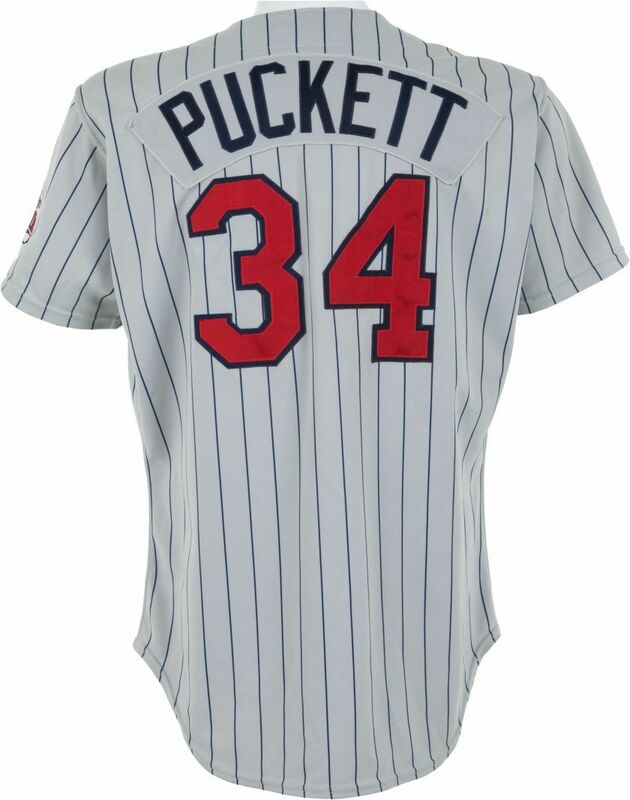 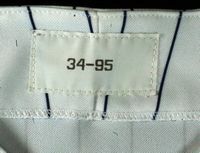 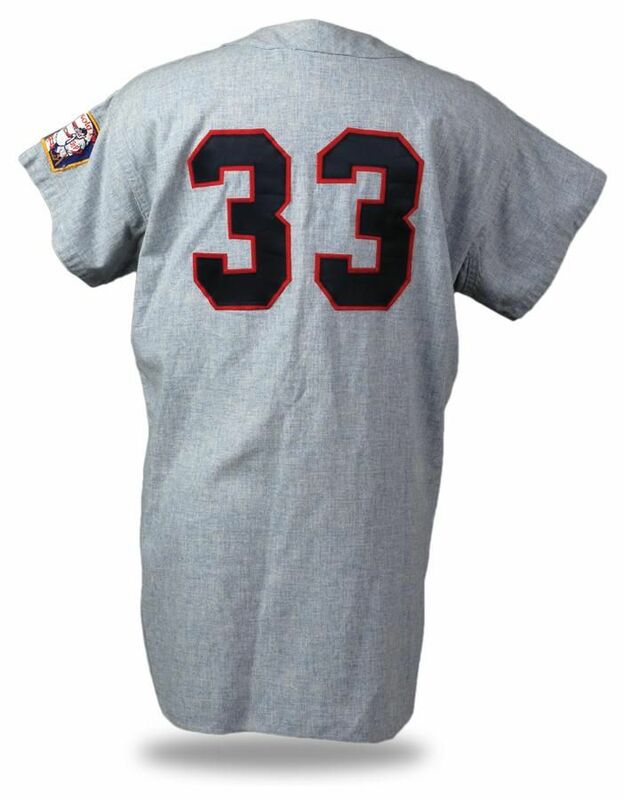 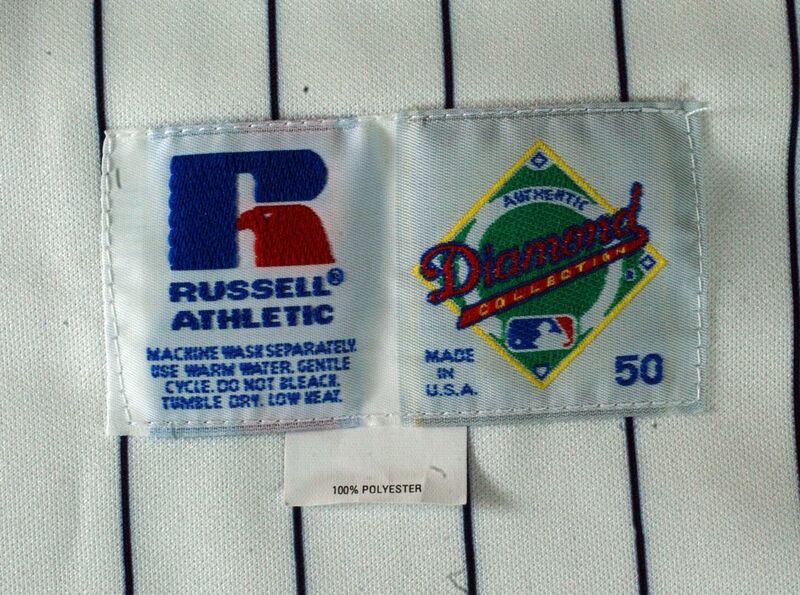 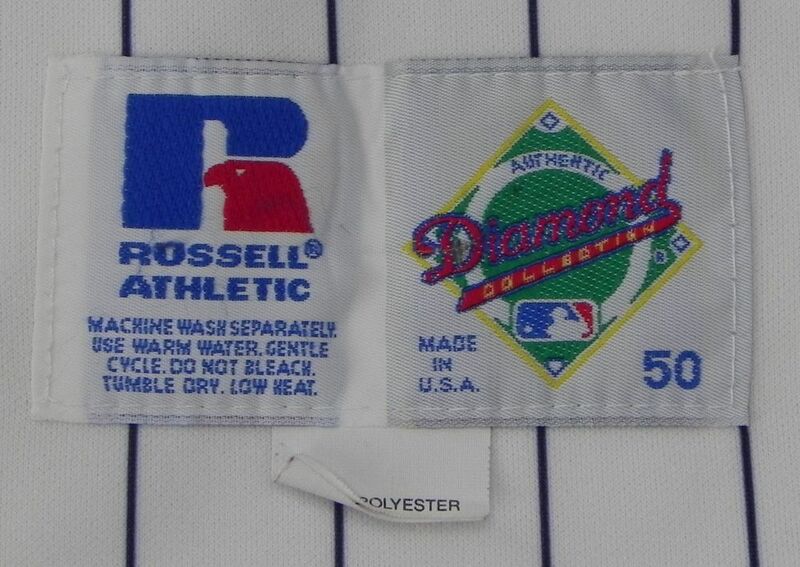 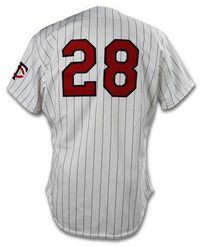 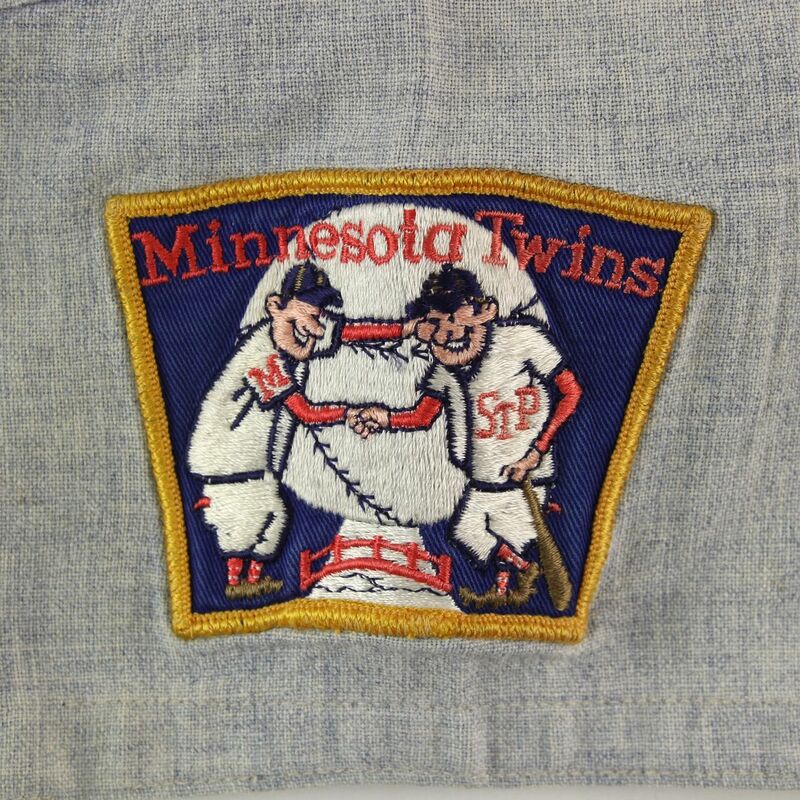 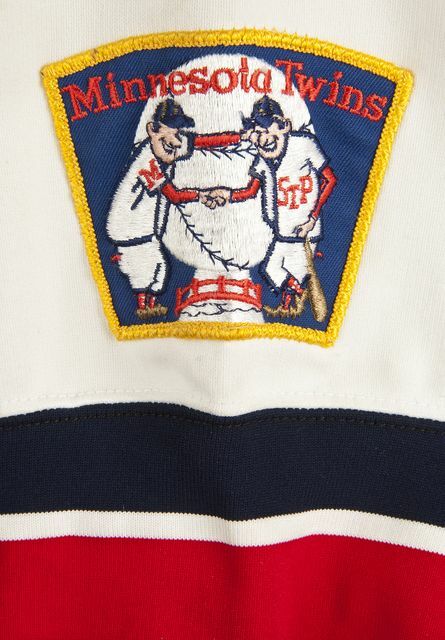 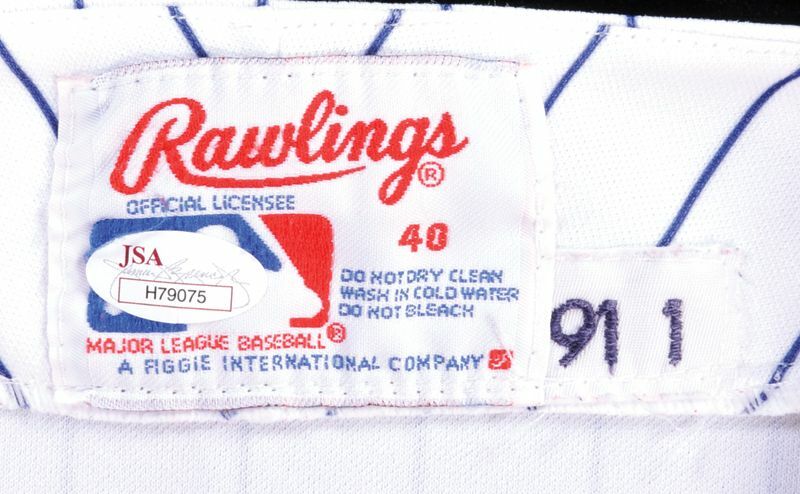 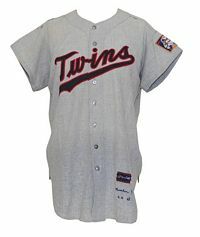 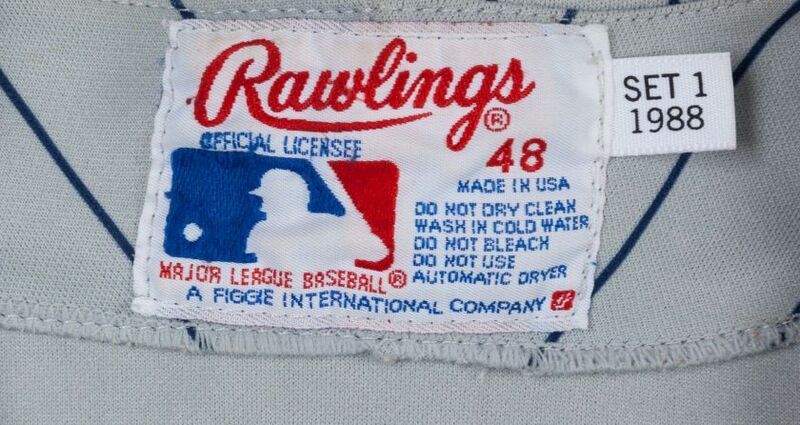 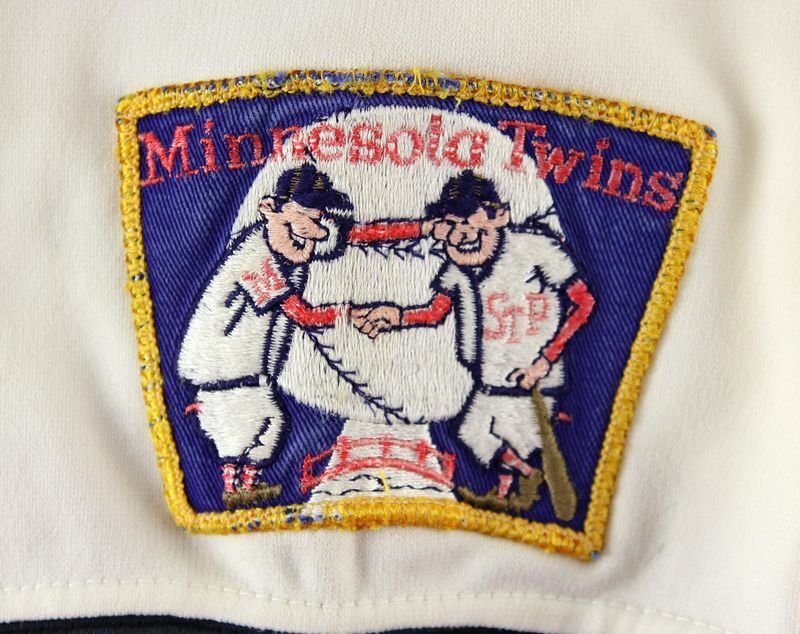 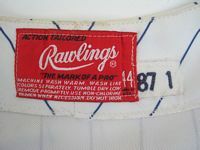 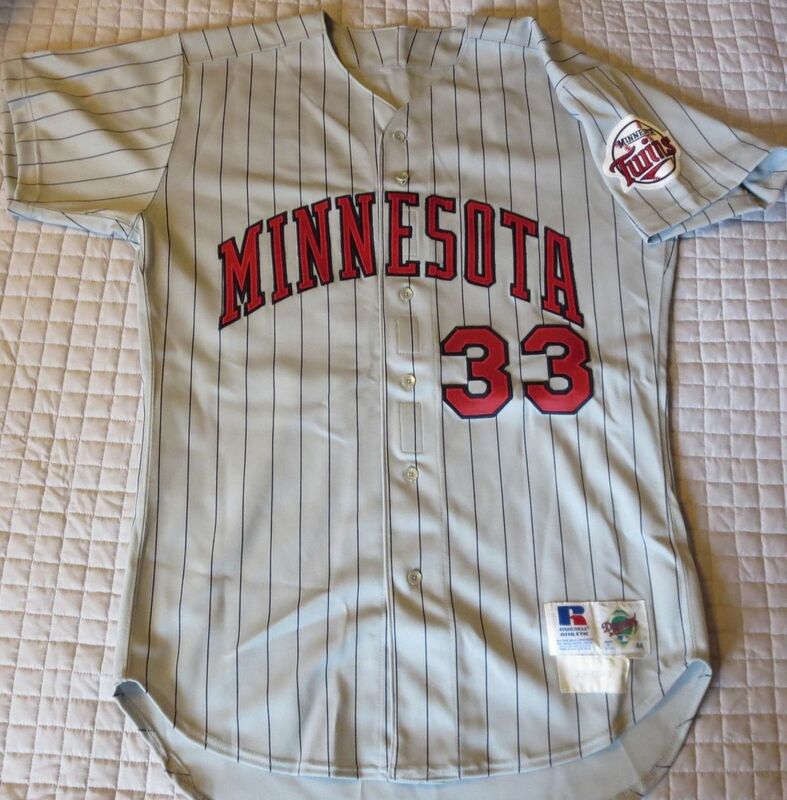 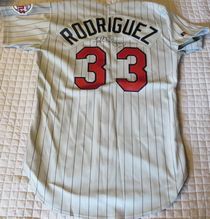 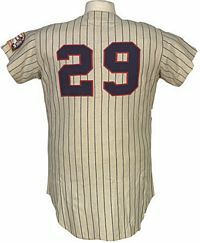 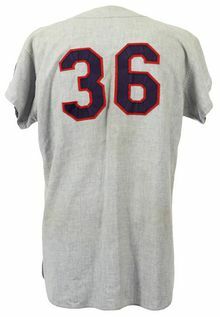 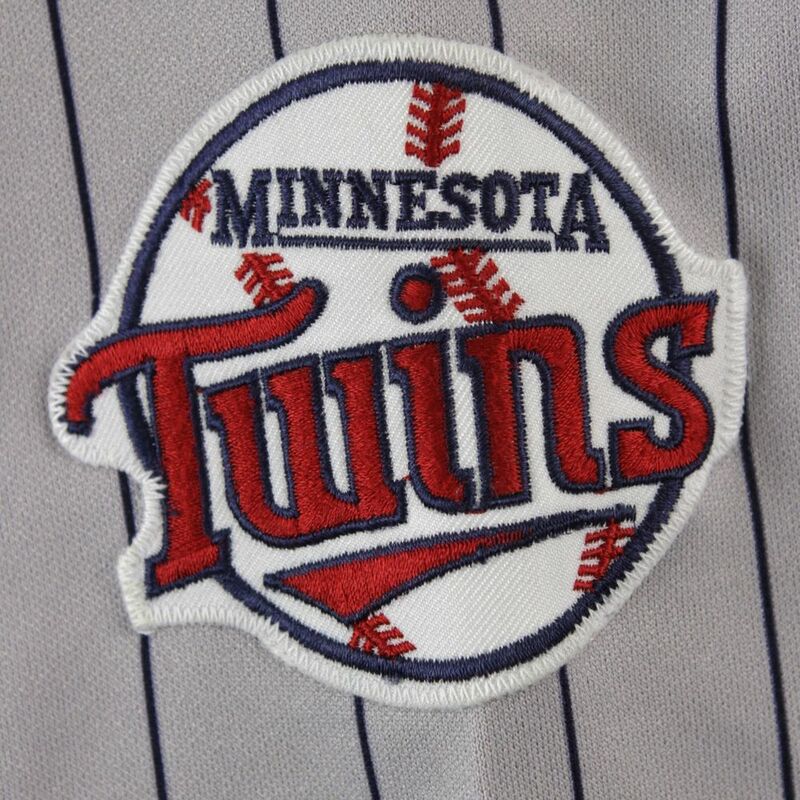 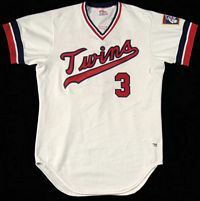 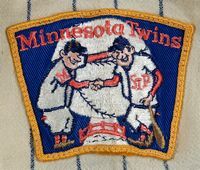 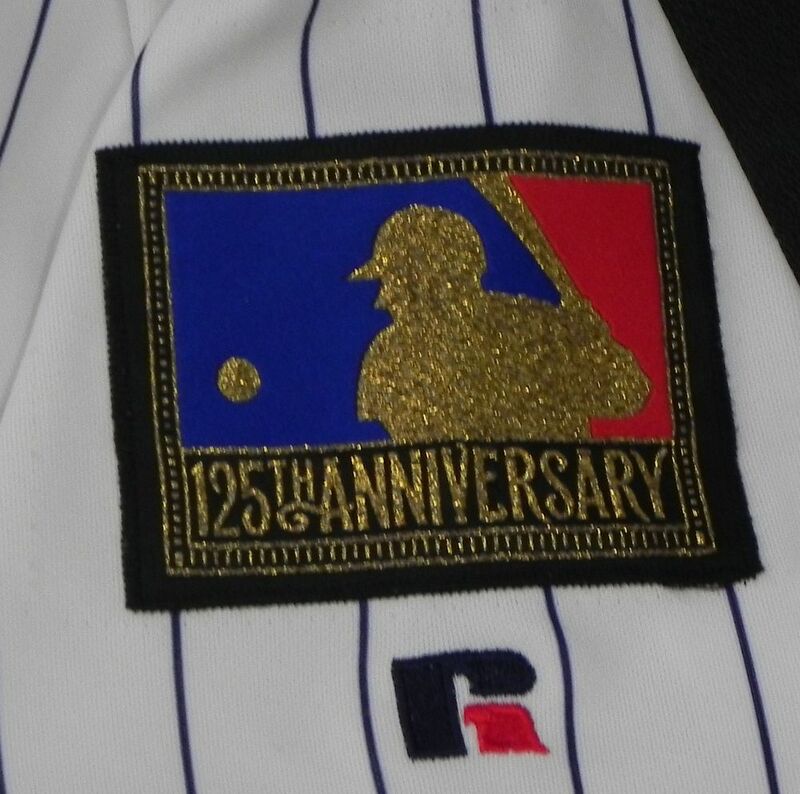 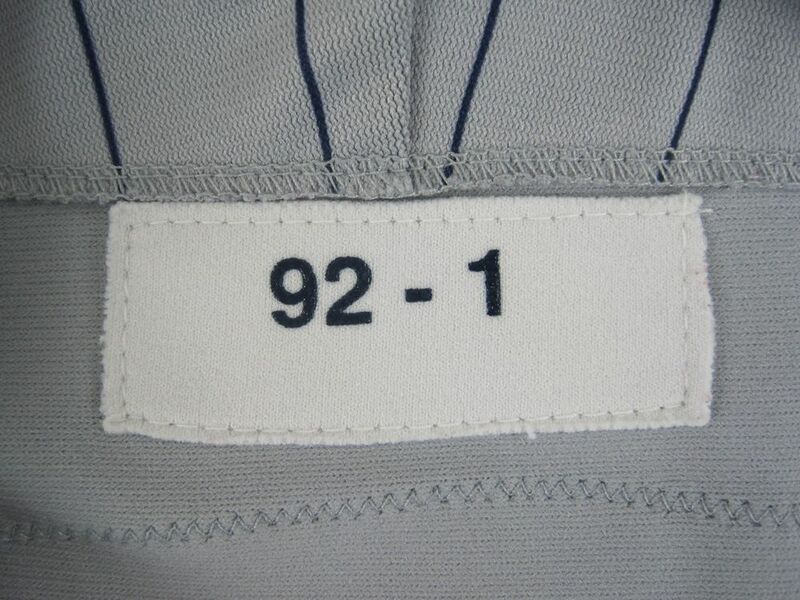 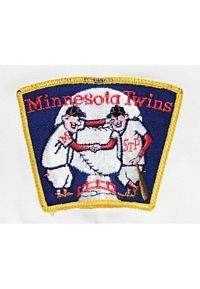 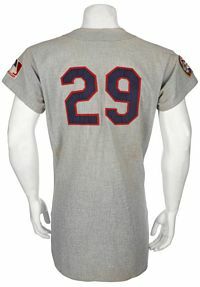 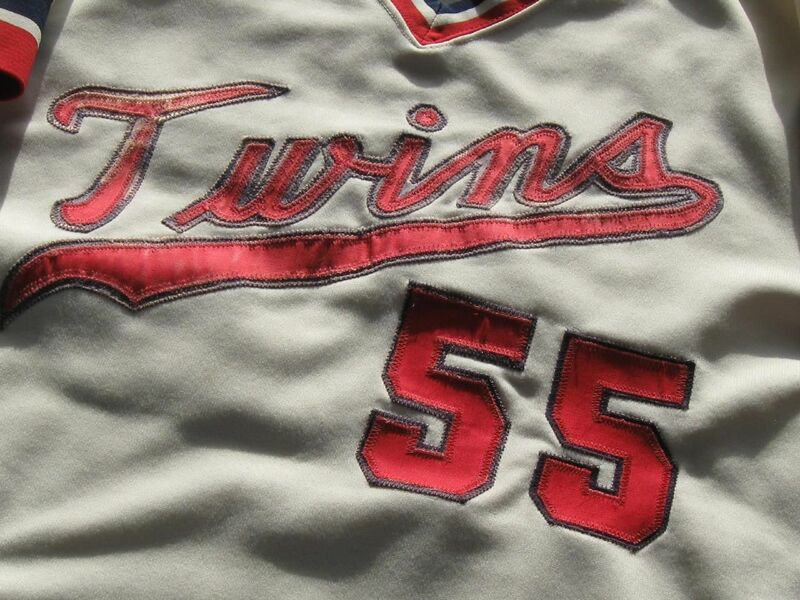 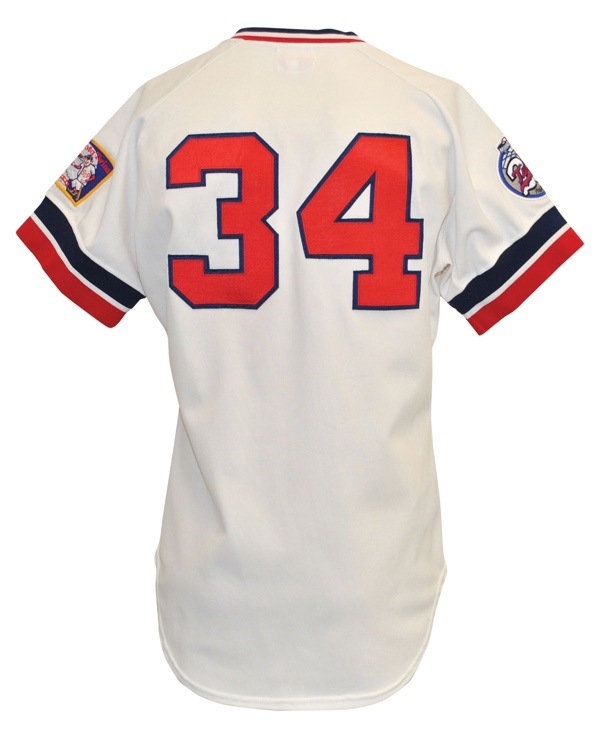 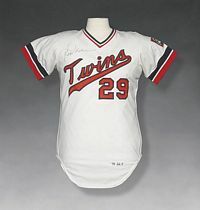 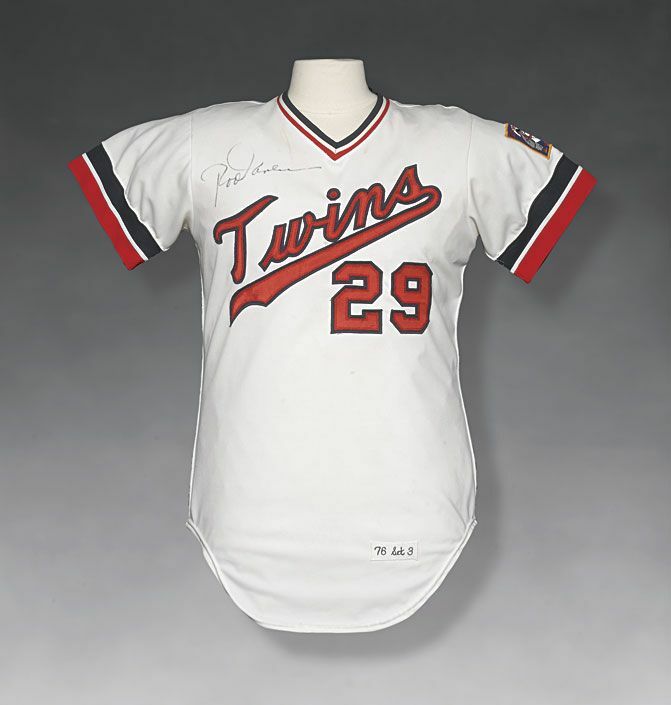 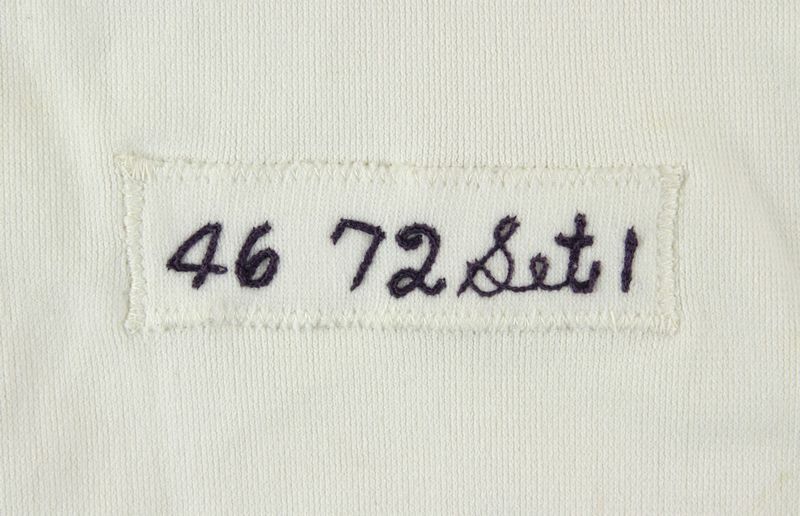 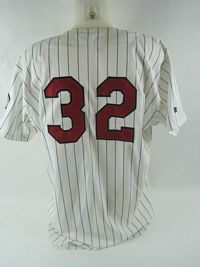 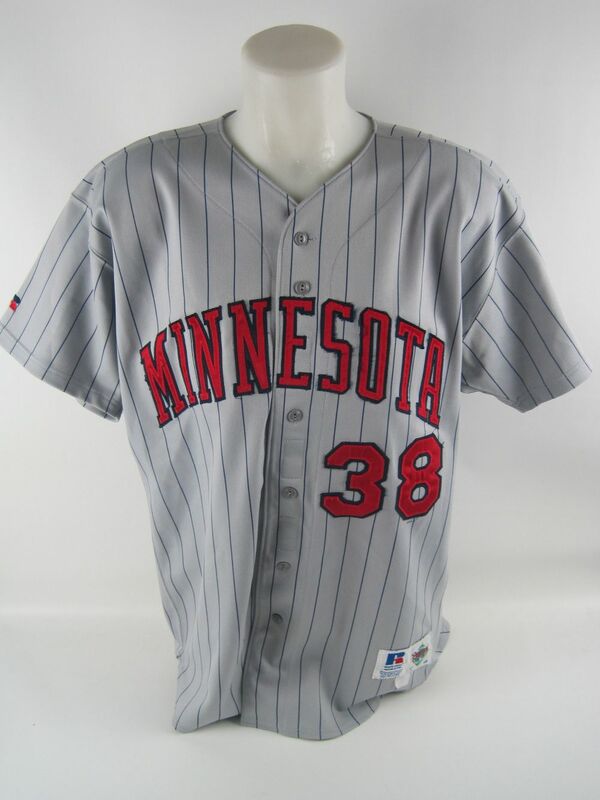 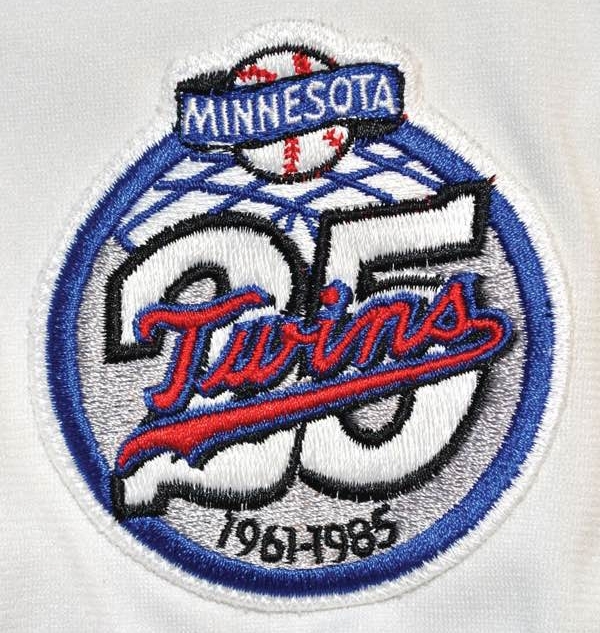 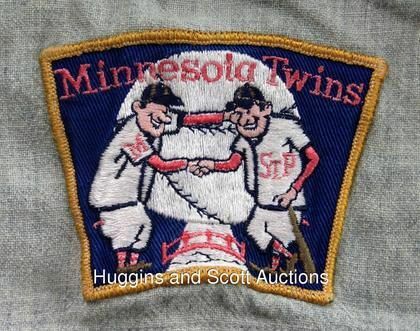 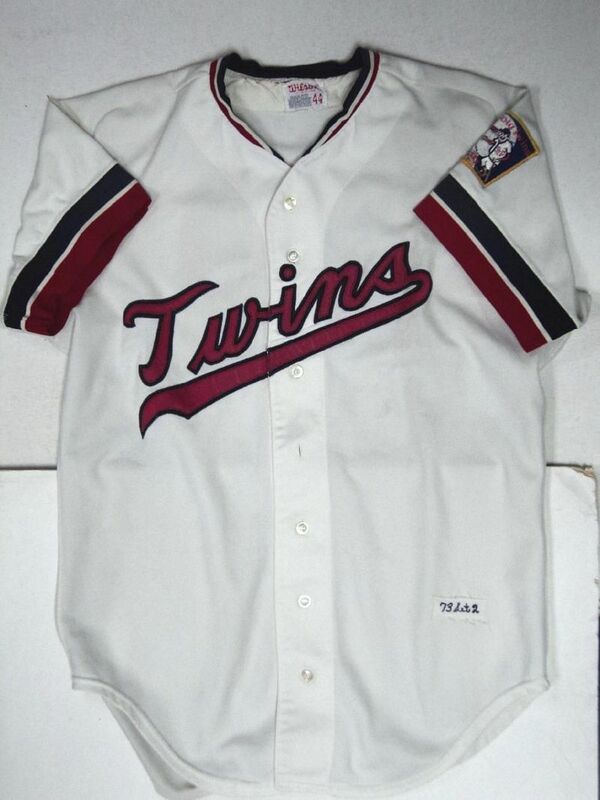 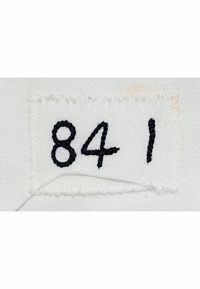 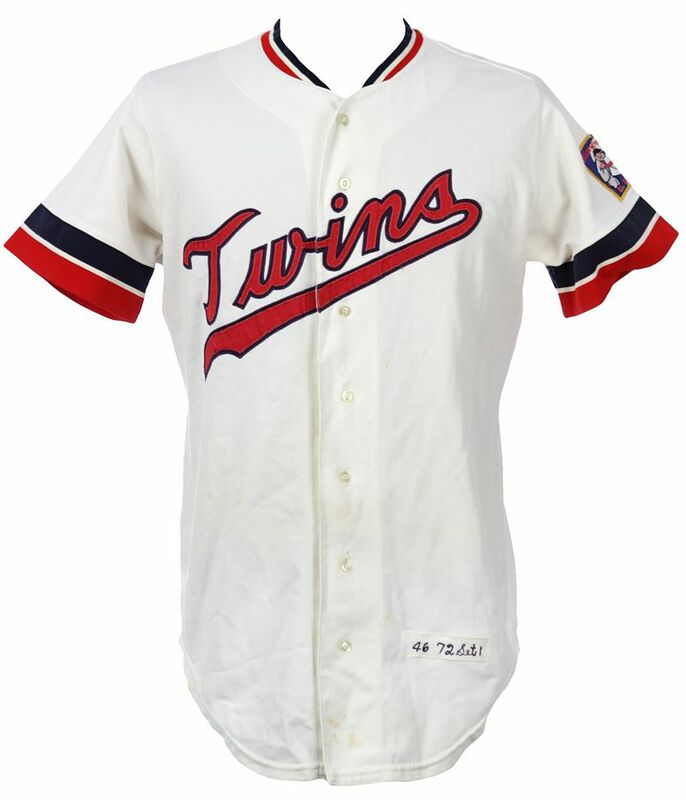 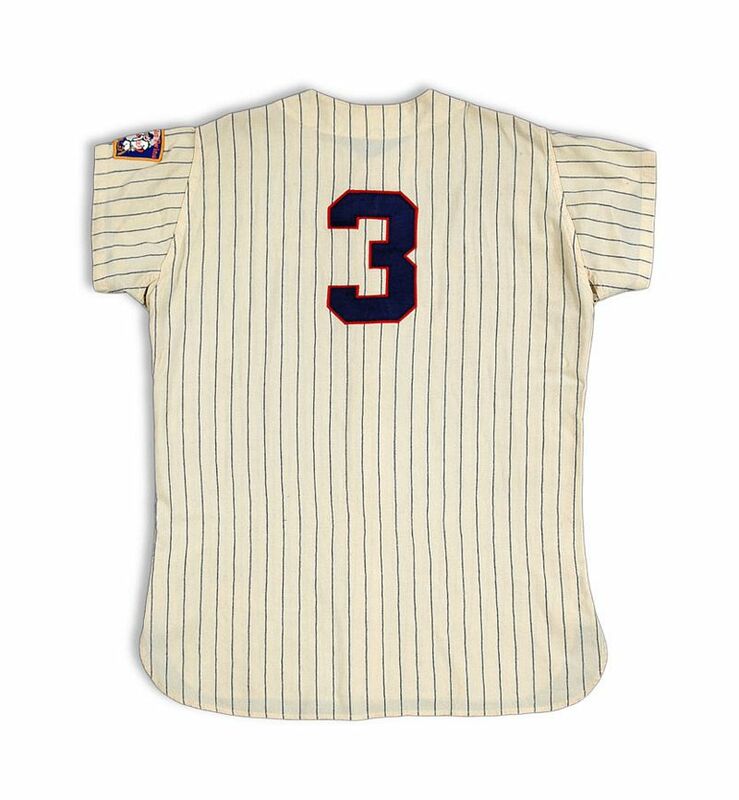 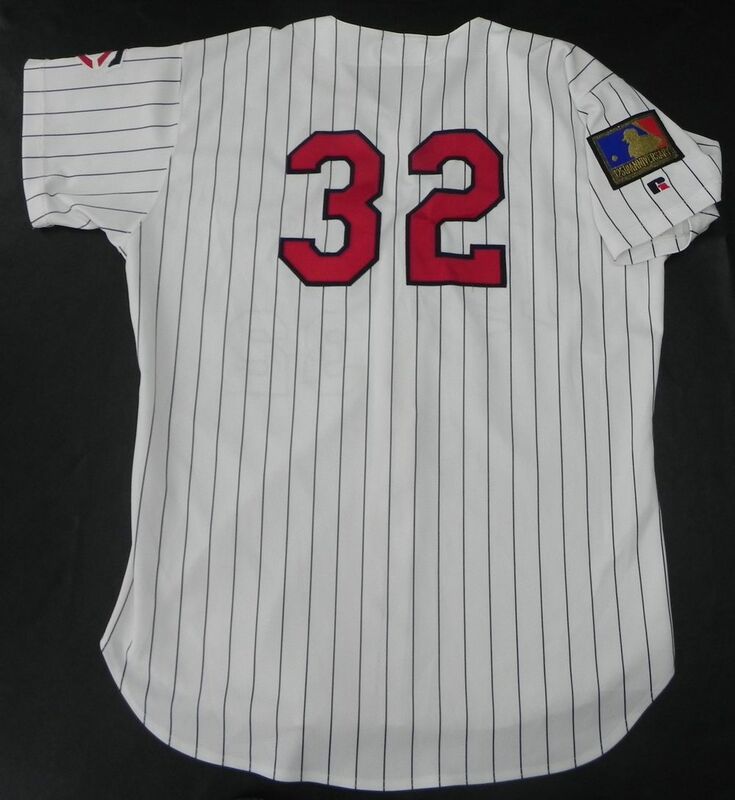 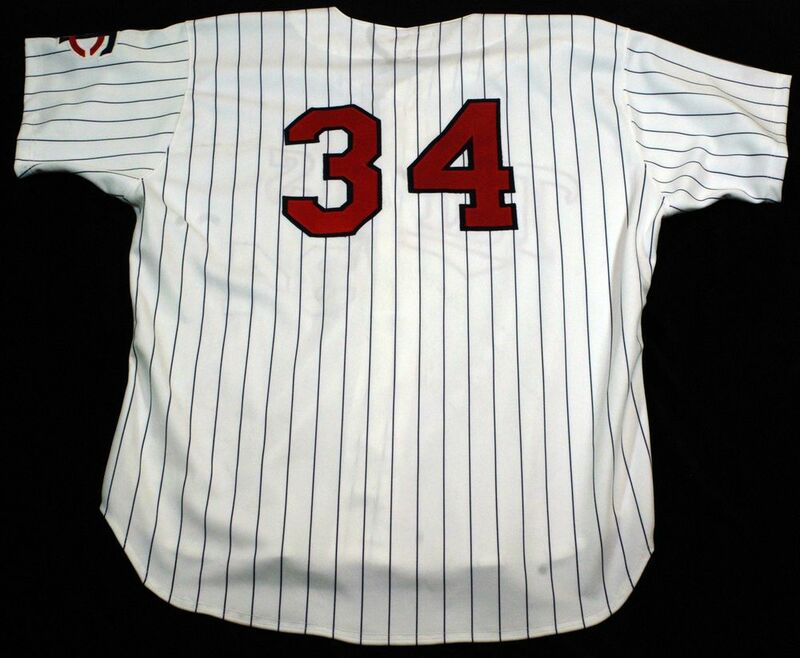 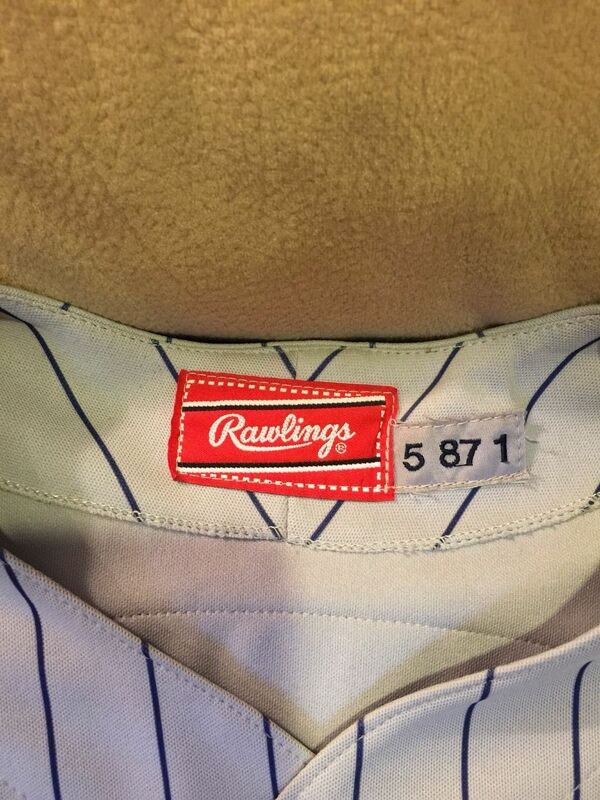 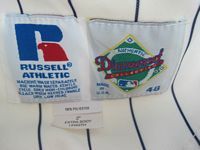 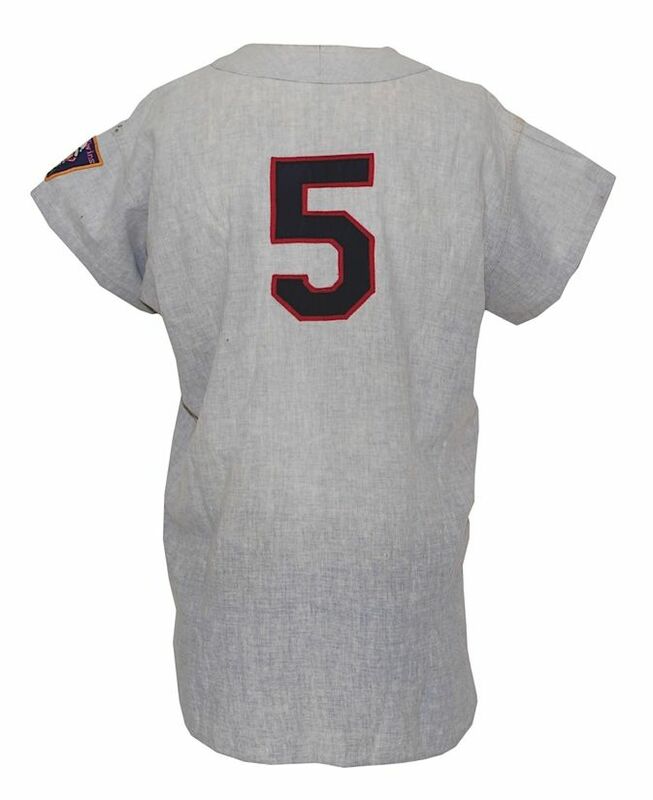 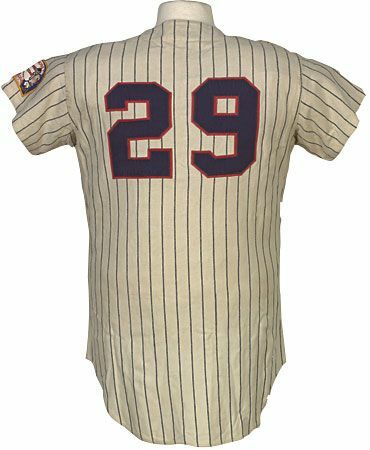 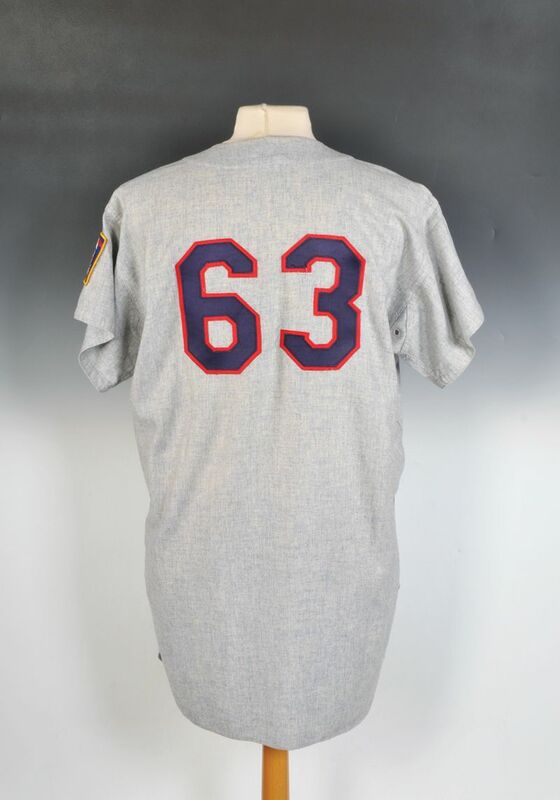 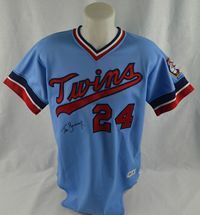 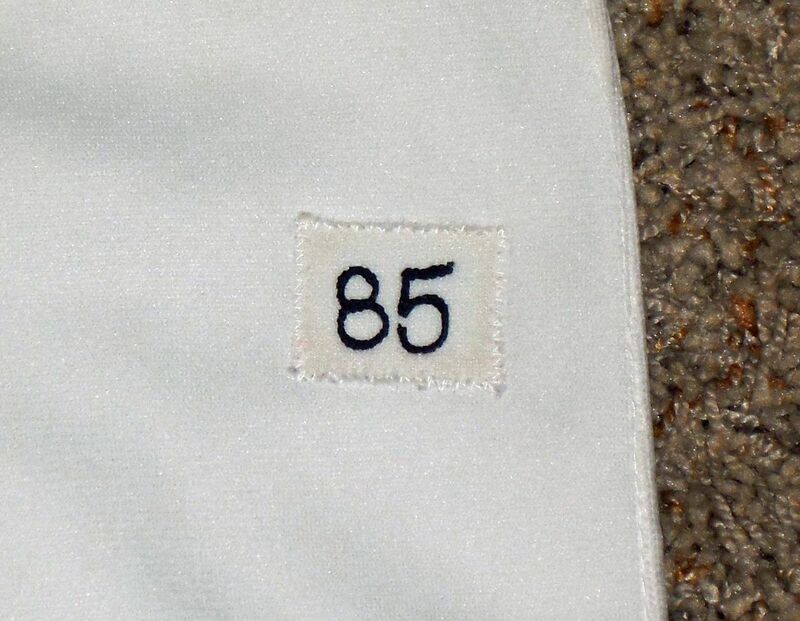 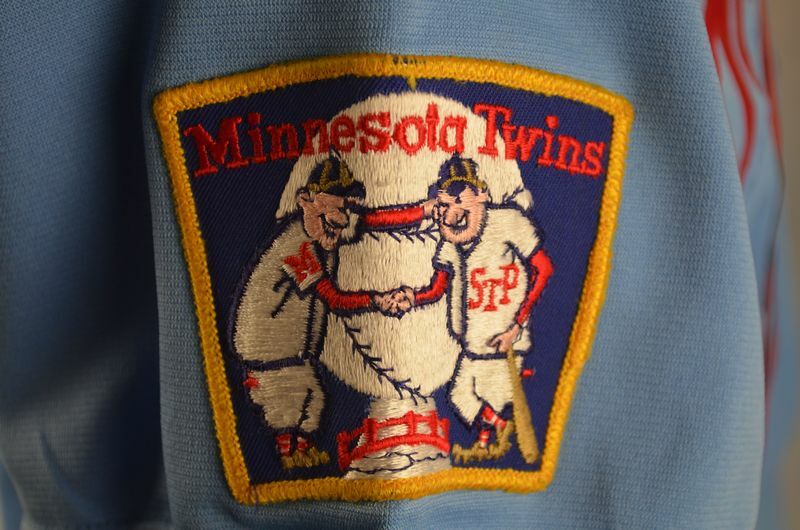 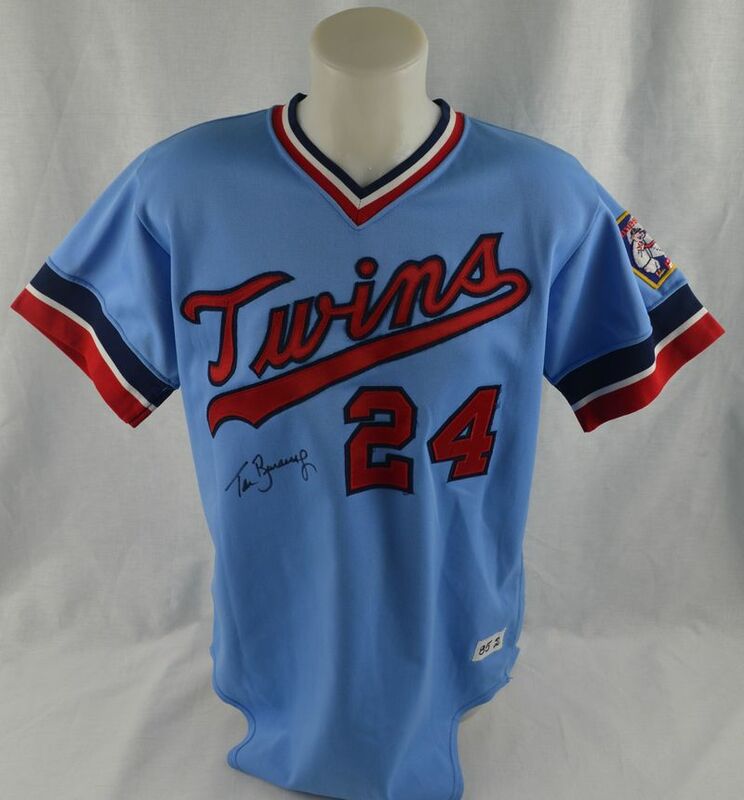 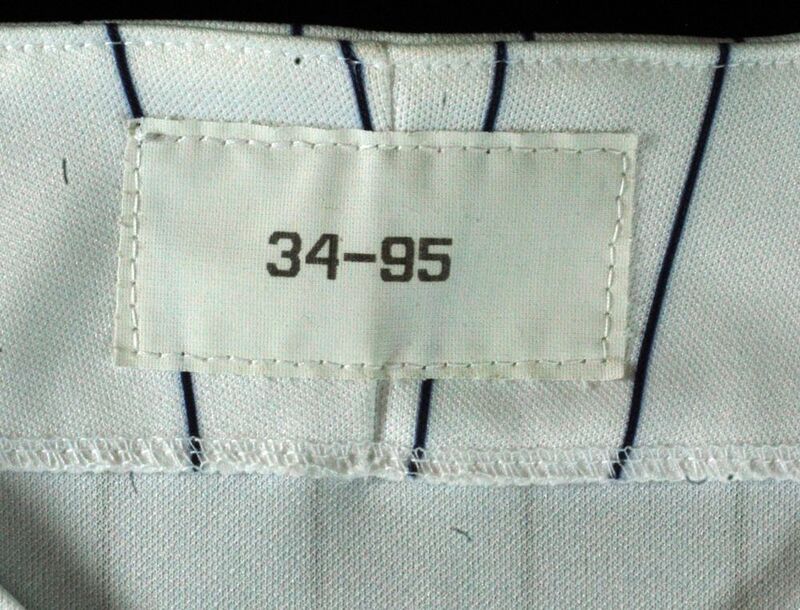 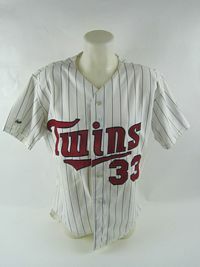 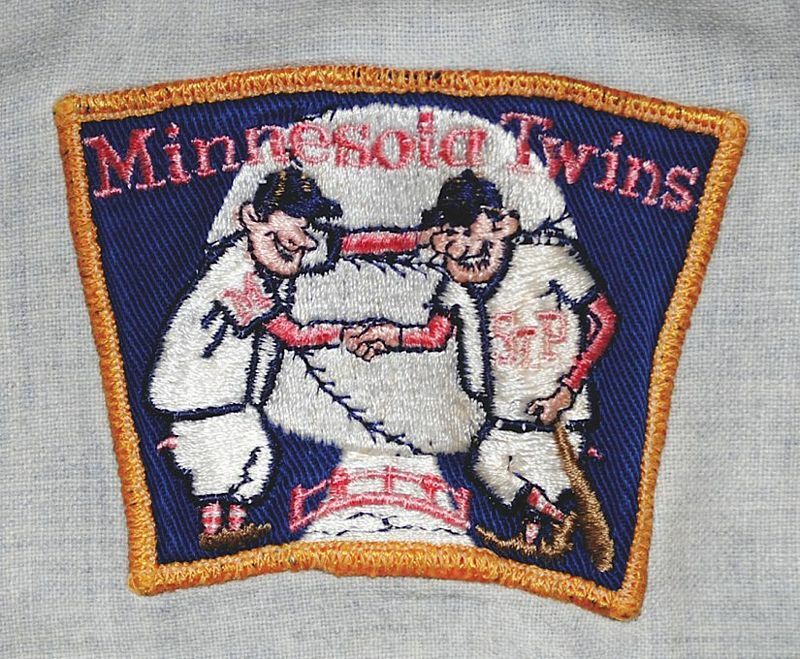 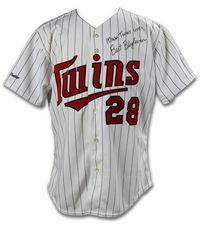 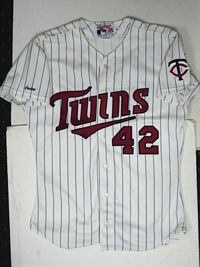 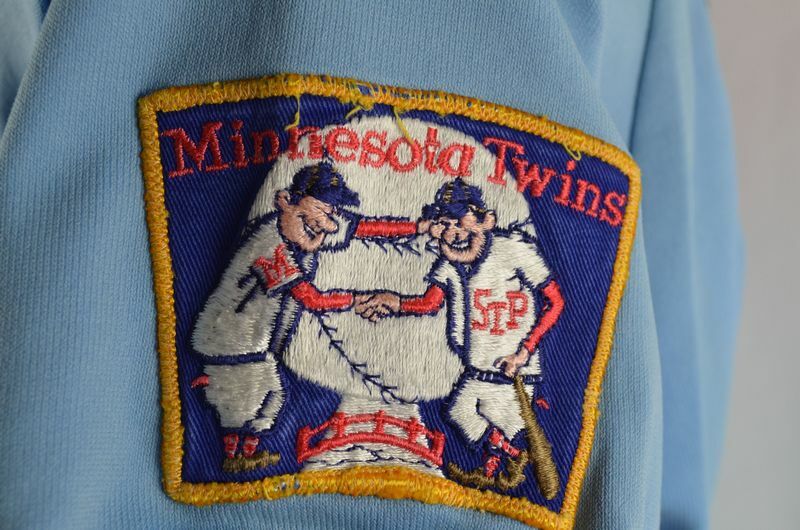 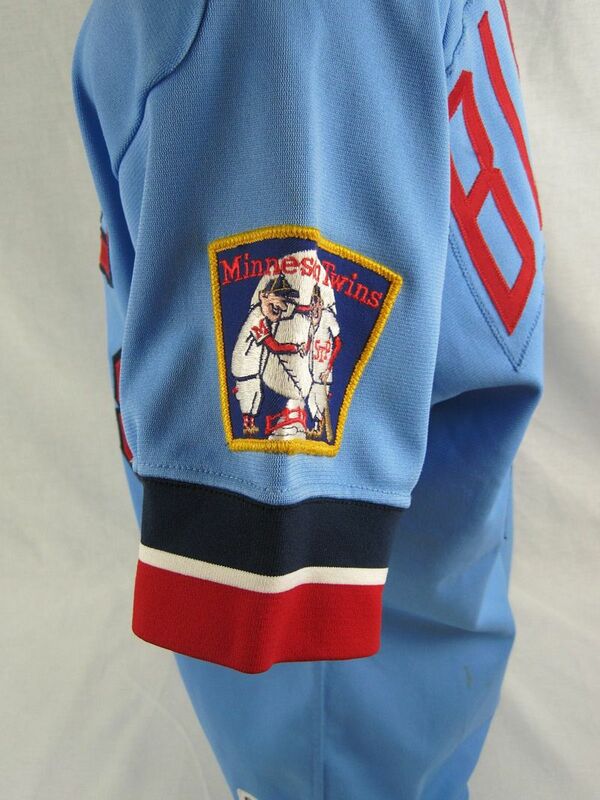 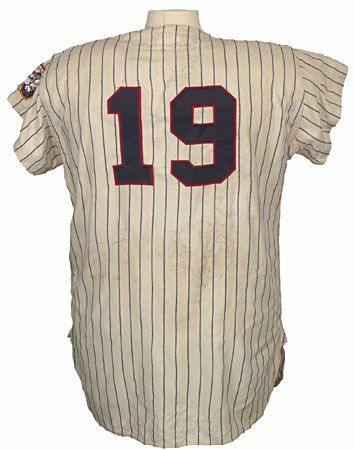 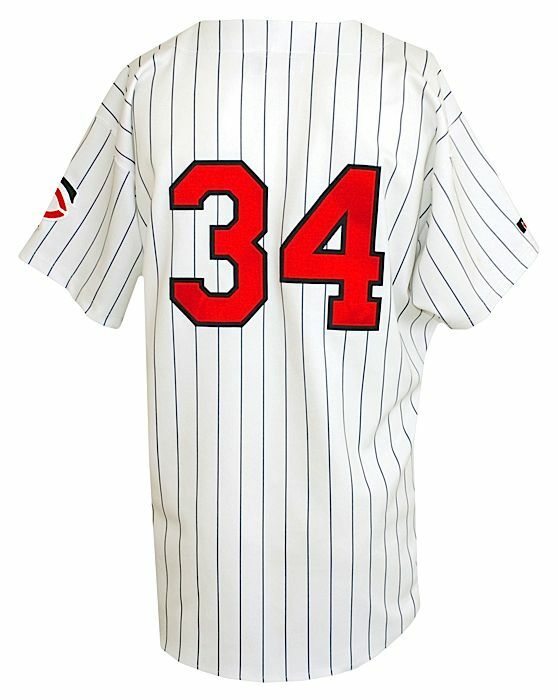 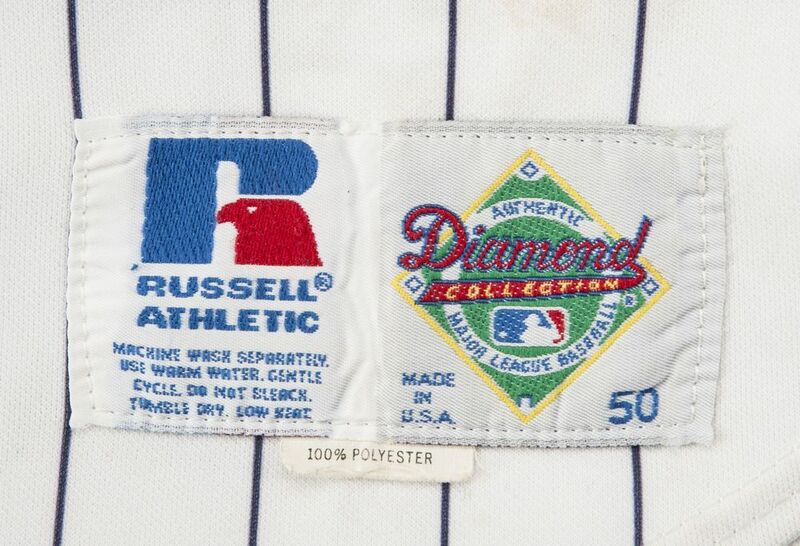 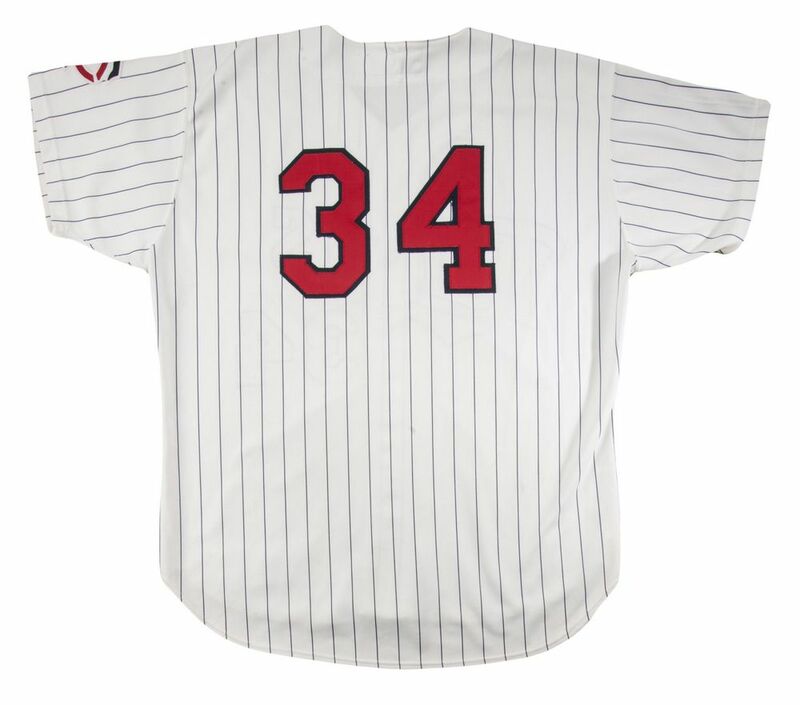 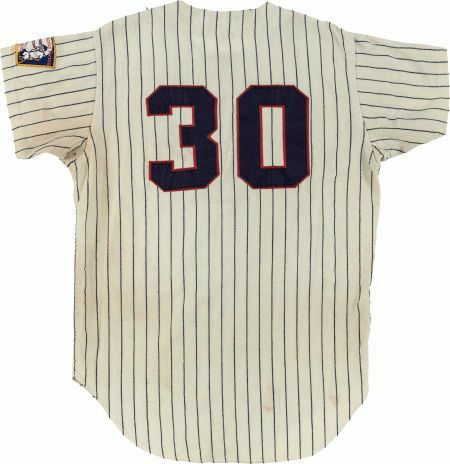 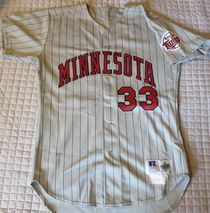 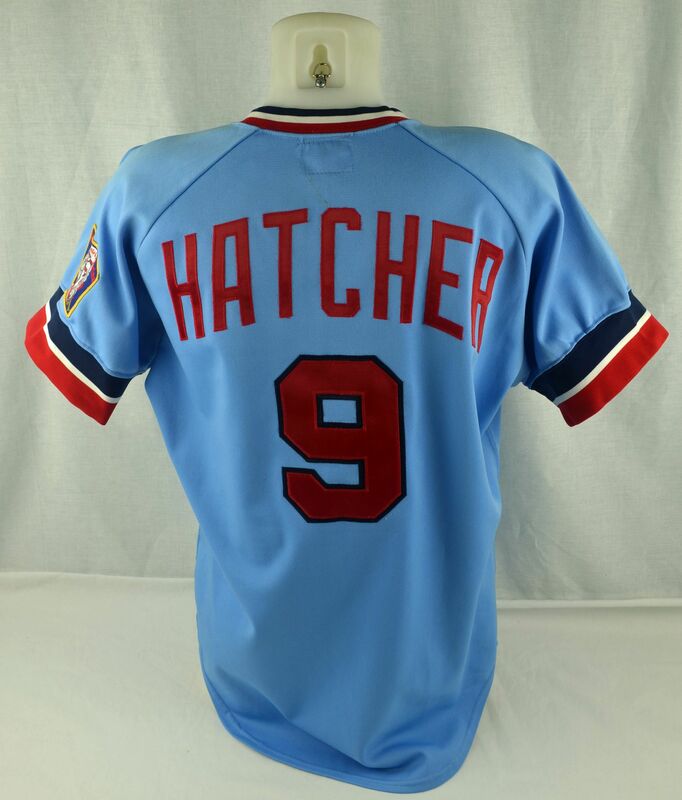 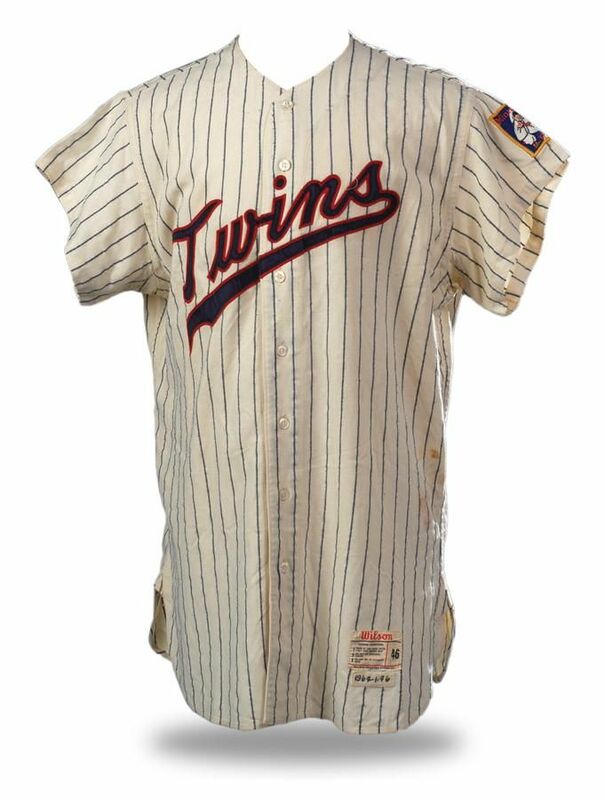 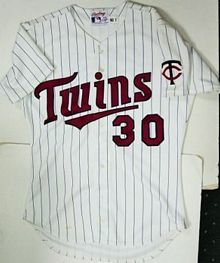 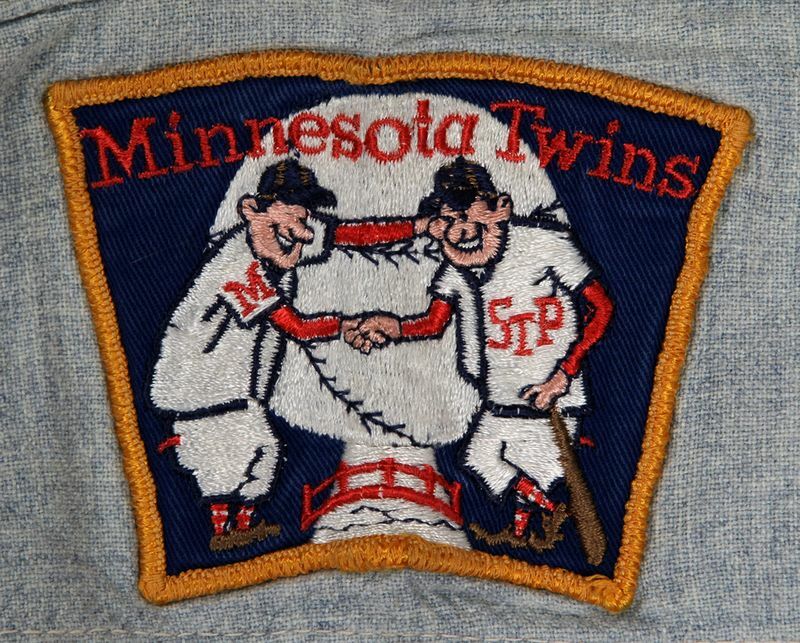 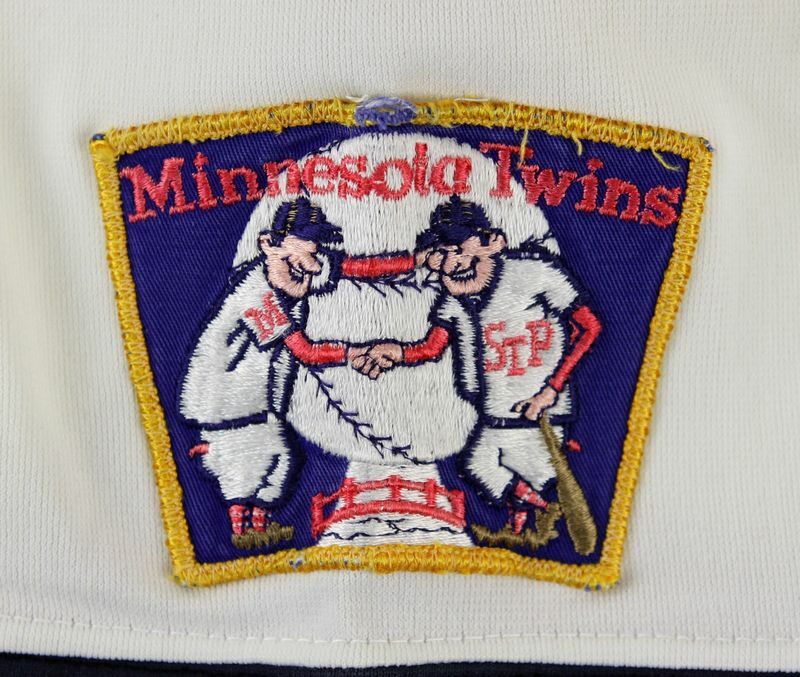 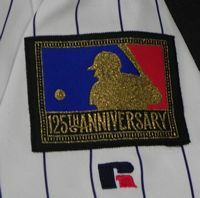 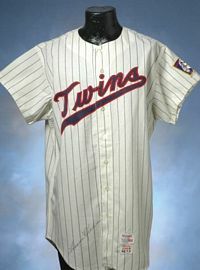 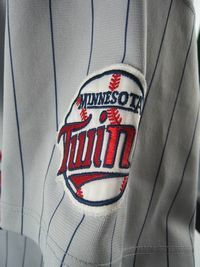 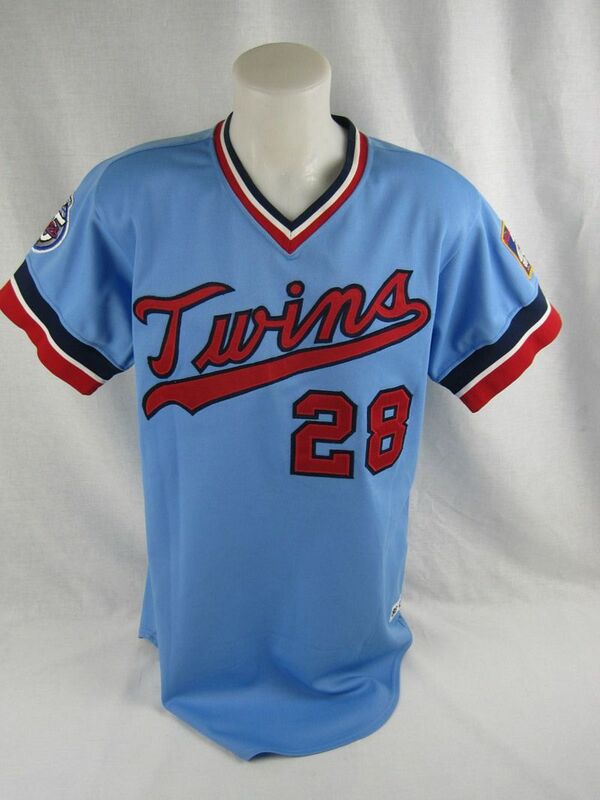 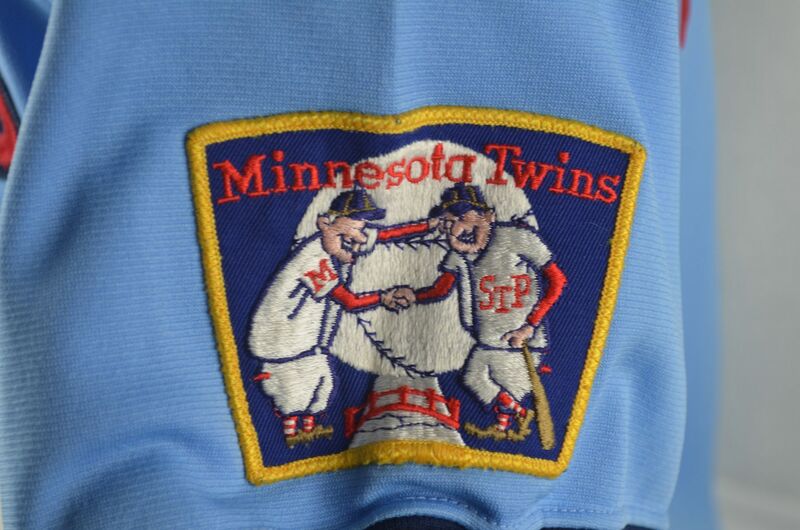 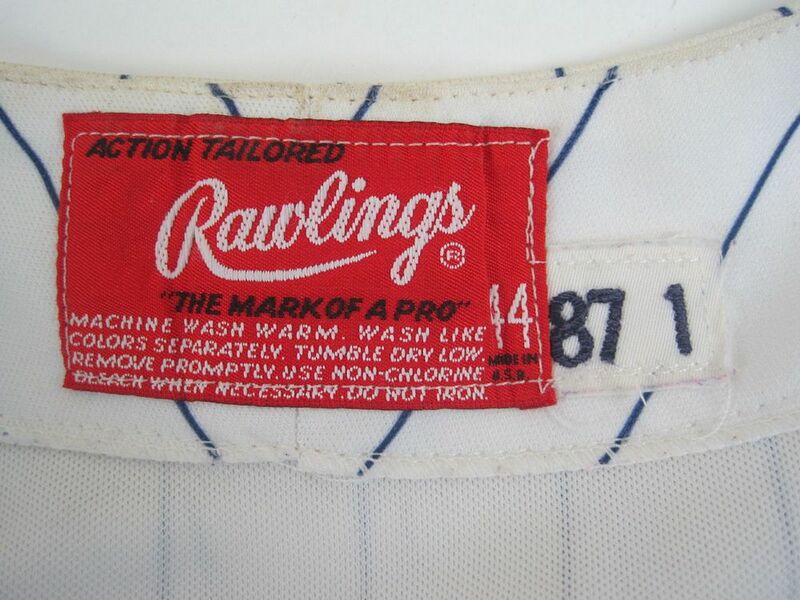 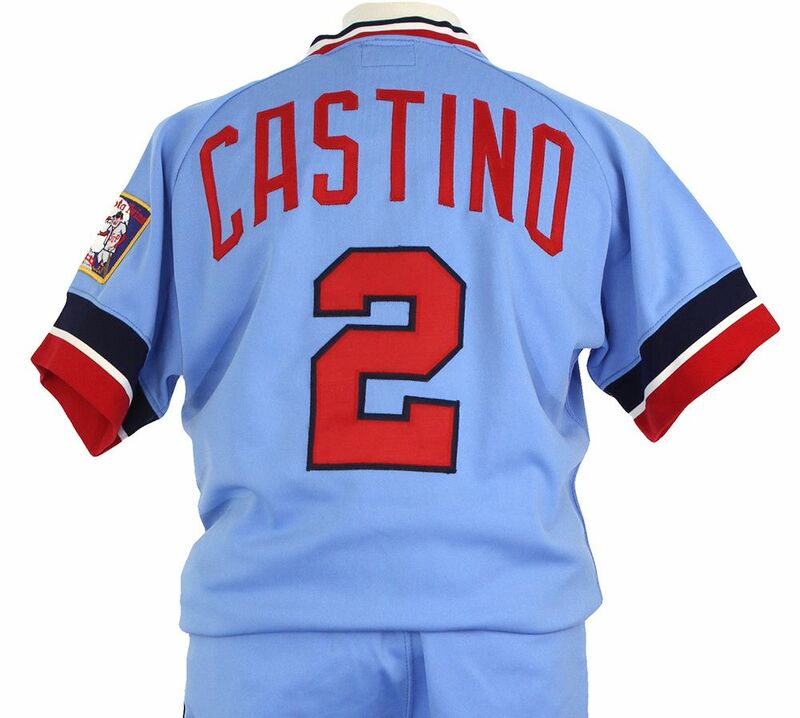 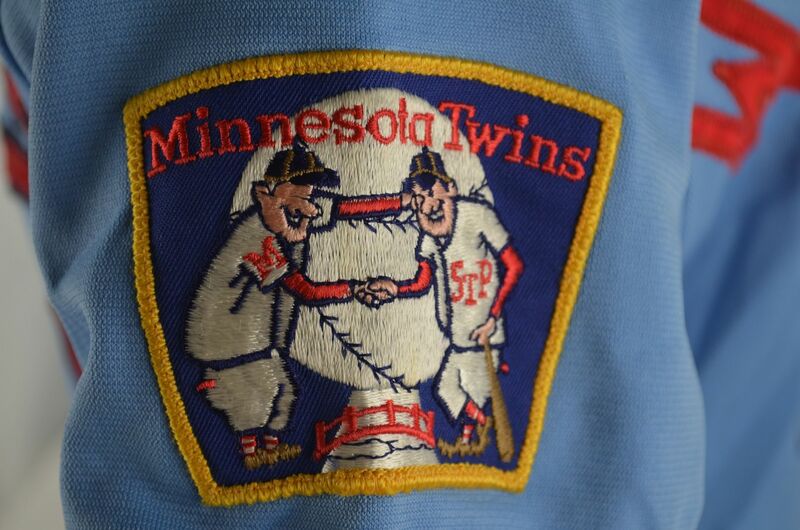 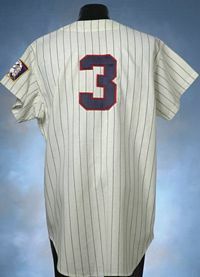 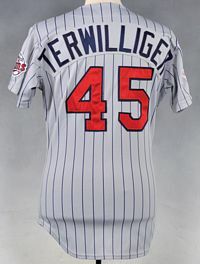 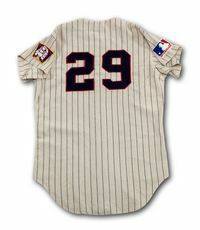 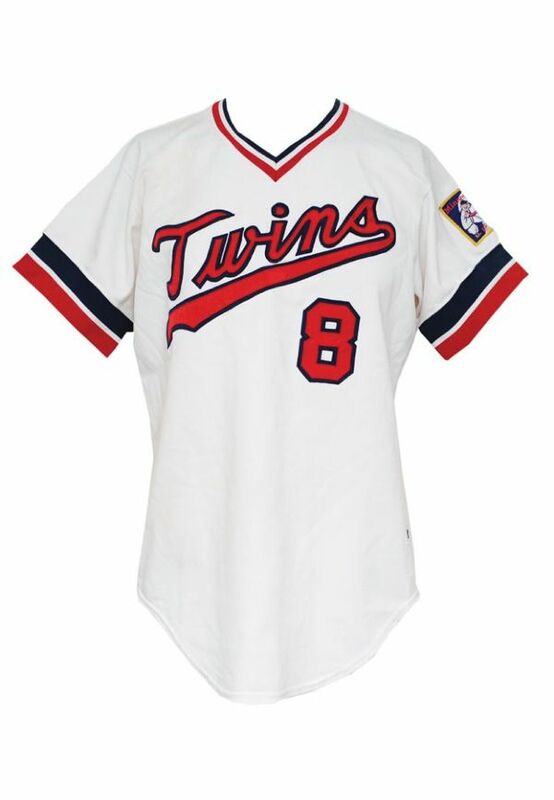 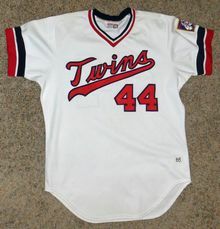 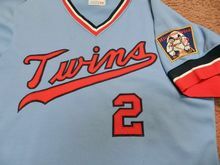 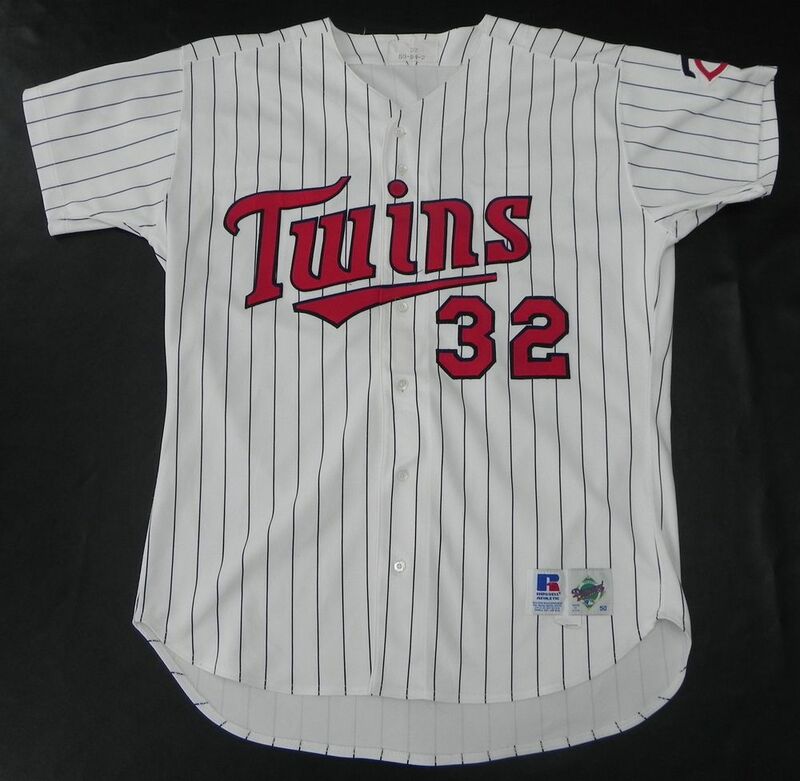 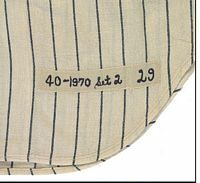 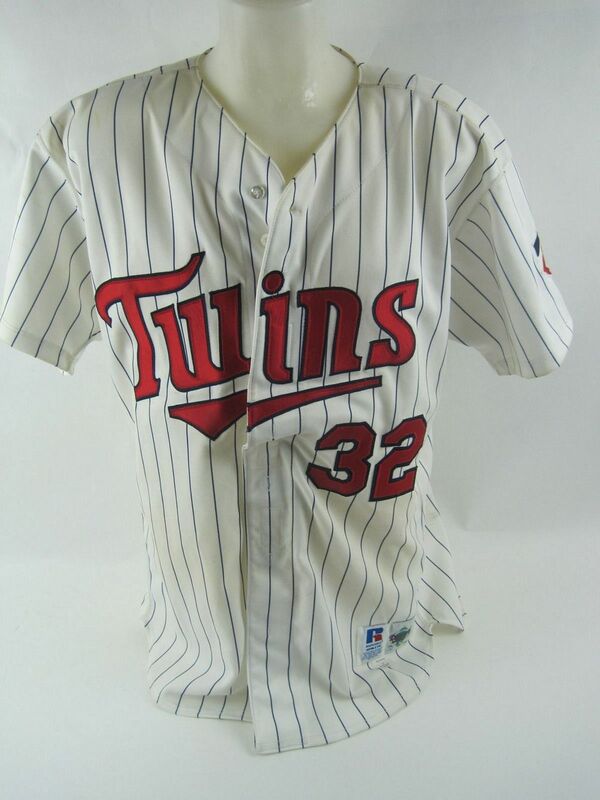 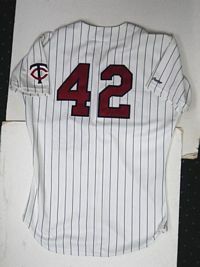 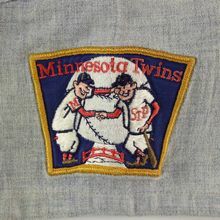 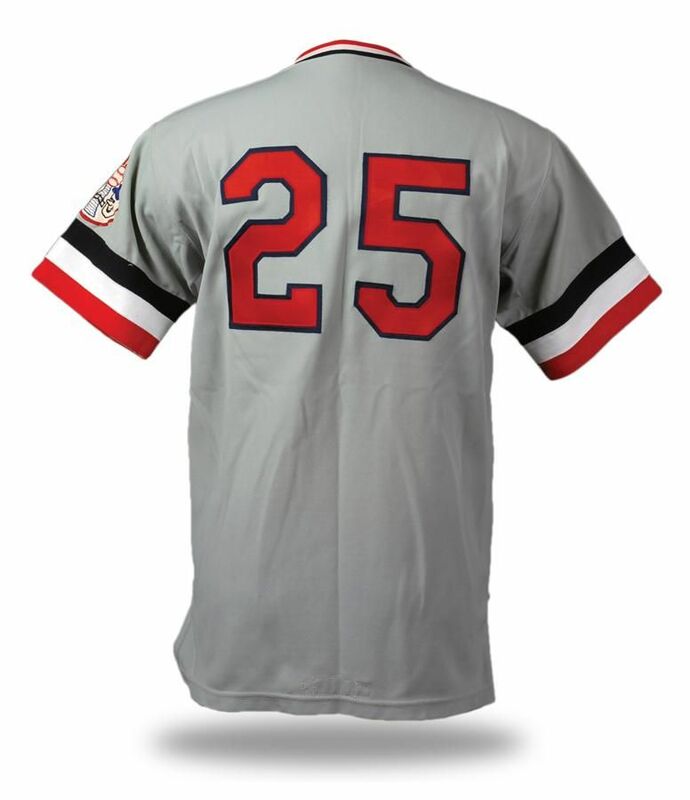 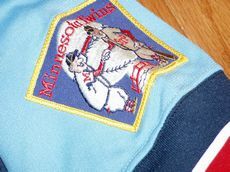 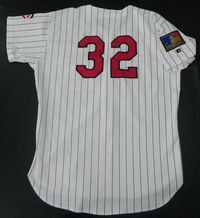 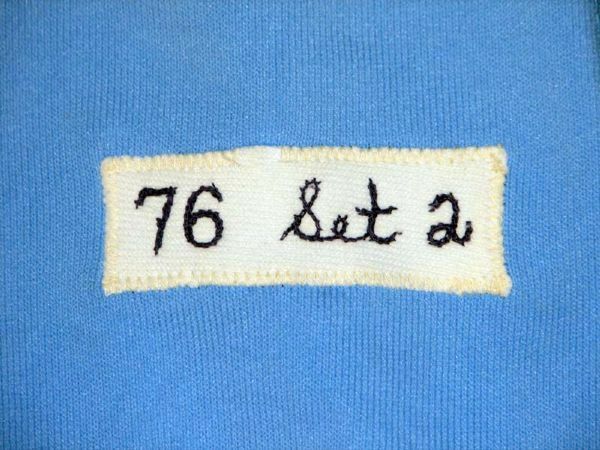 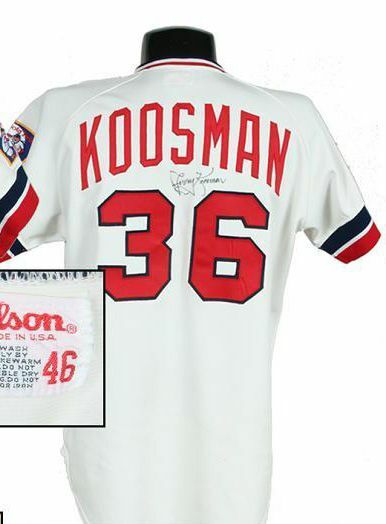 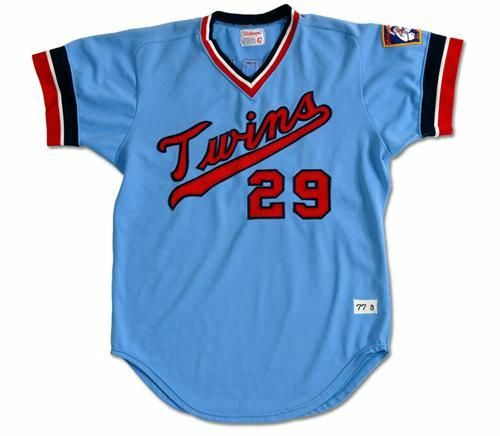 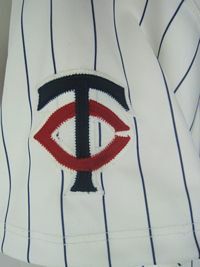 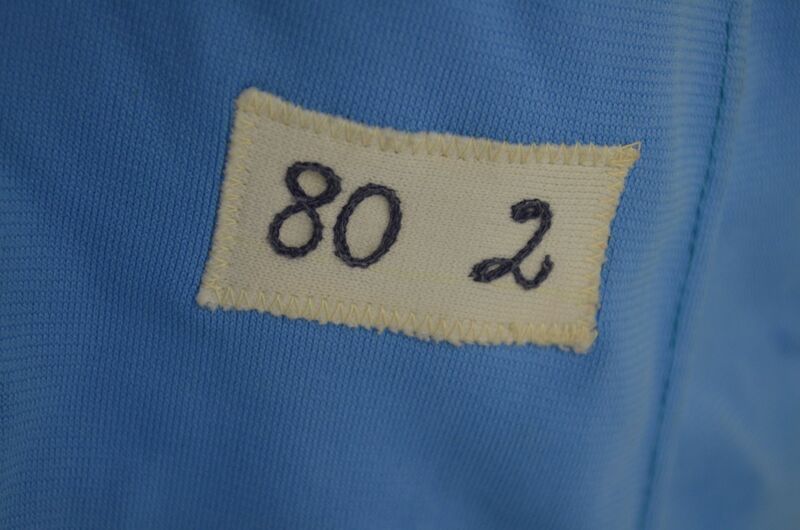 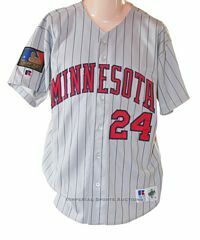 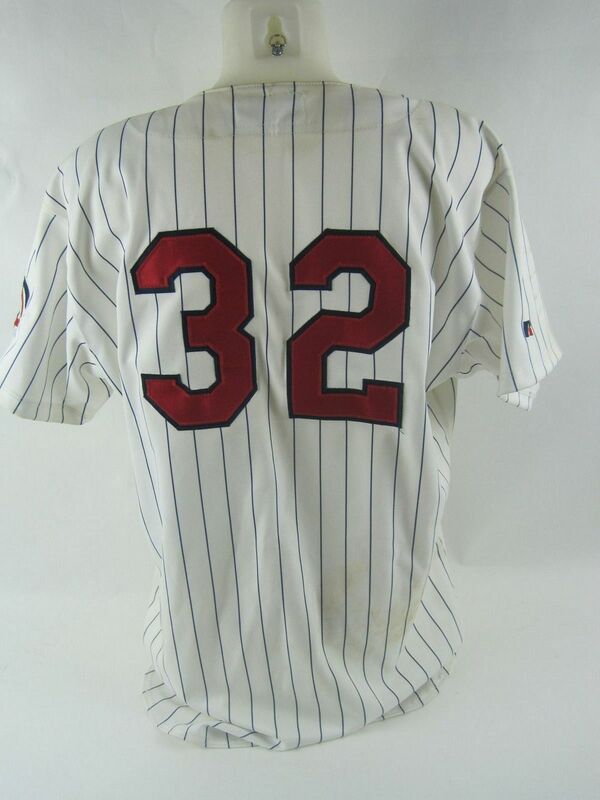 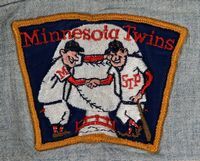 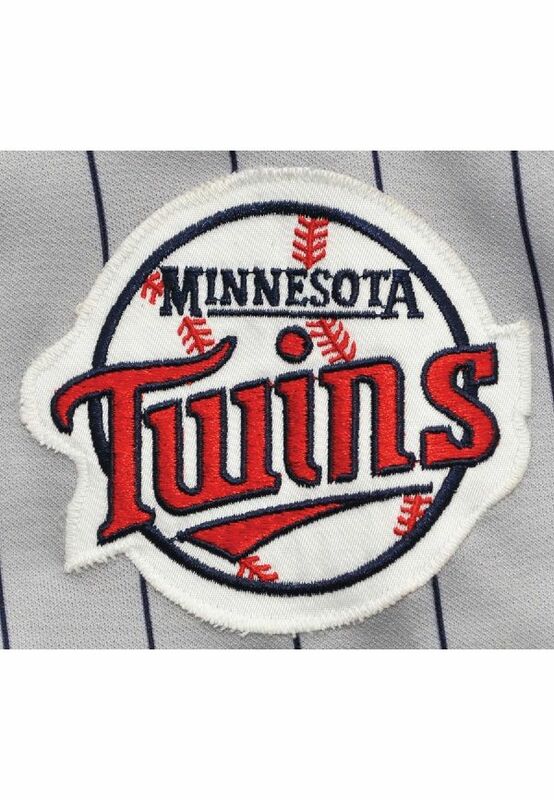 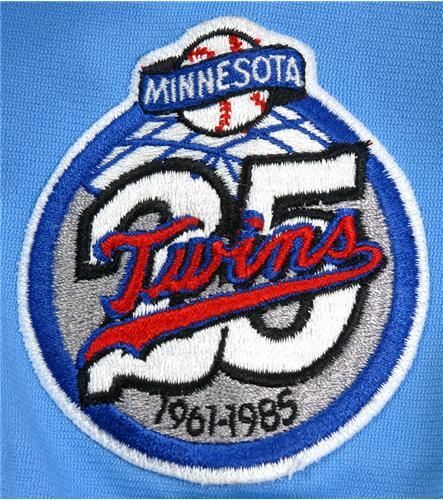 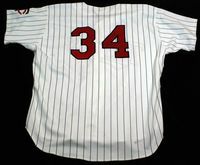 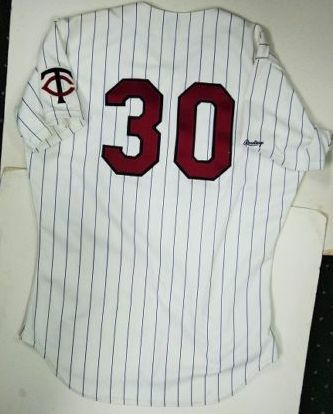 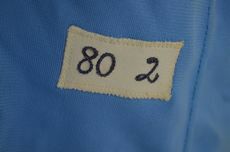 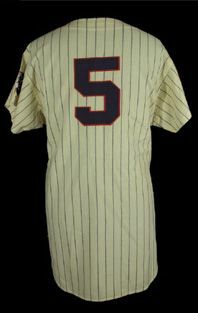 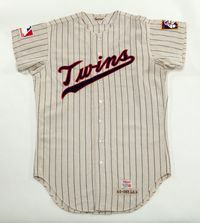 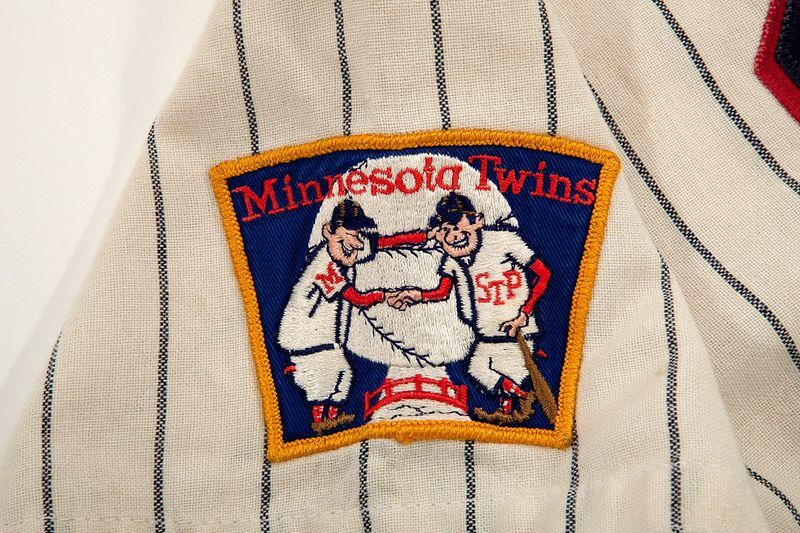 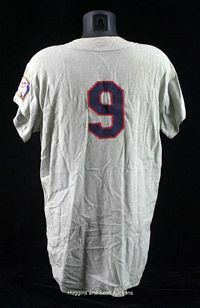 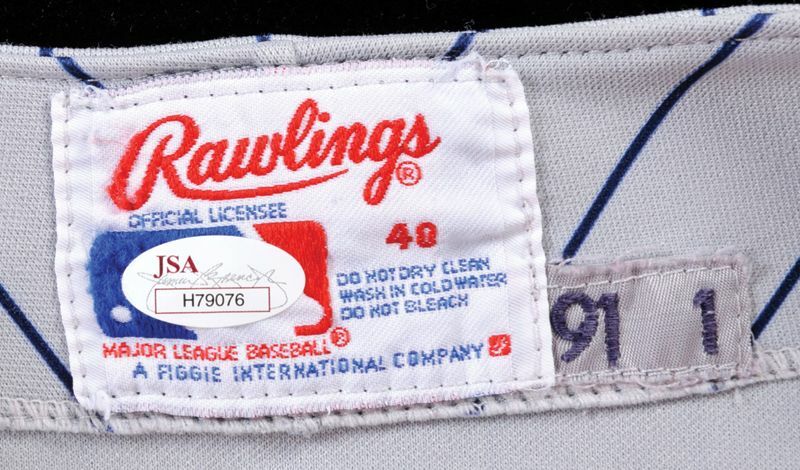 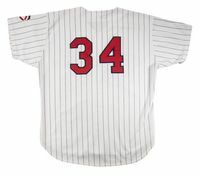 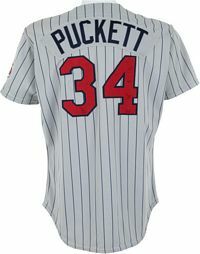 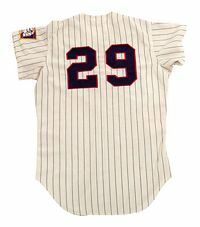 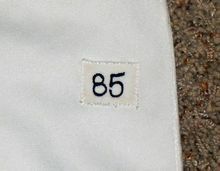 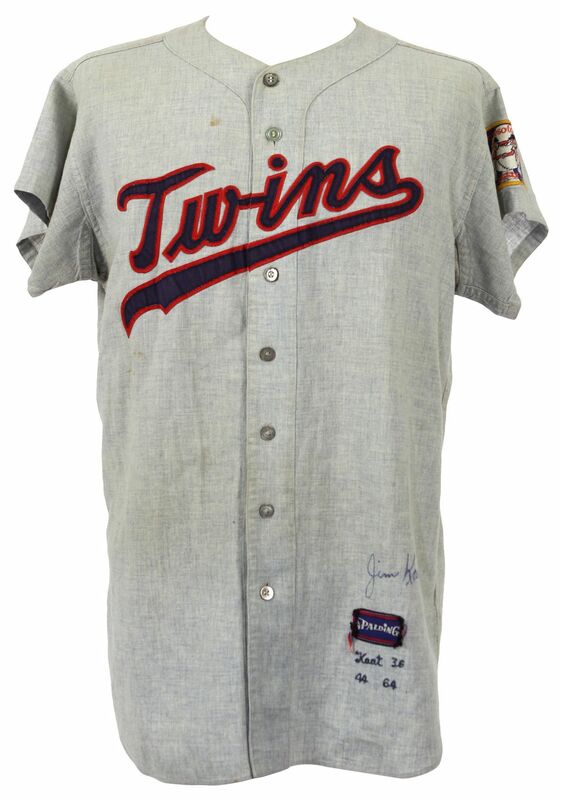 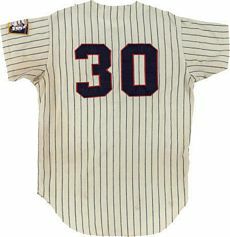 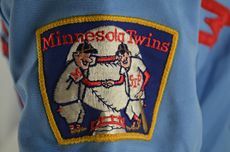 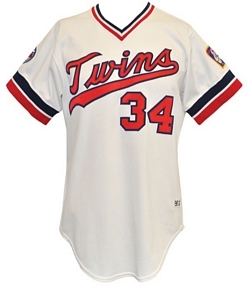 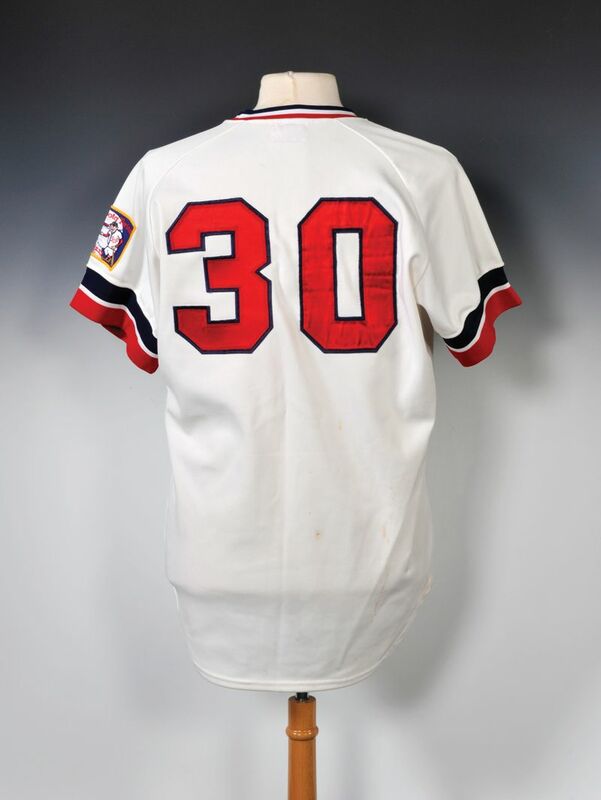 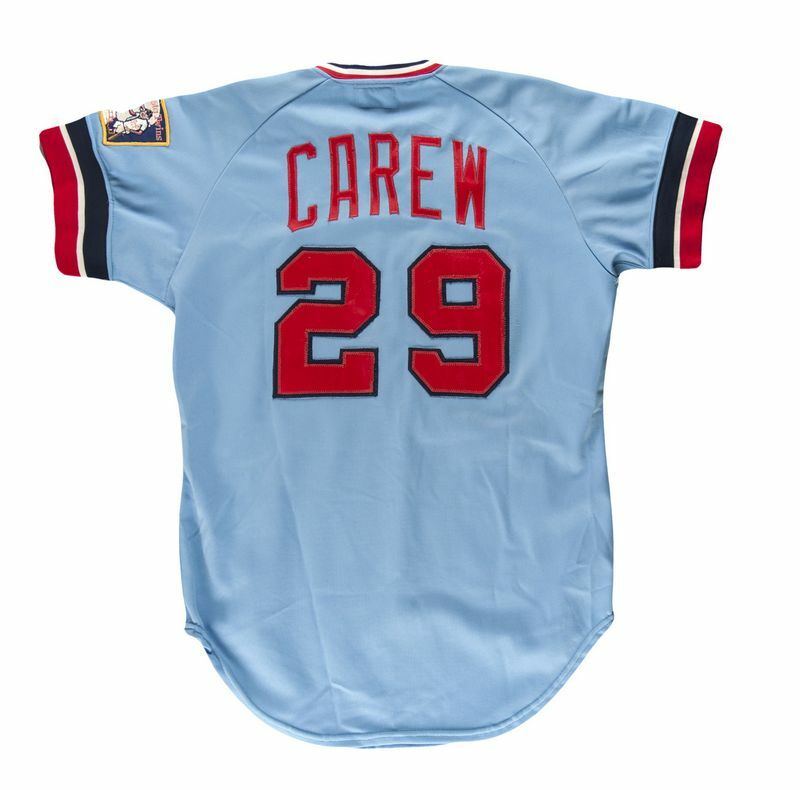 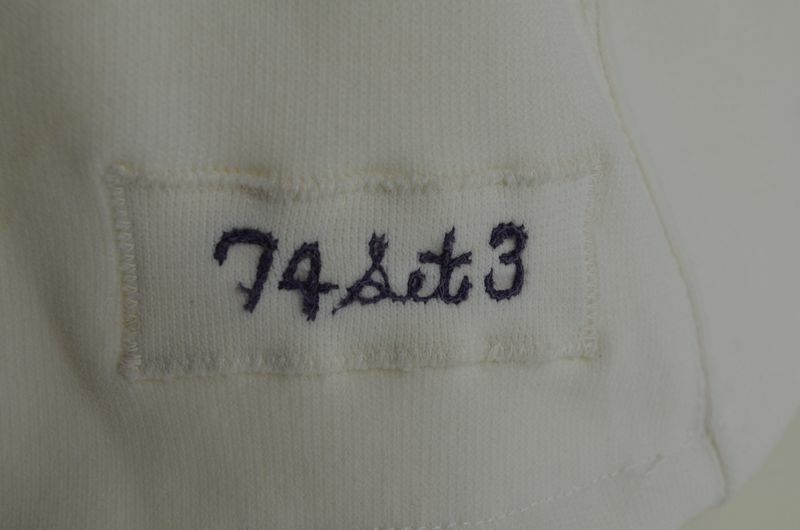 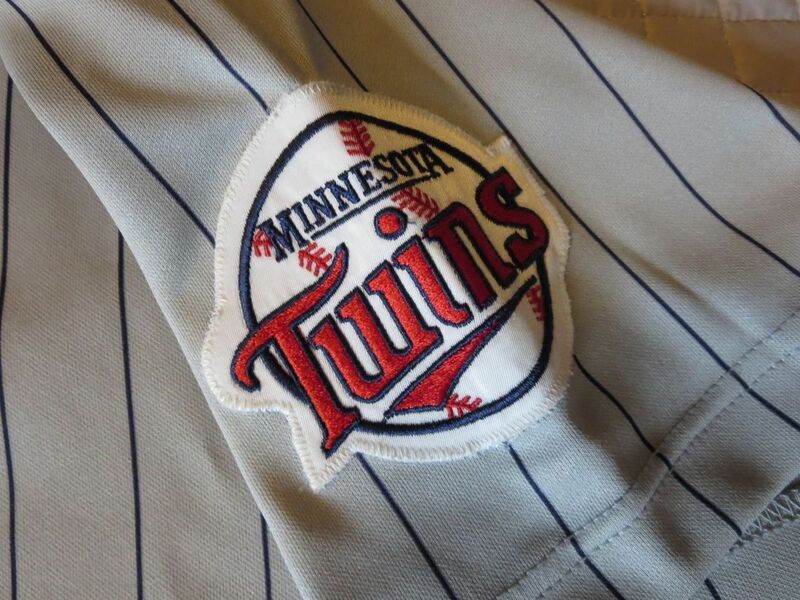 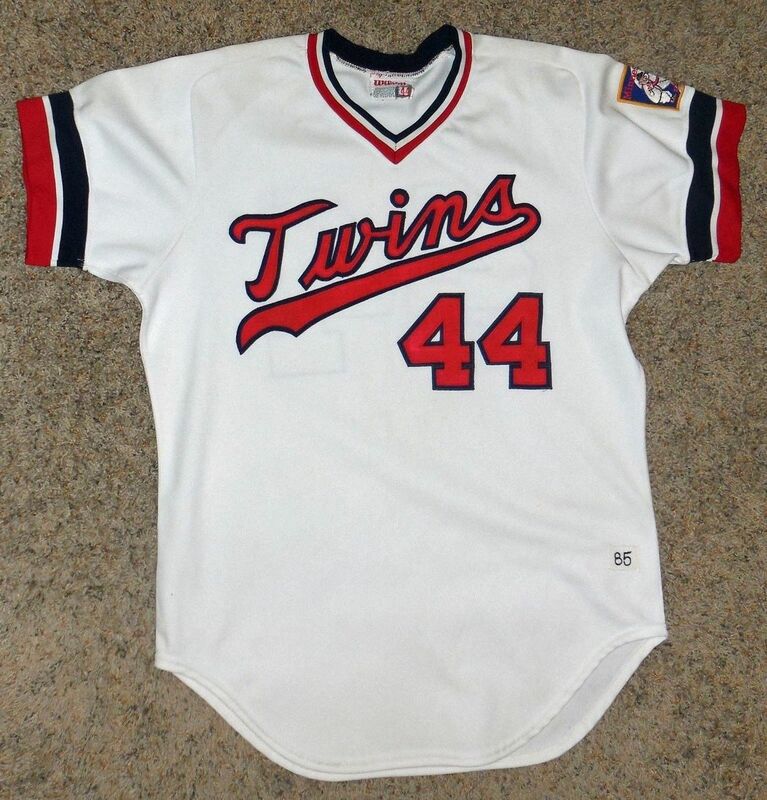 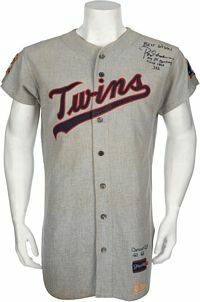 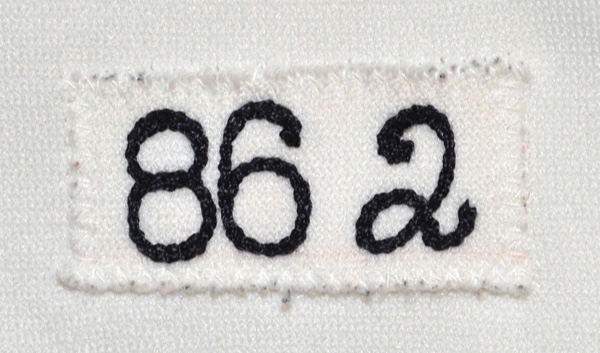 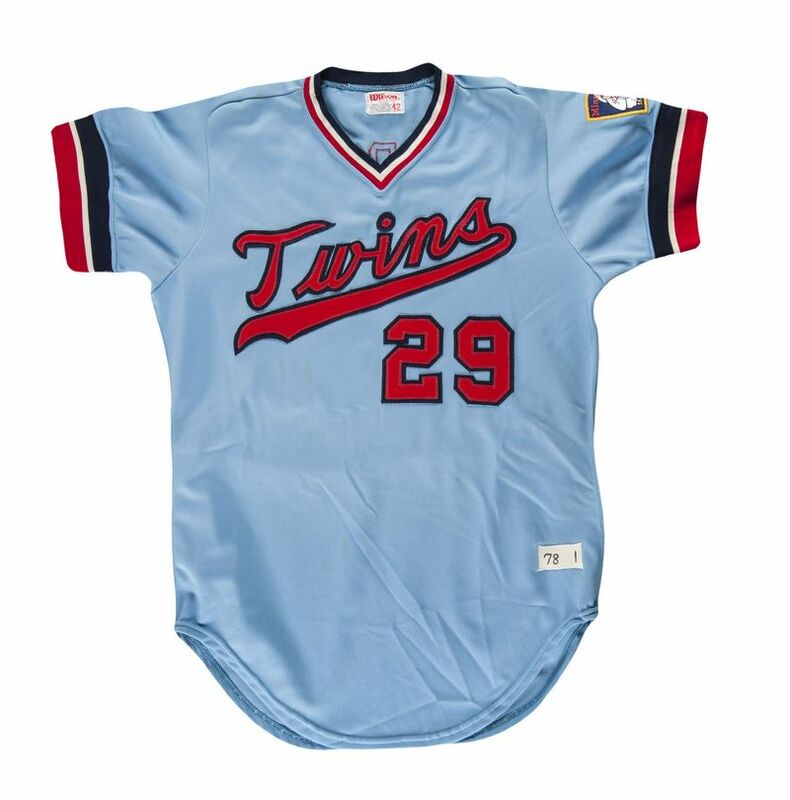 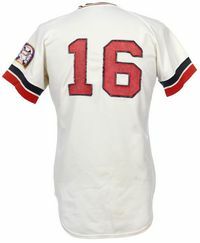 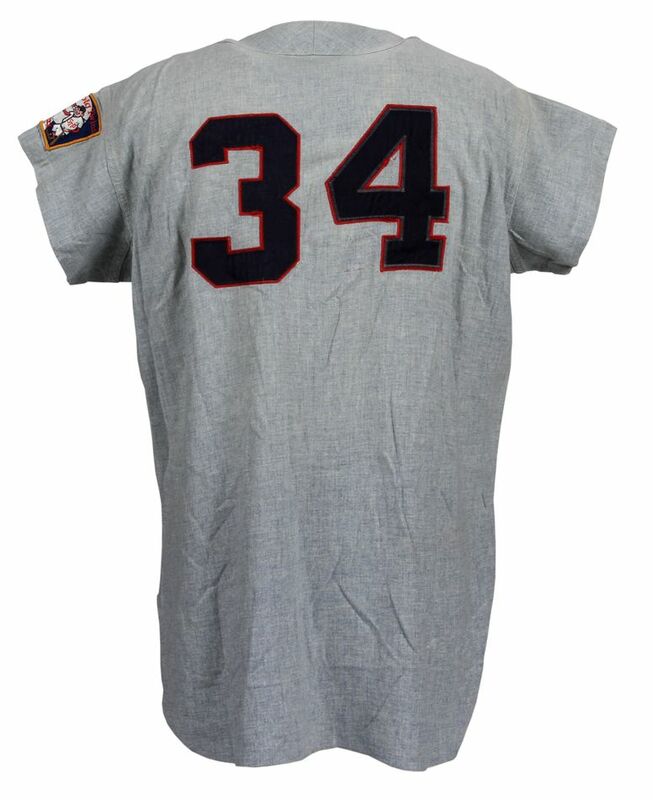 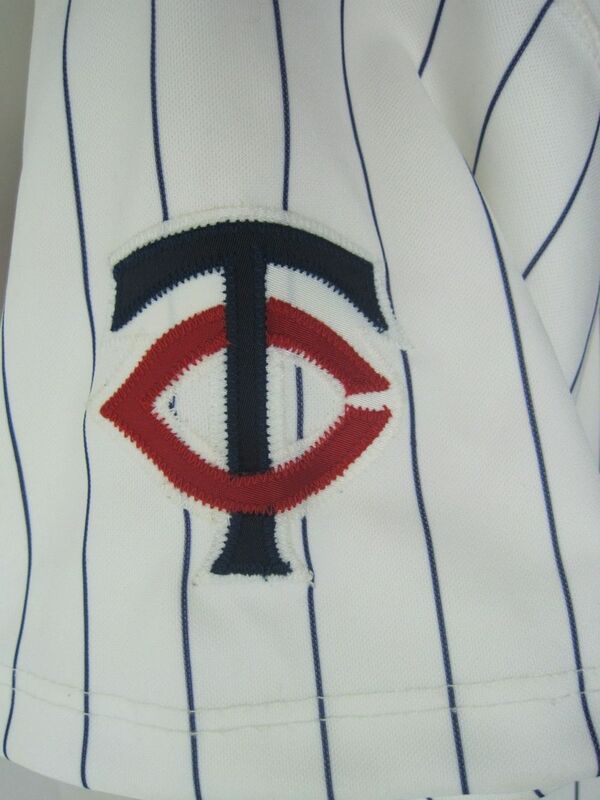 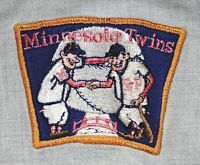 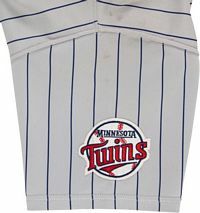 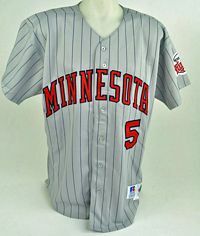 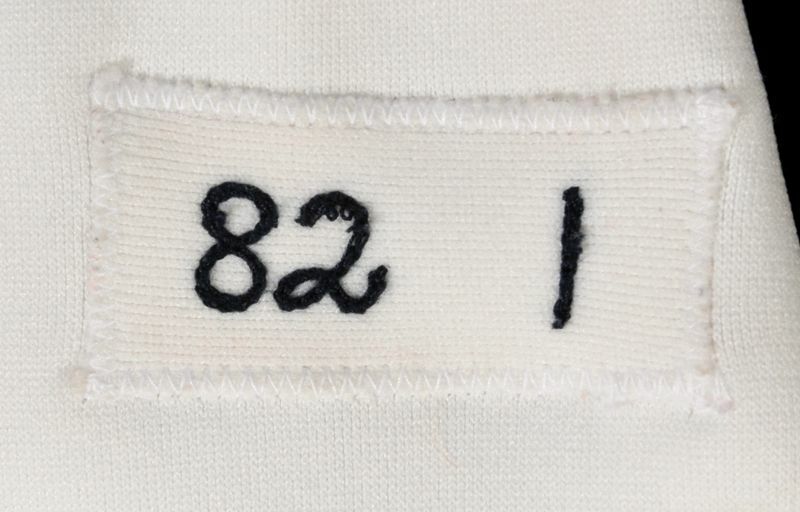 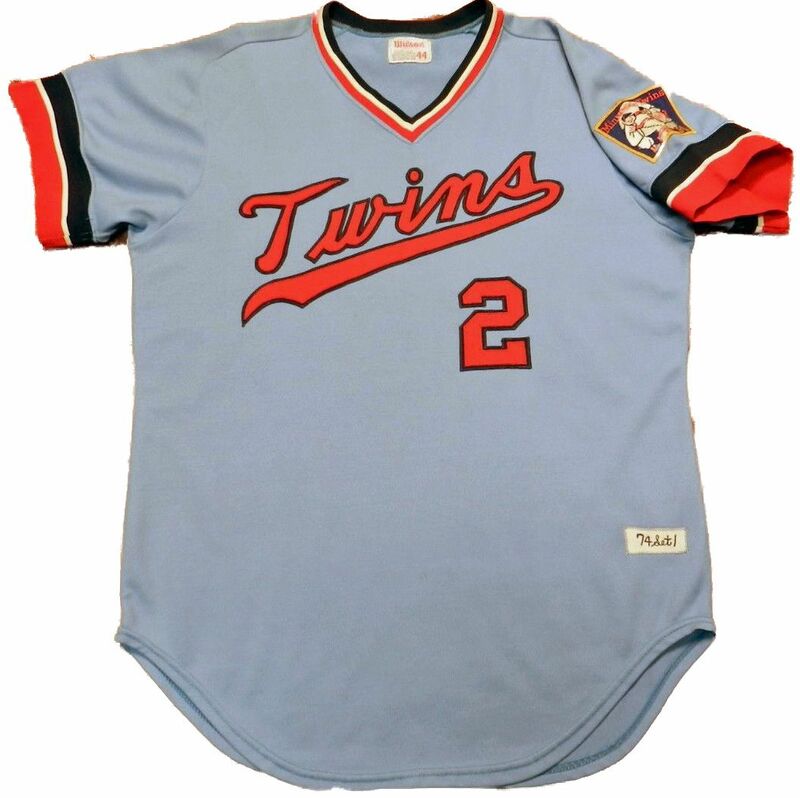 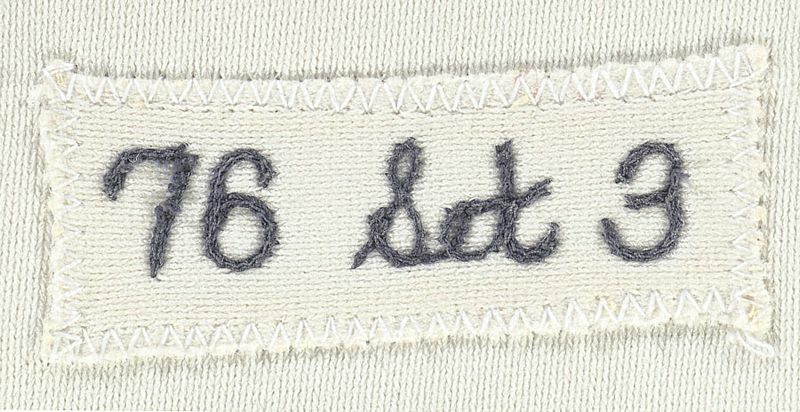 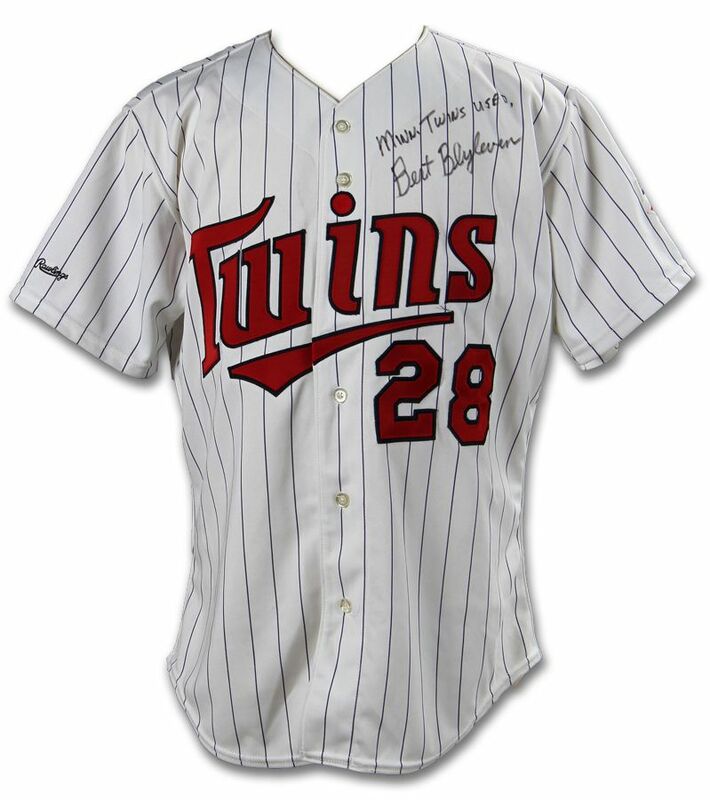 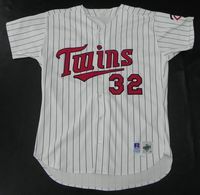 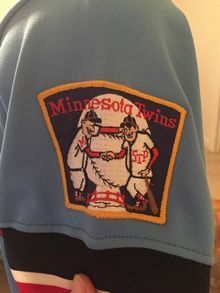 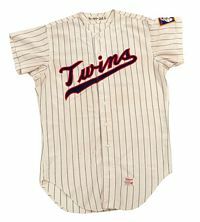 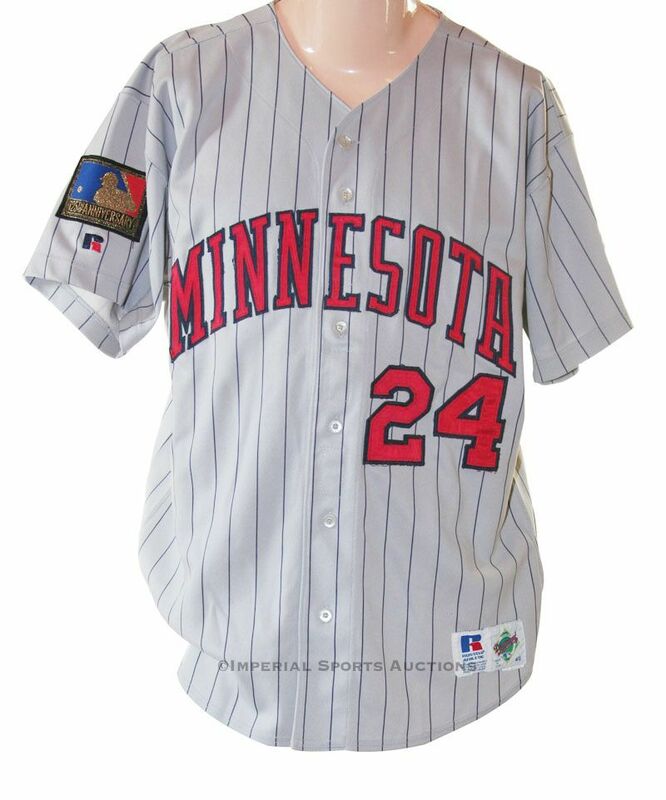 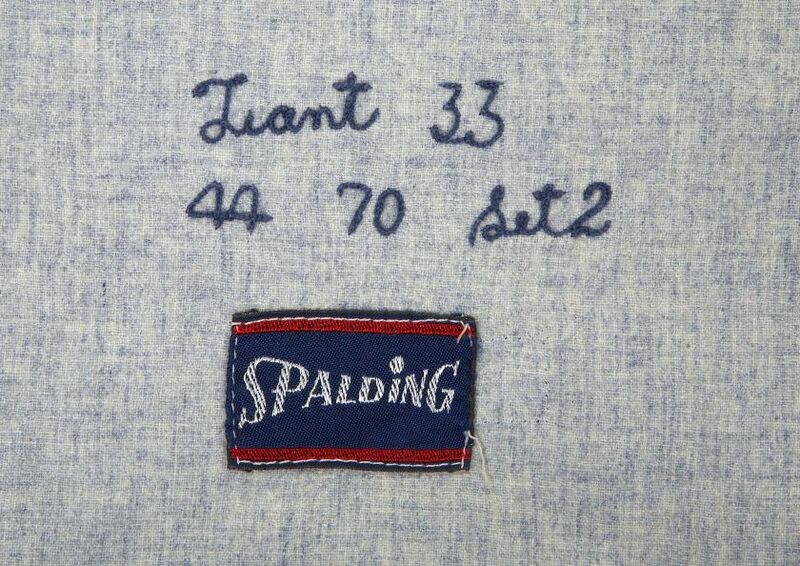 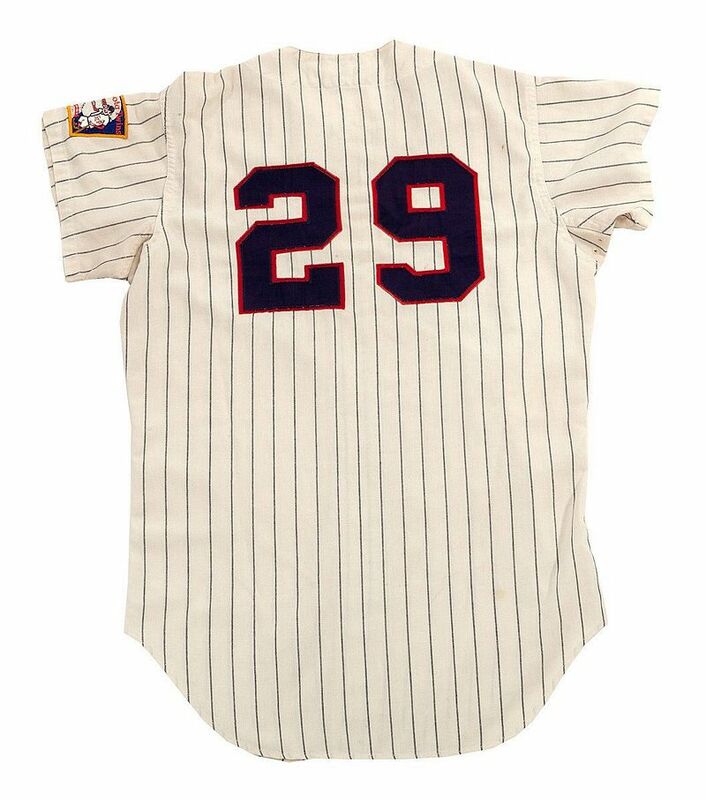 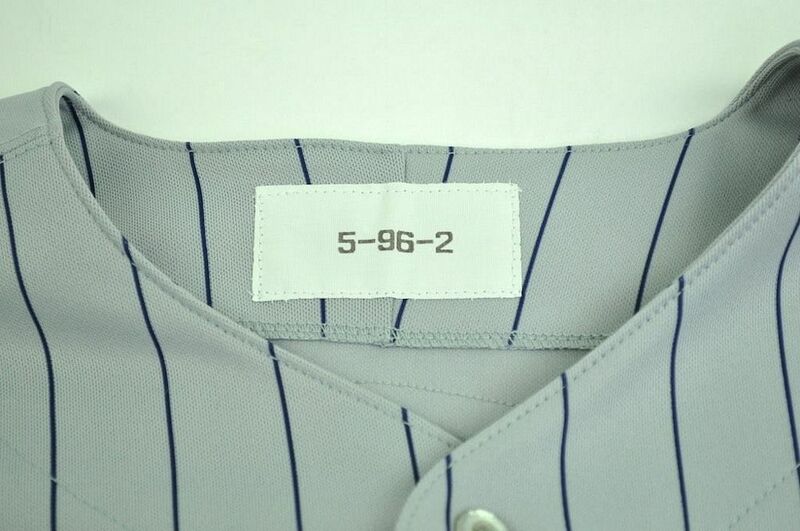 25th anniversary patch sleeve patch is worn on the 1986 (yes 1986, not 1985) jerseys. 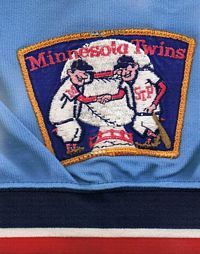 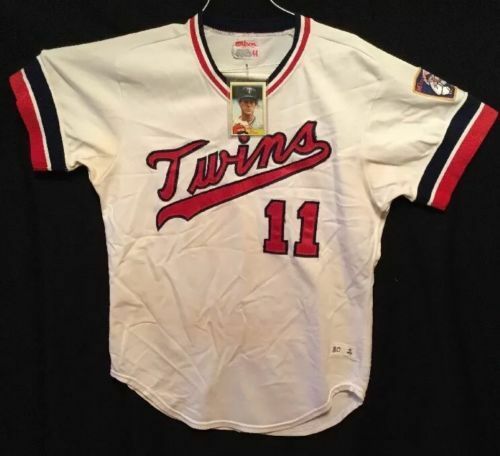 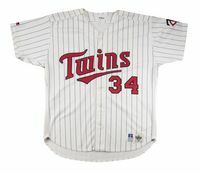 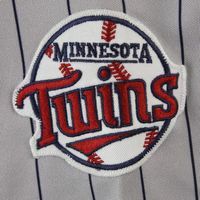 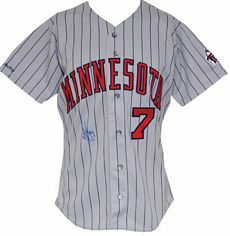 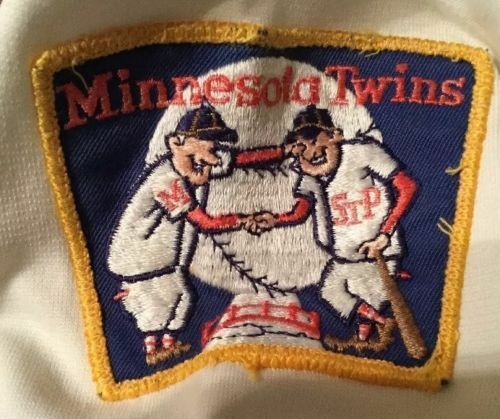 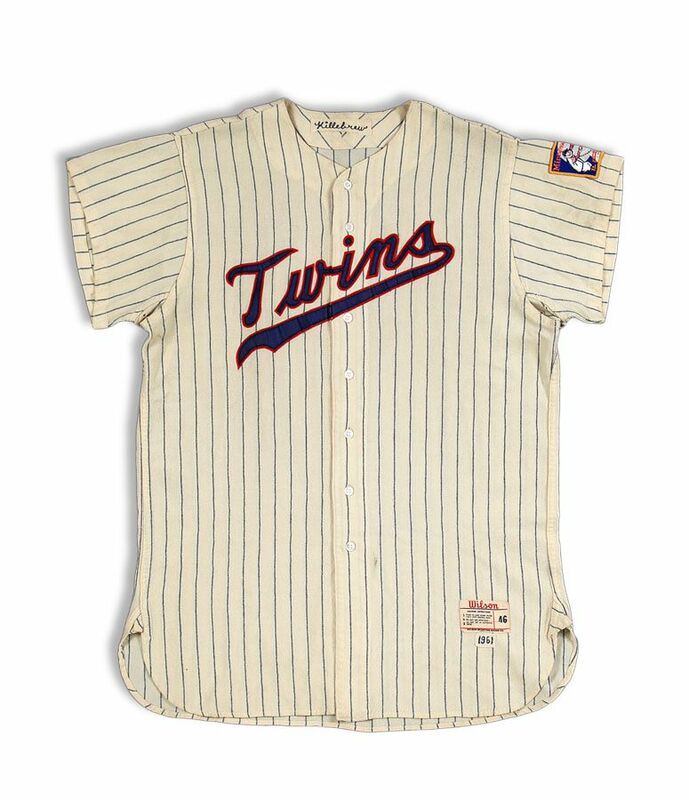 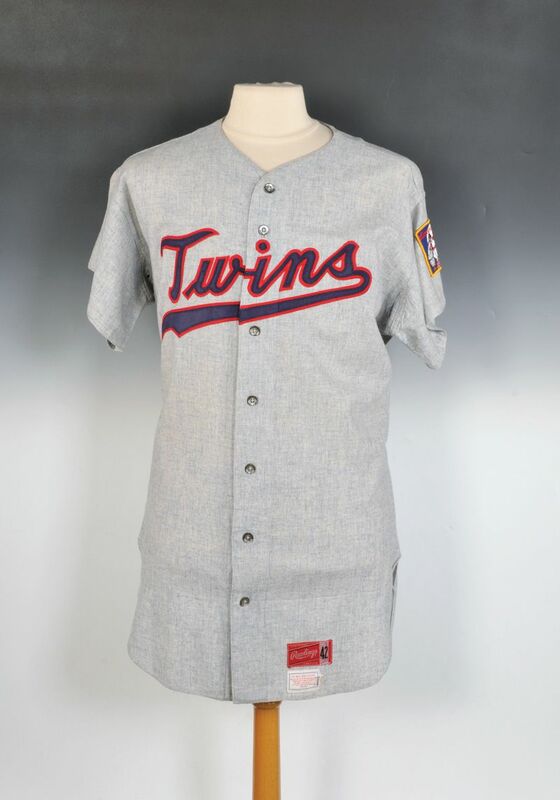 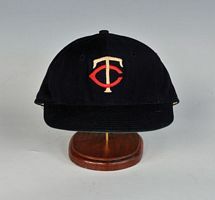 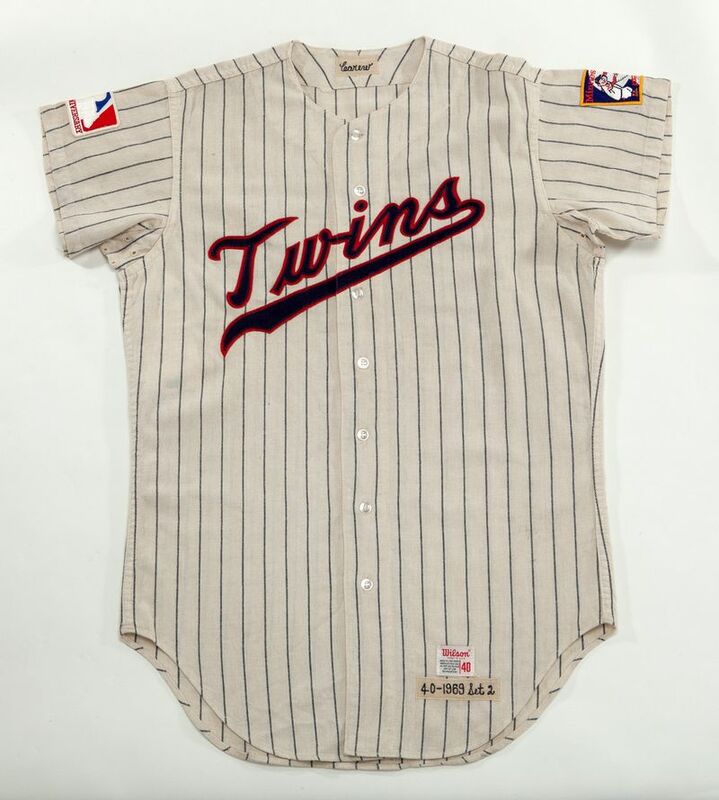 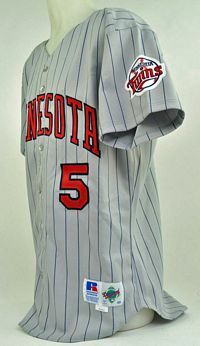 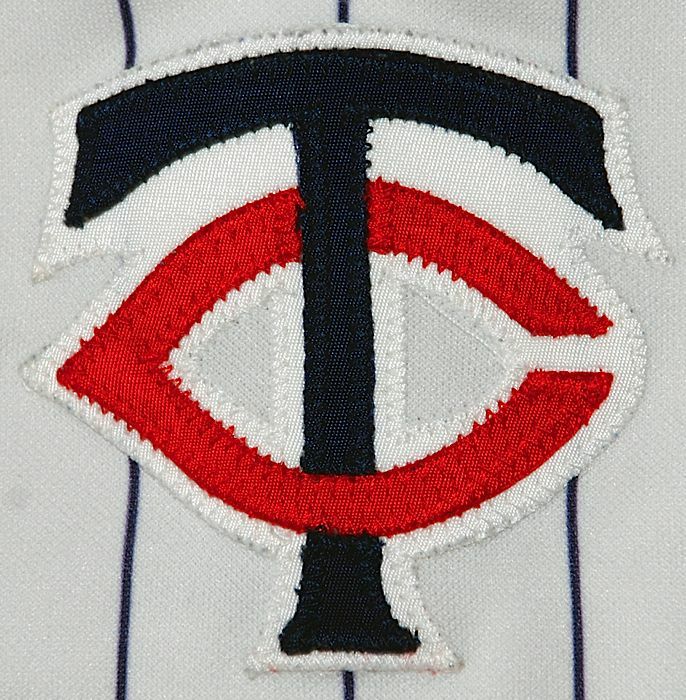 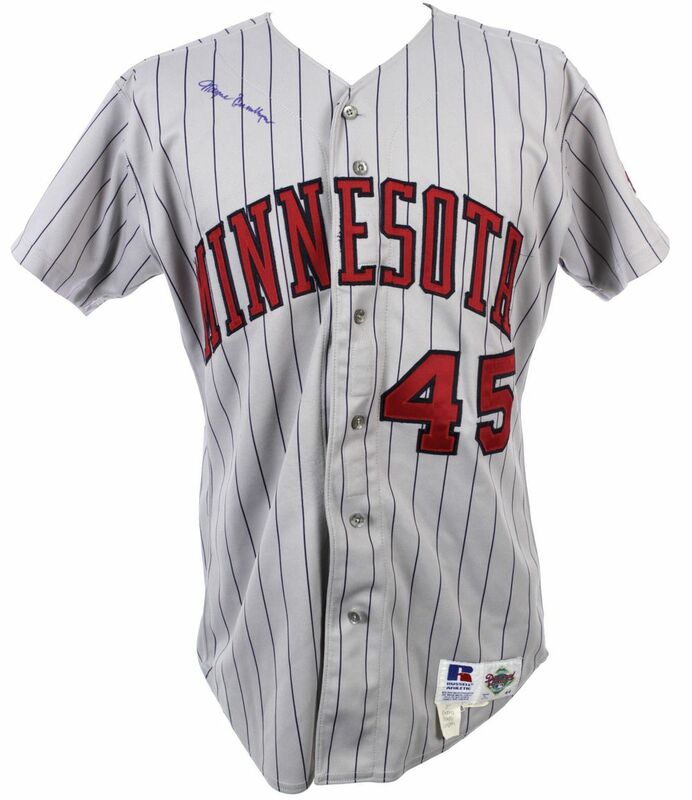 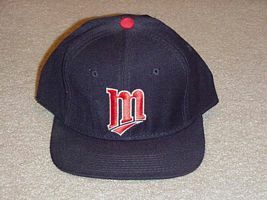 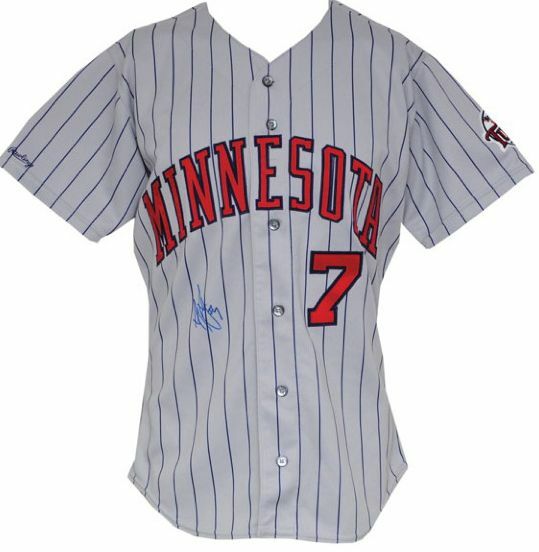 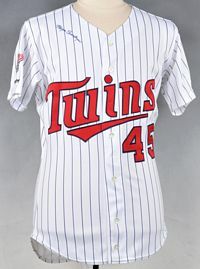 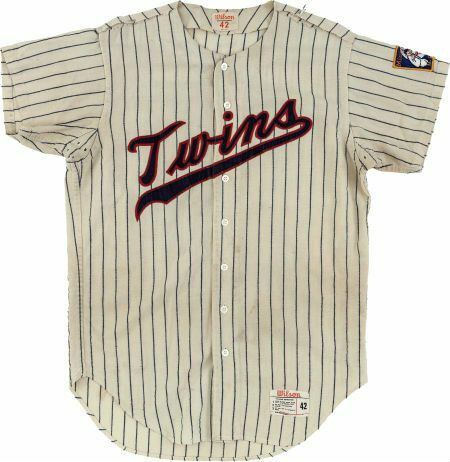 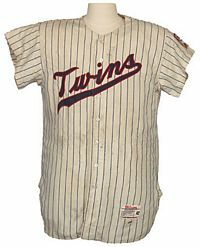 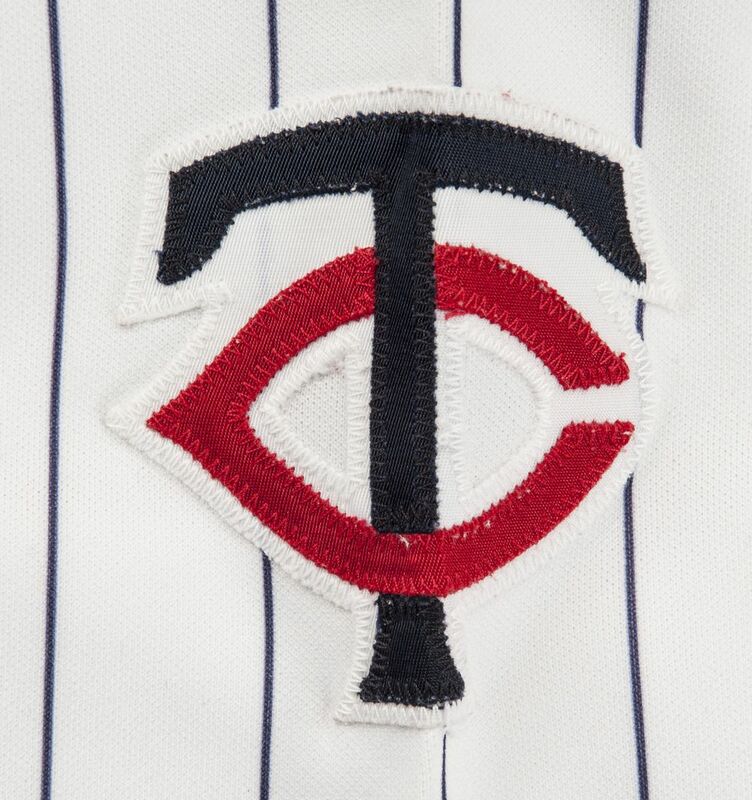 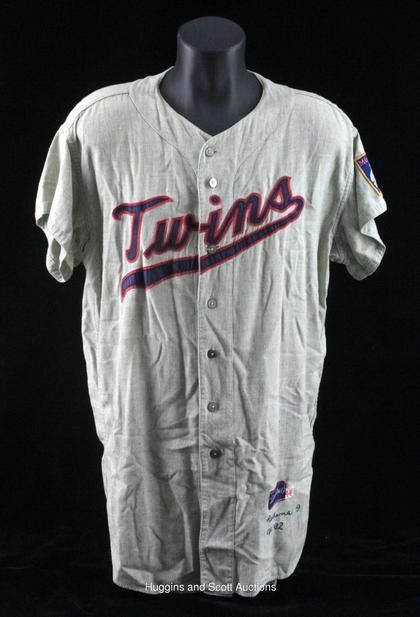 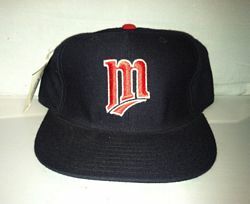 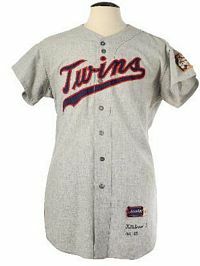 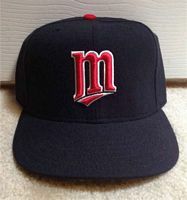 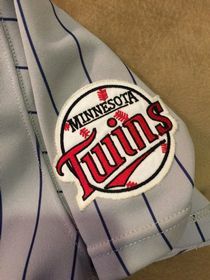 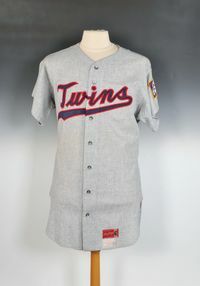 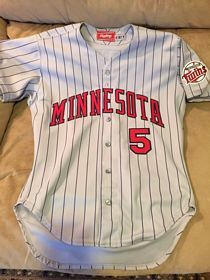 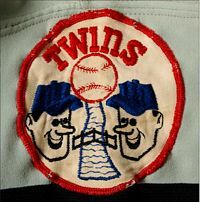 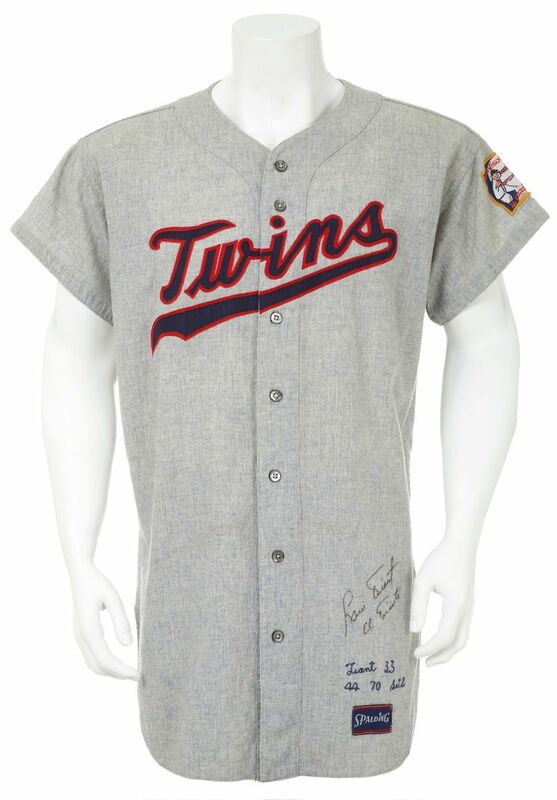 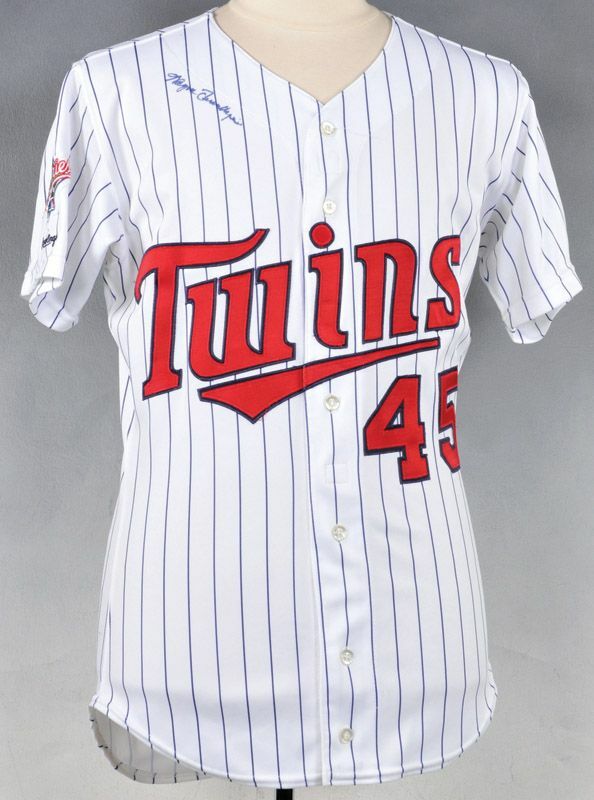 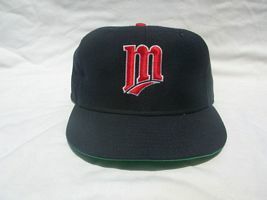 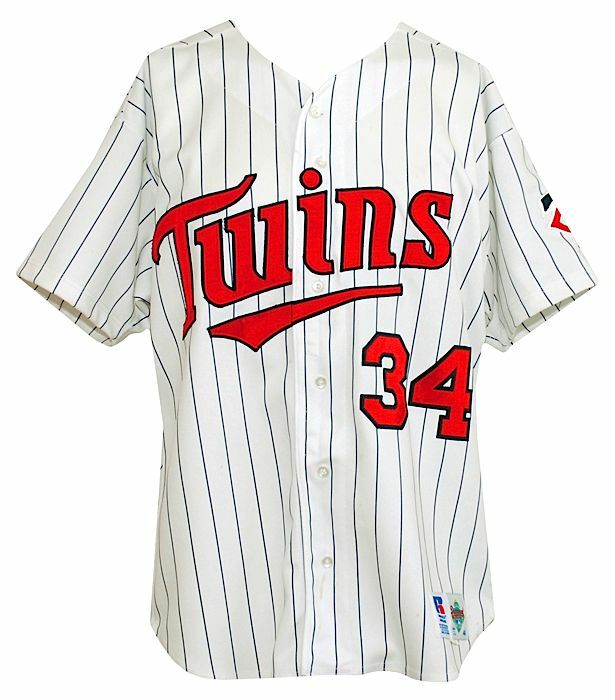 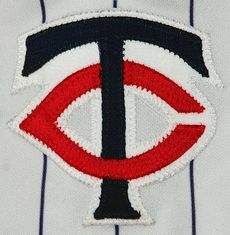 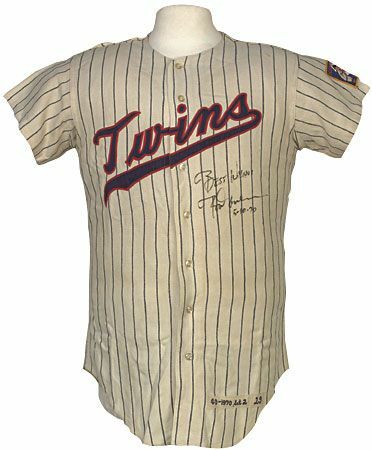 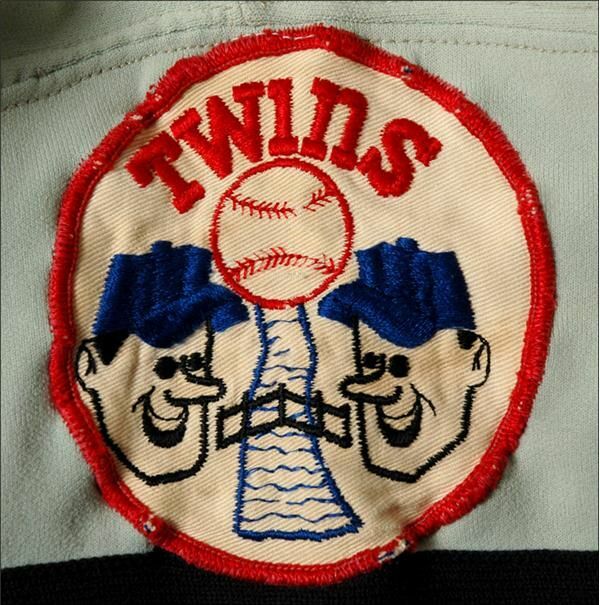 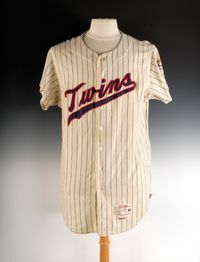 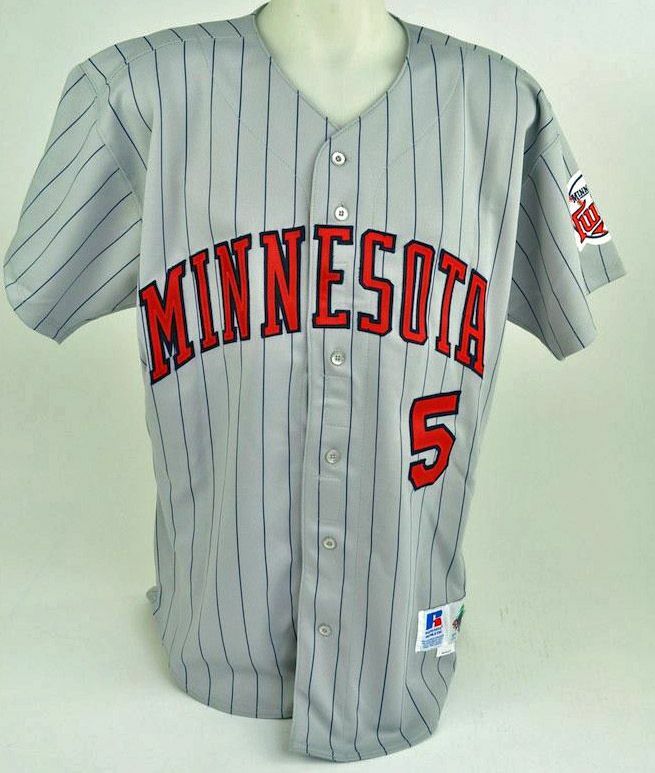 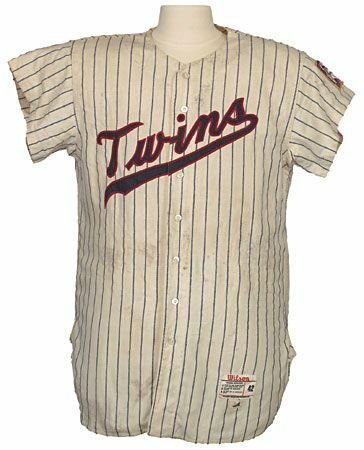 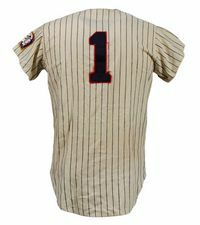 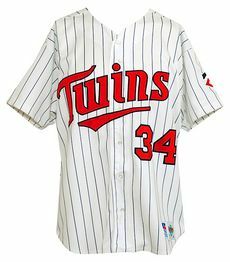 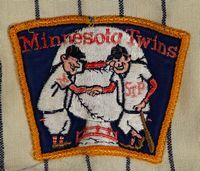 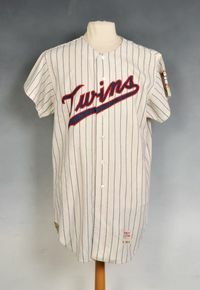 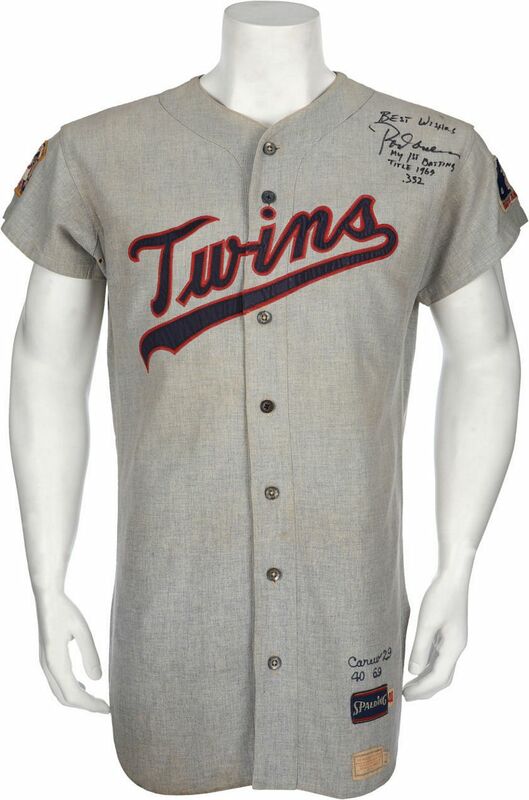 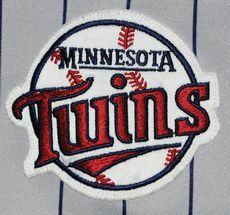 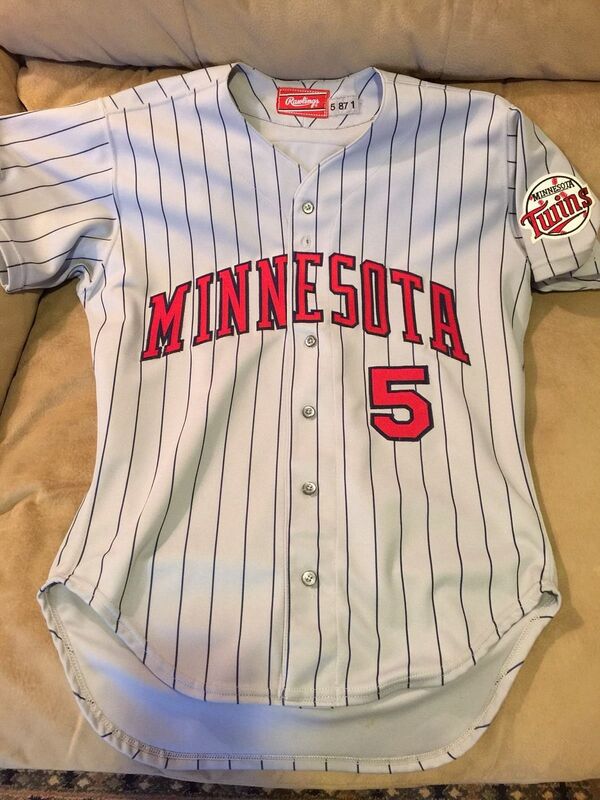 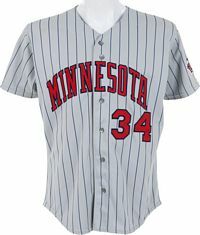 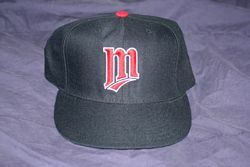 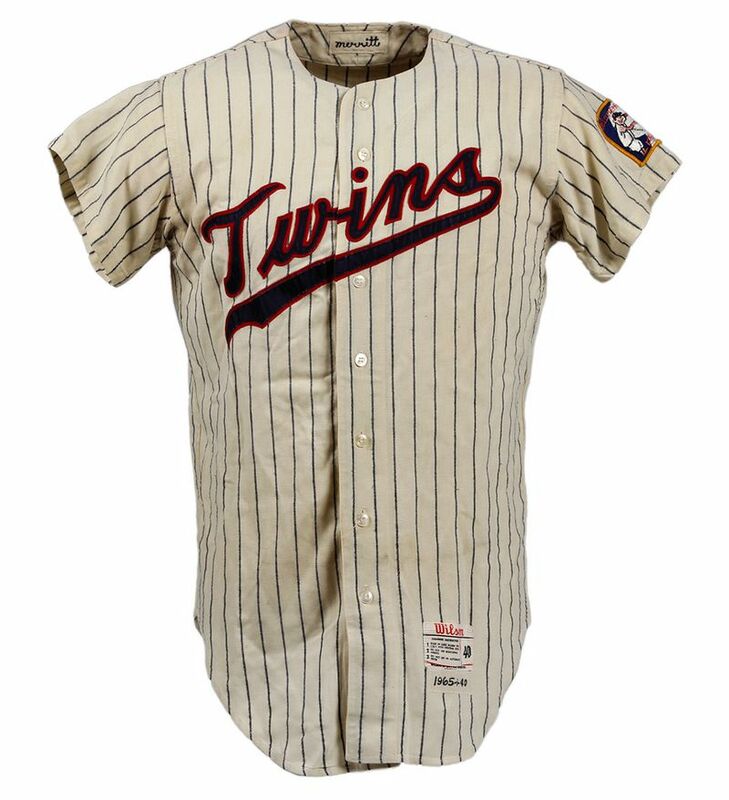 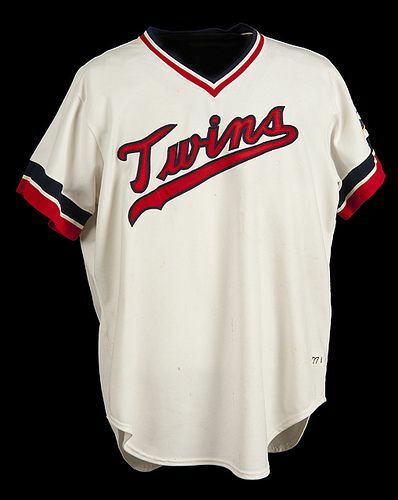 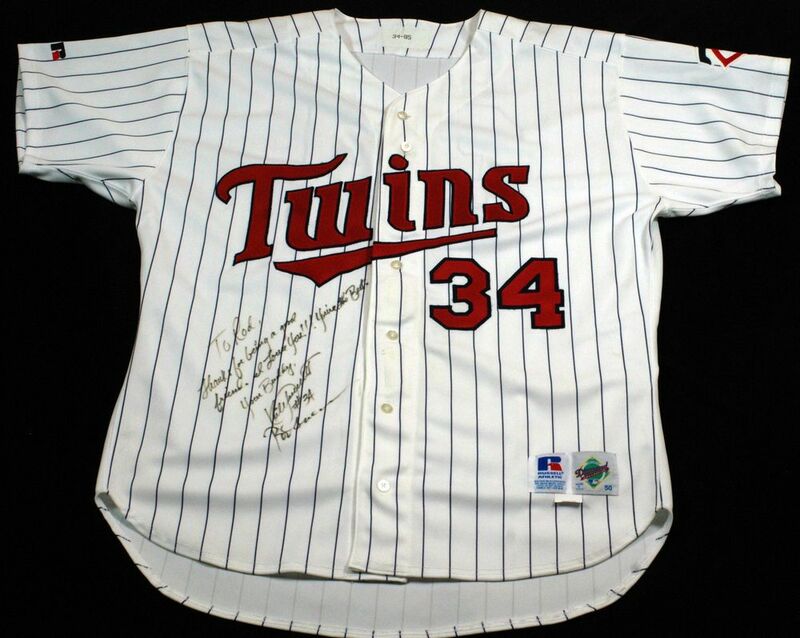 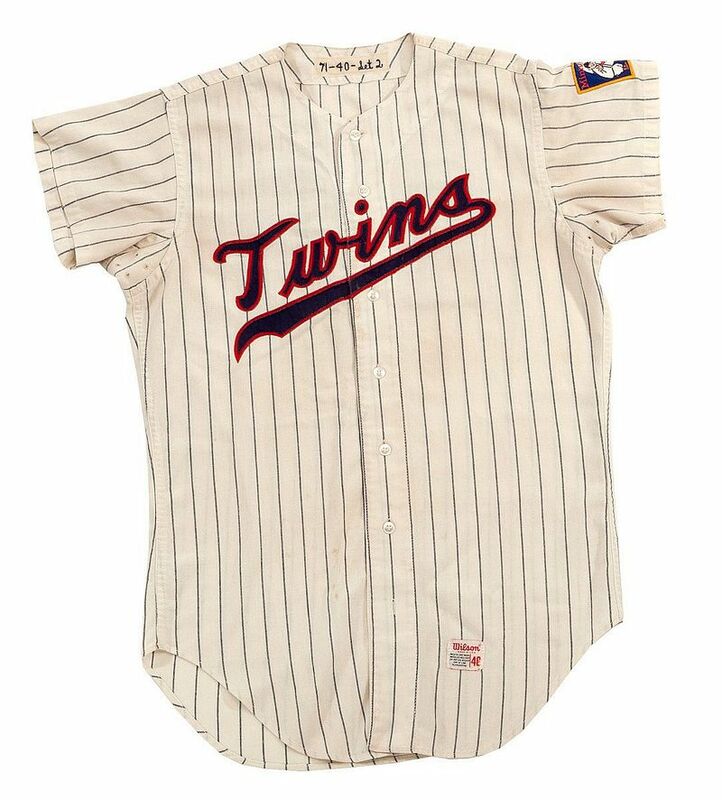 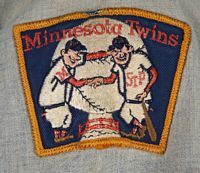 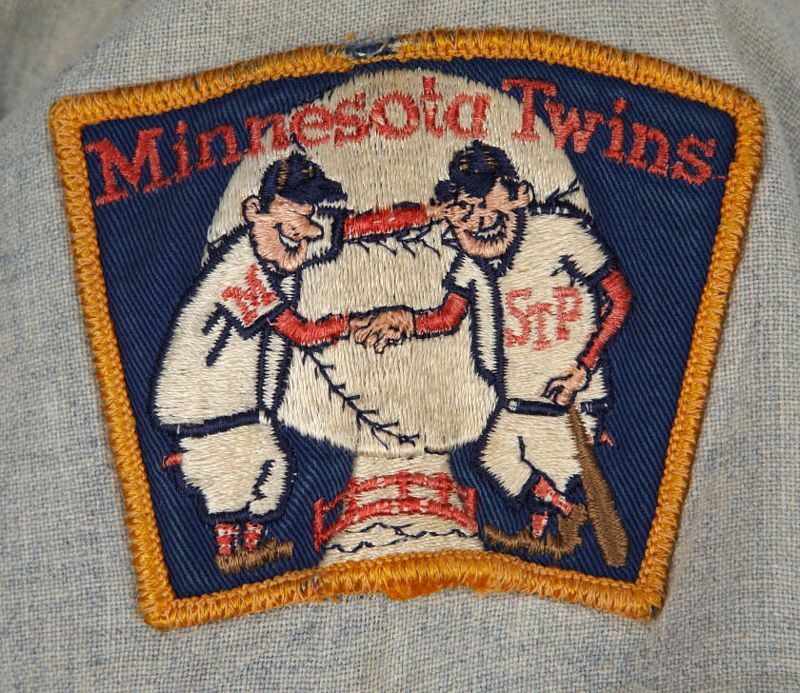 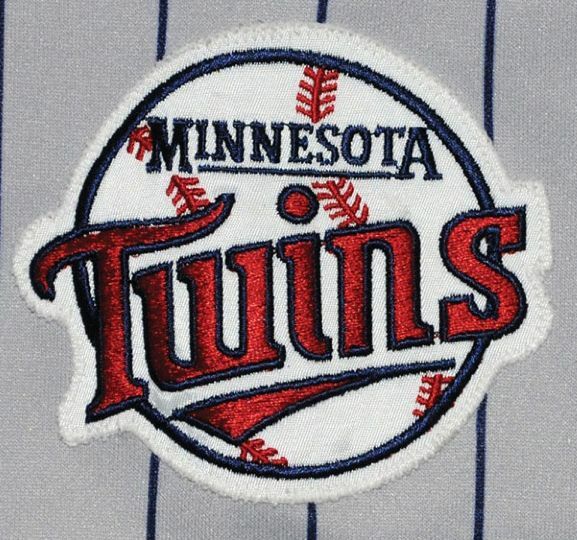 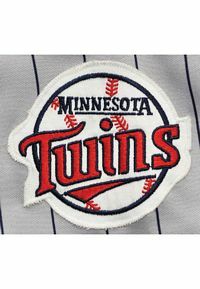 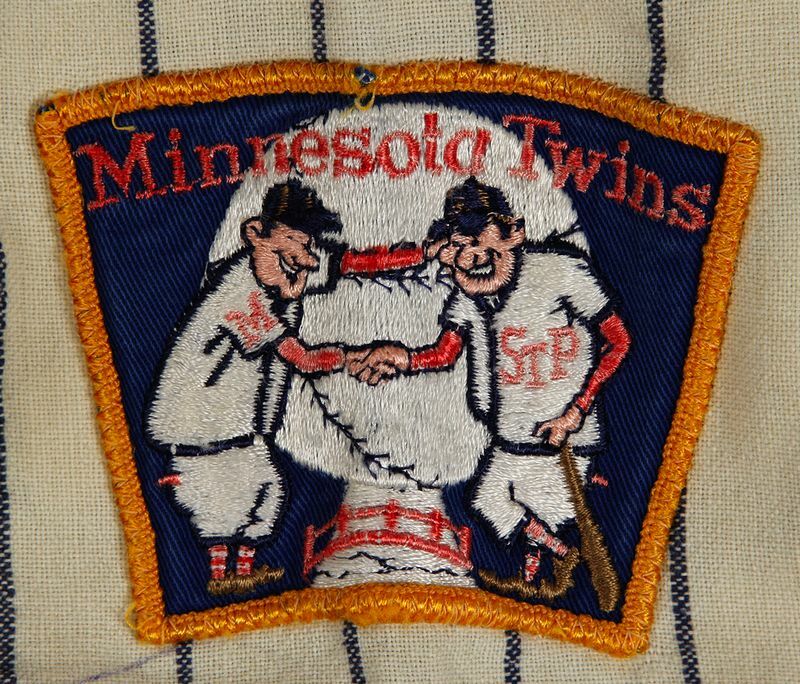 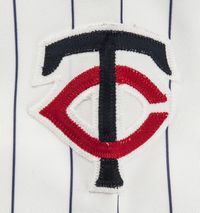 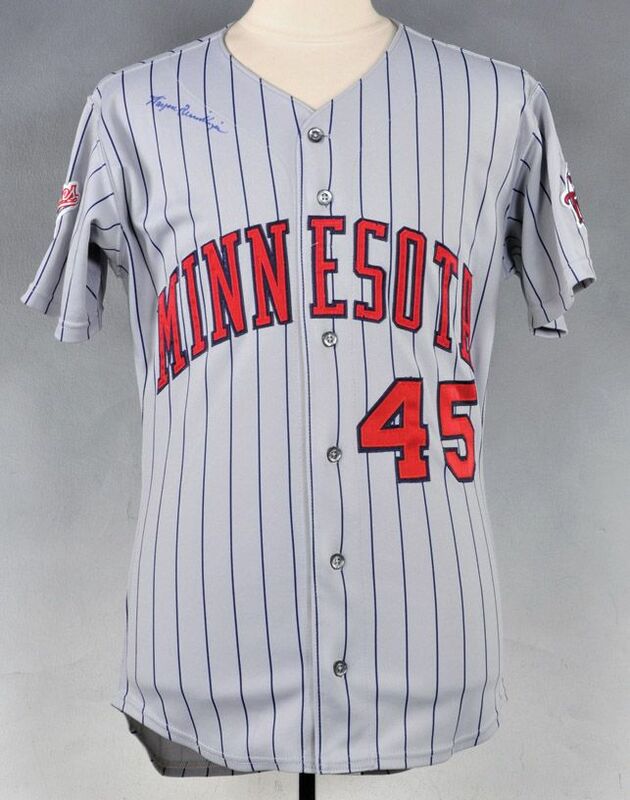 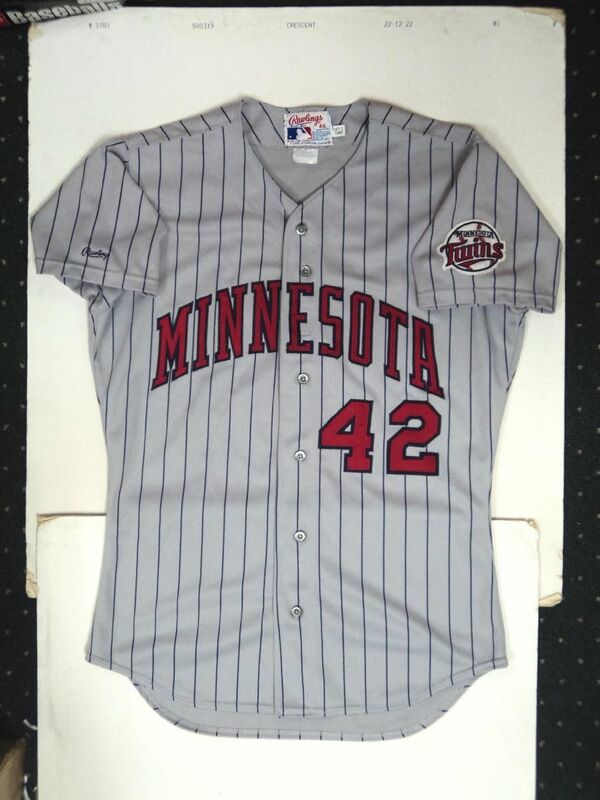 The Twins rebrand themselves, dropping the pullovers, and introducing an "M" logo, finally getting over the stigma that "M" might mean Minneapolis, not Minnesota. 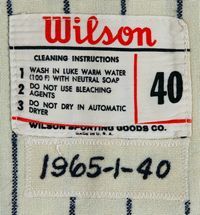 NOB used on road jerseys only.